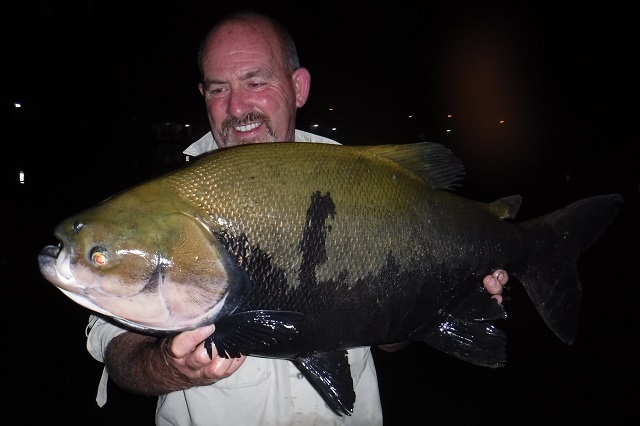 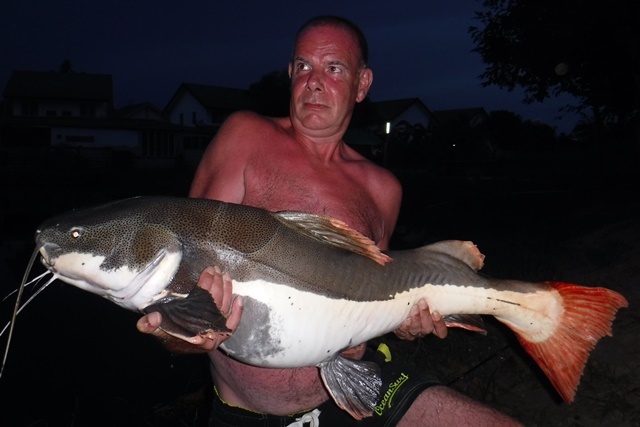 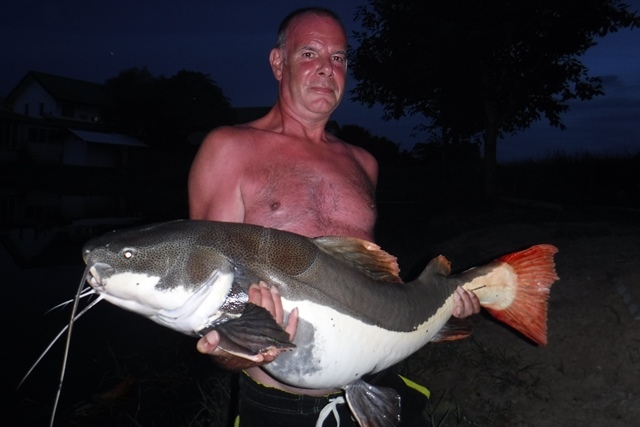 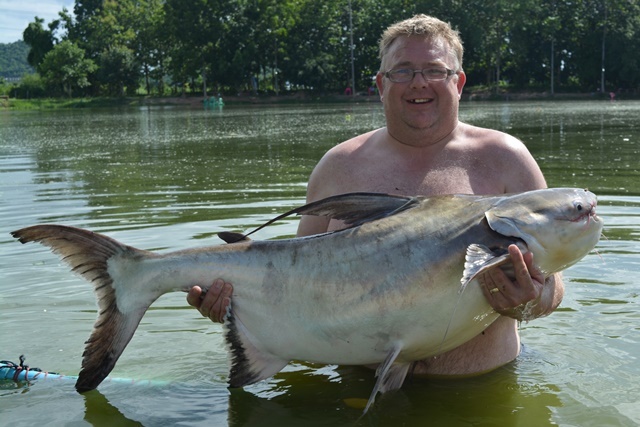 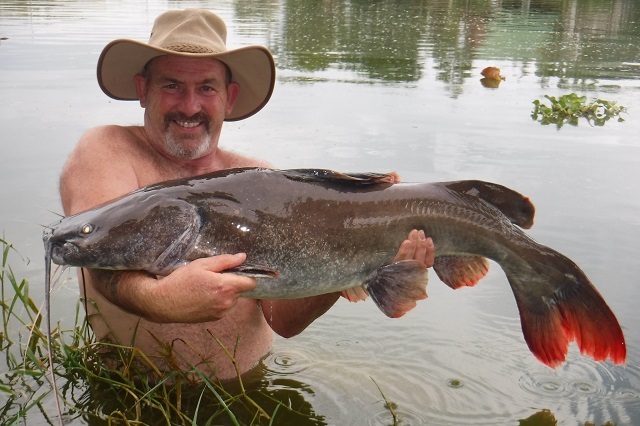 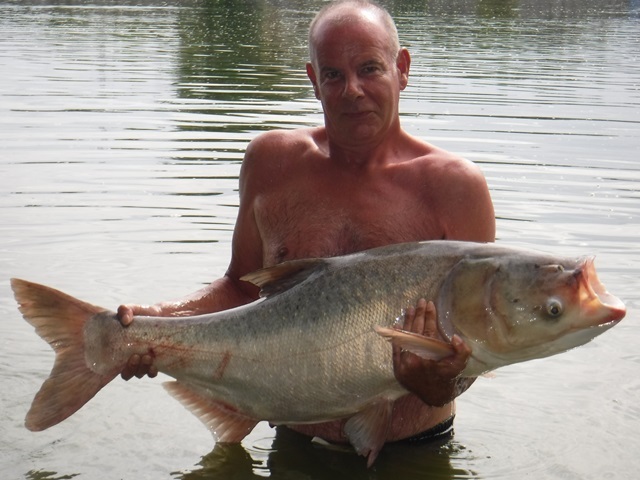 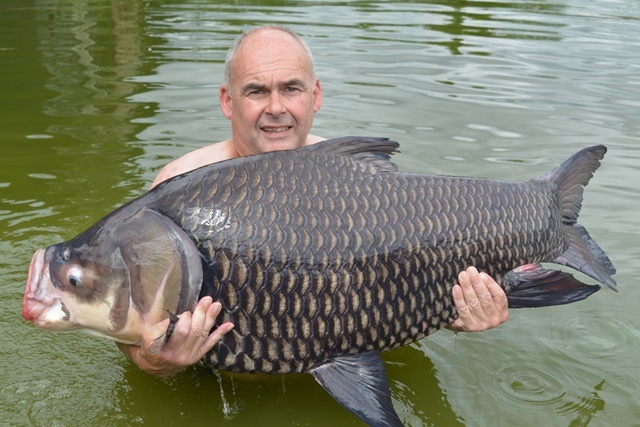 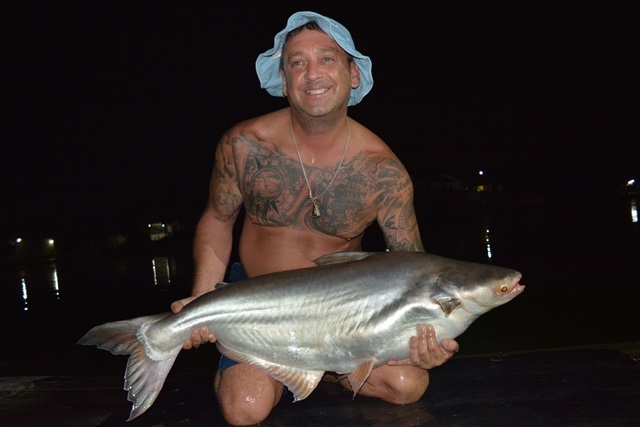 Regular Tim Coakley returned and finally broke his hoodoo by not only beating his Siamese carp pb with a stunning fish of 120lb but also catching a wallago attu a species he had been trying to catch for some time. 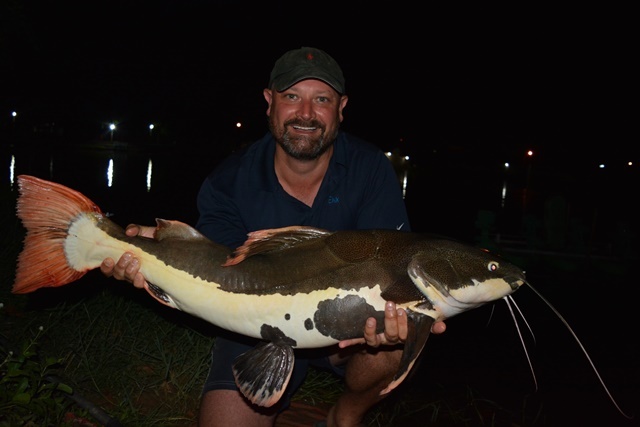 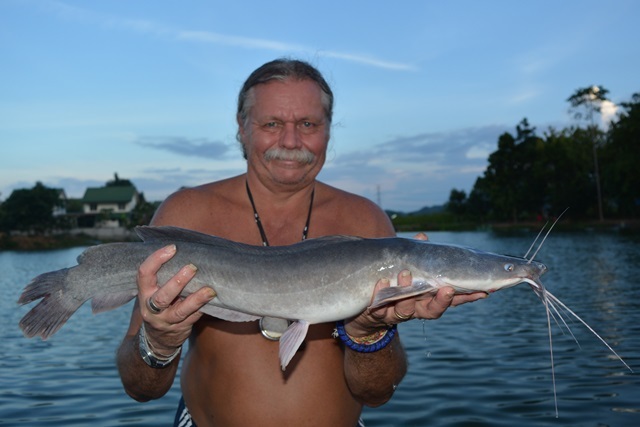 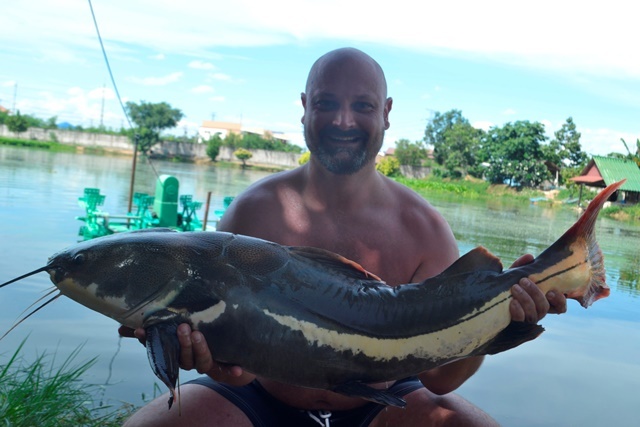 In addition he caught some awesome black shark minnow and bearded labeo as well as big-Y catfish, Mekong catfish, and a number of both Thai and Amazon redtails. 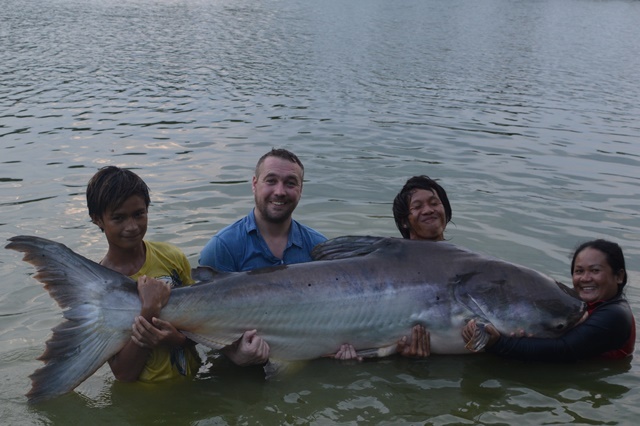 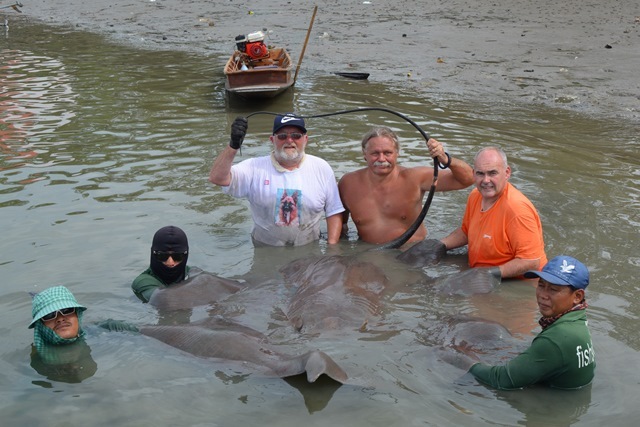 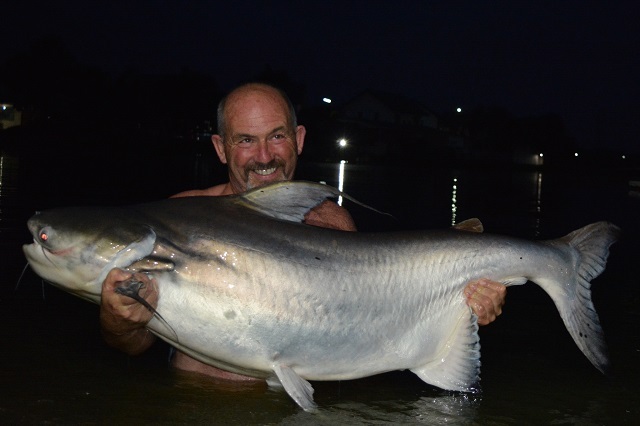 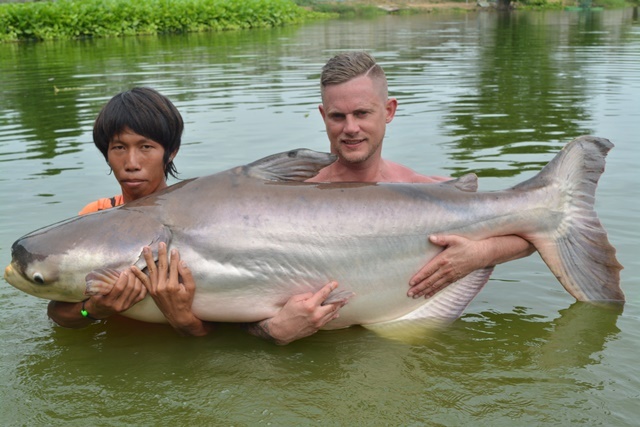 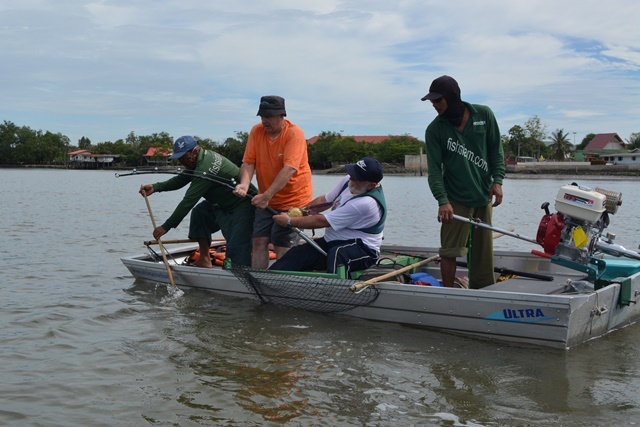 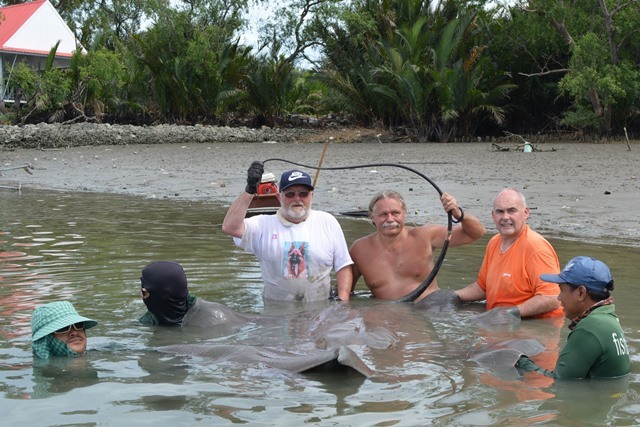 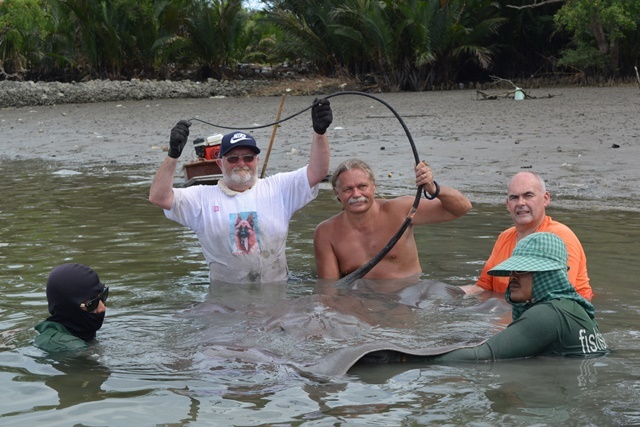 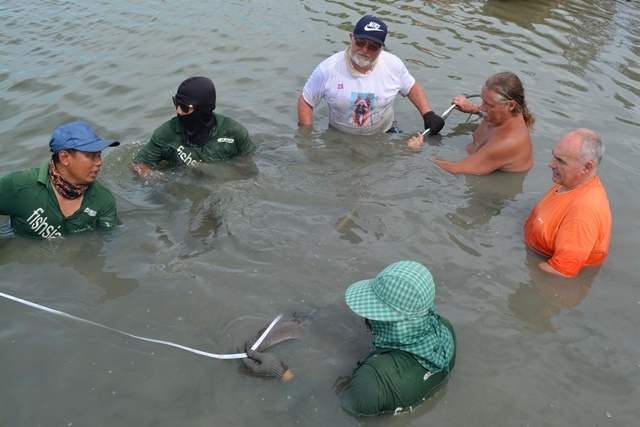 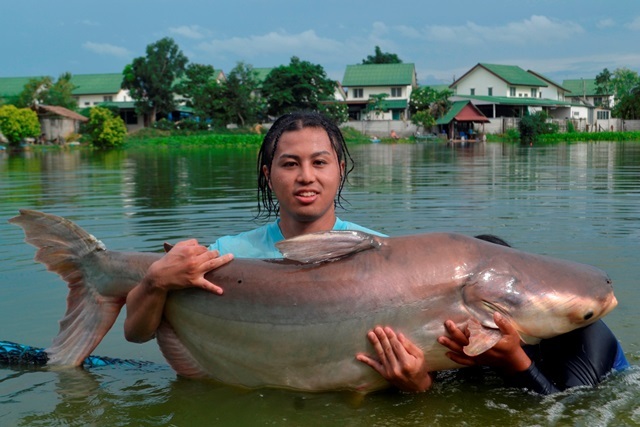 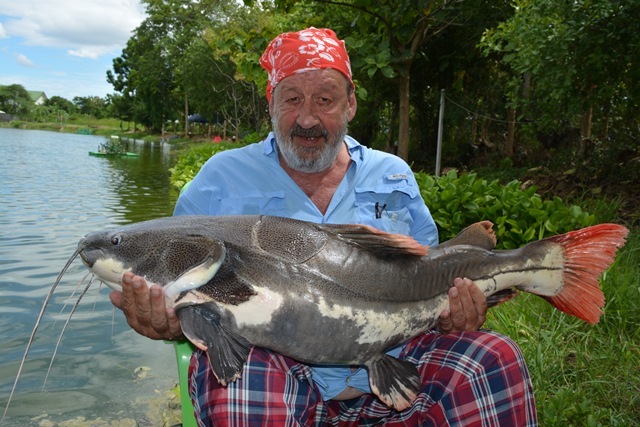 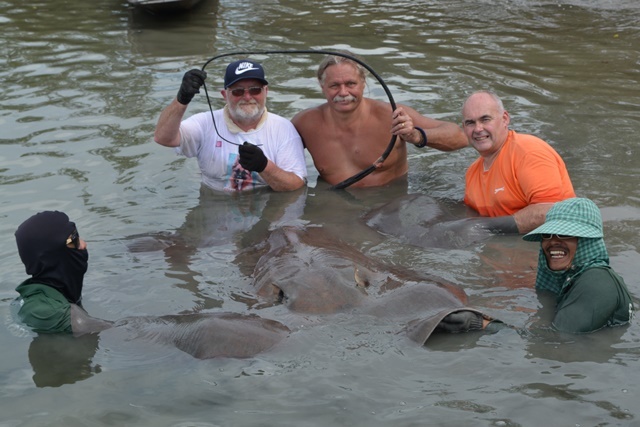 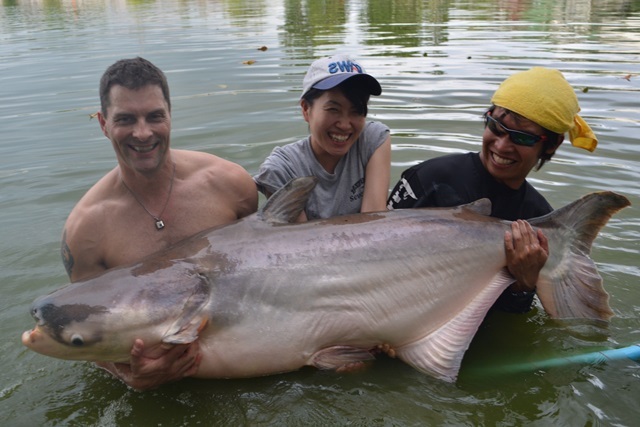 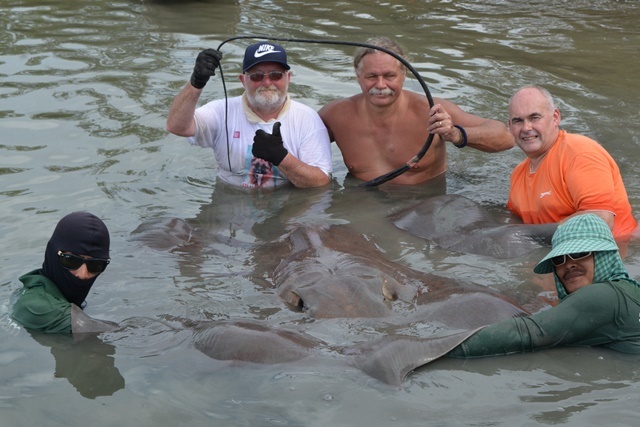 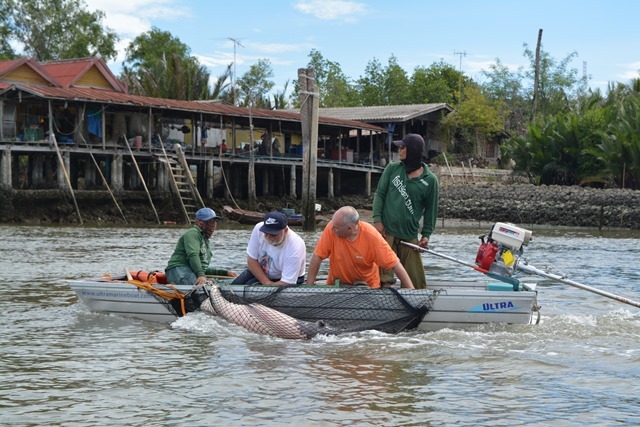 Micky Quayle and Eddie Stephenson tried their hand at giant freshwater stingray fishing on the mighty Mae Klong River and after a lengthy tussle, they managed by a joint effort to land an impressive 350lb+ river monster. 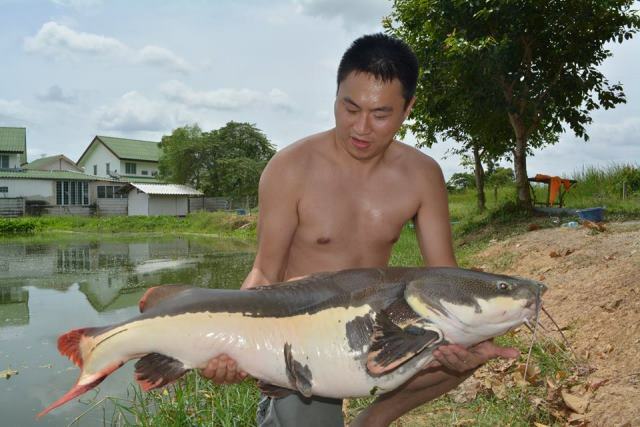 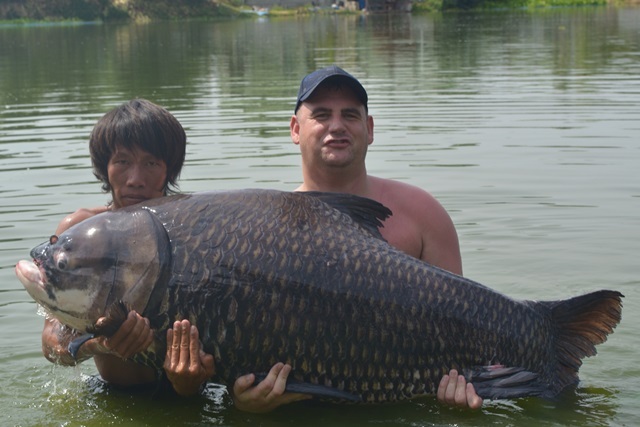 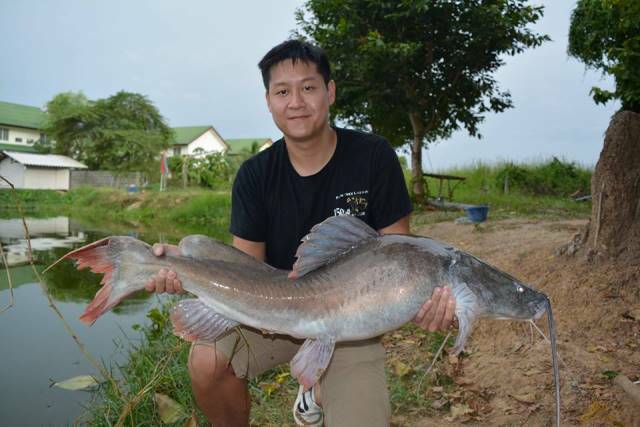 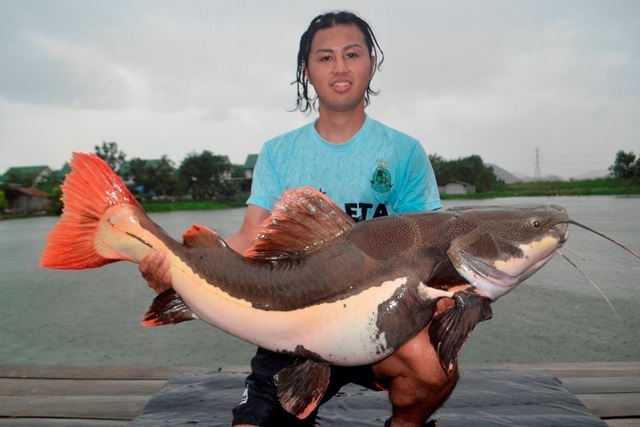 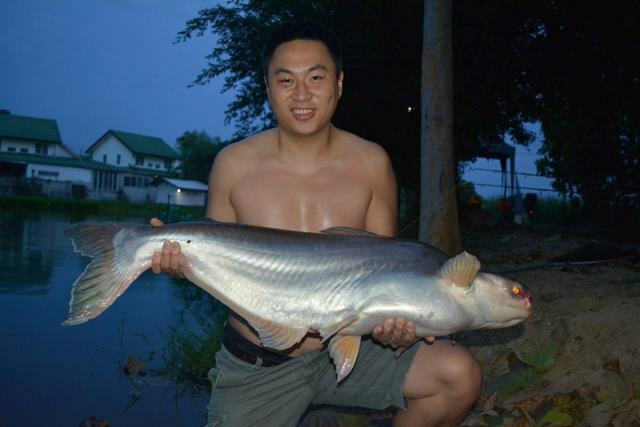 Daniel Tan was back for his second visit of the year this time accompanied by a fishing buddy and they successfully caught a Palm Tree Lagoon 150lb Carp Club qualifying Siamese, as well as a stunning Asian redtailed catfish, black shark minnow, Amazon redtail and striped catfish. 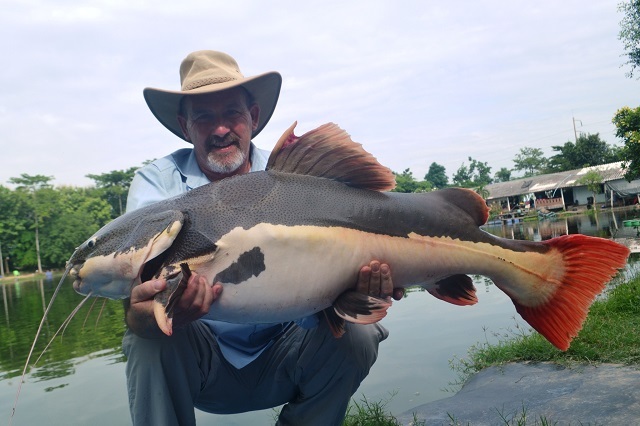 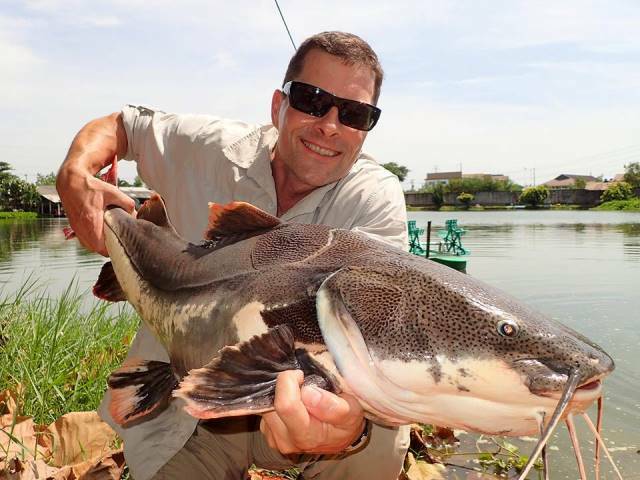 Tap of Bangkok Guiding Service returned for his second visit of the month with customer Warren Rickard who caught an awesome 50lb+ Juliens golden price carp, as well as a plump Mekong catfish and Amazon redtail. 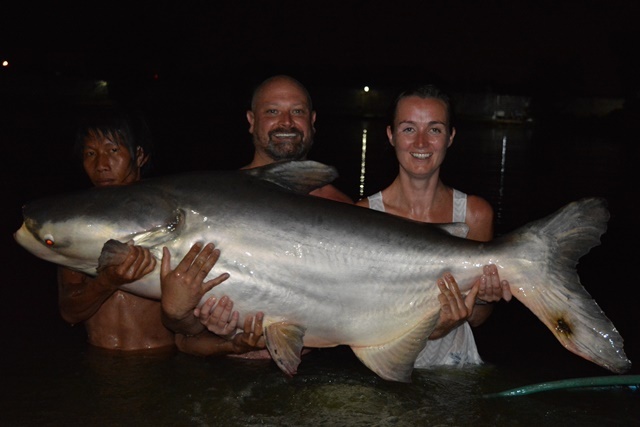 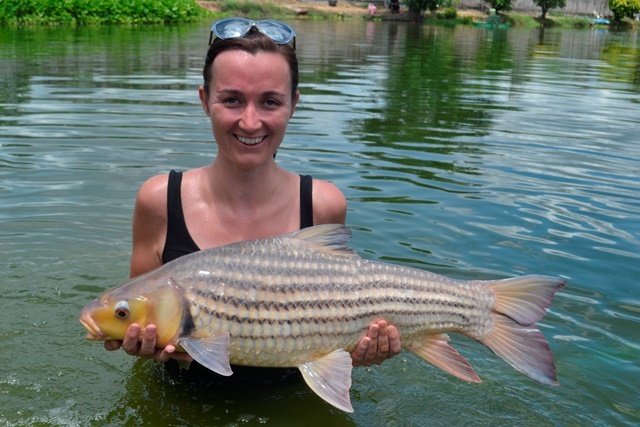 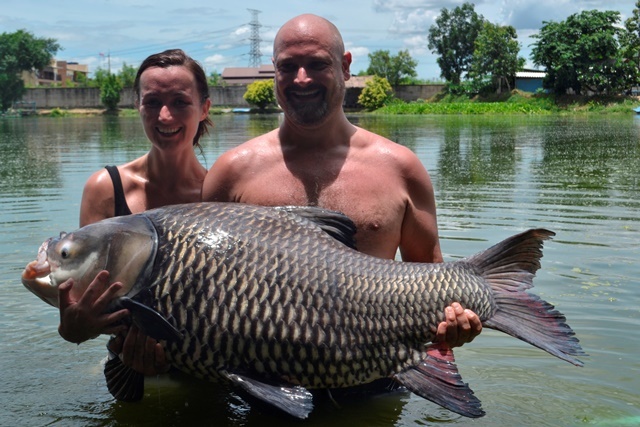 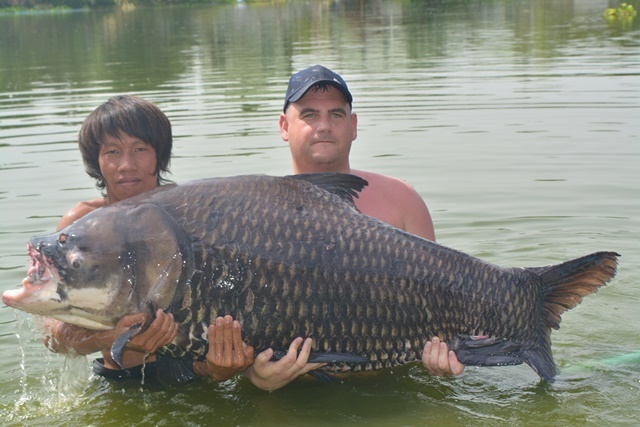 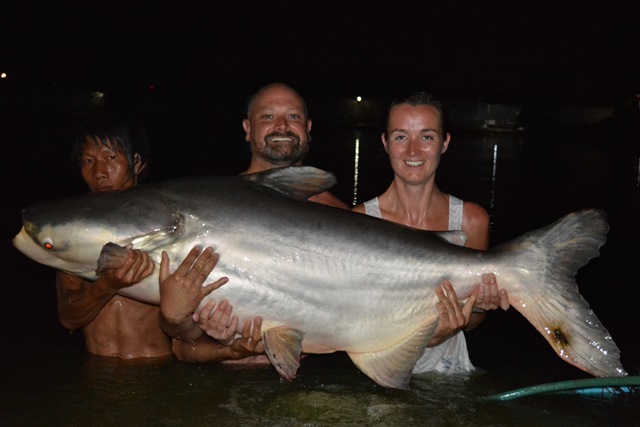 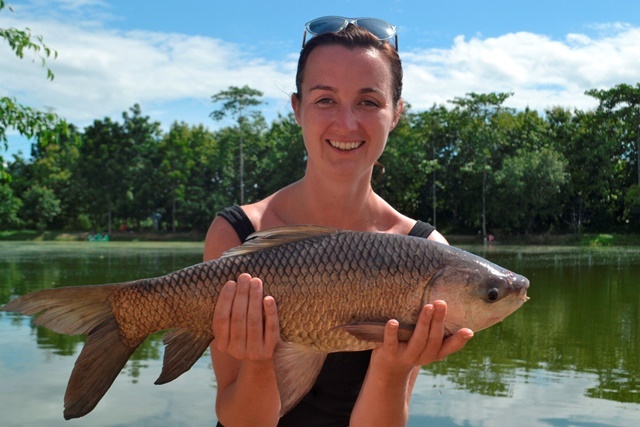 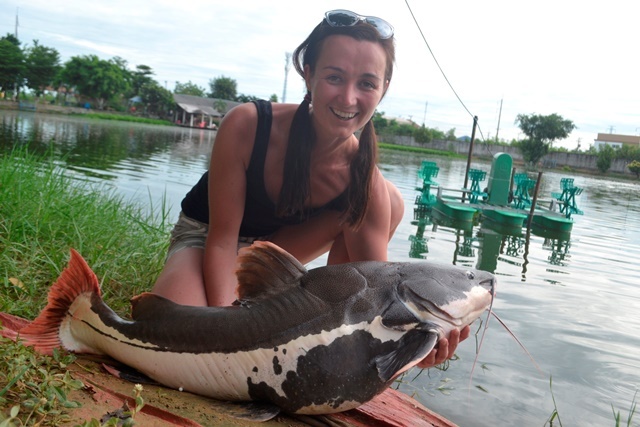 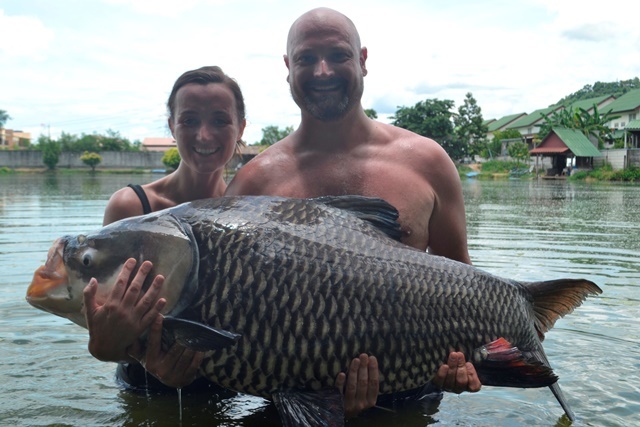 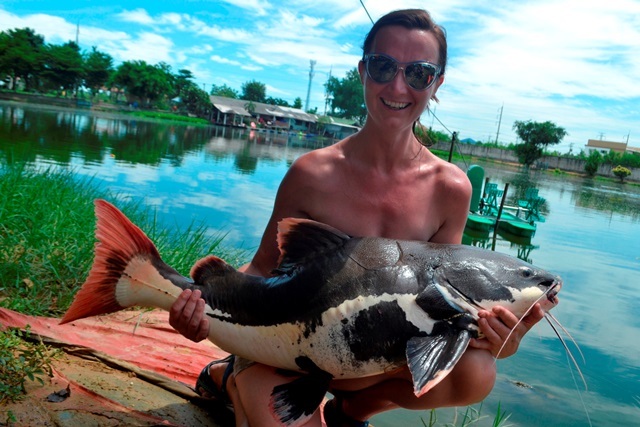 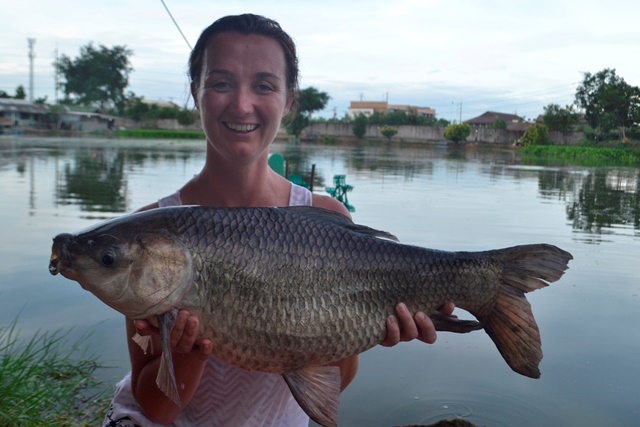 Jennifer Doheny caught an amazing variety on her first visit topped off by a 120lb Siamese carp. 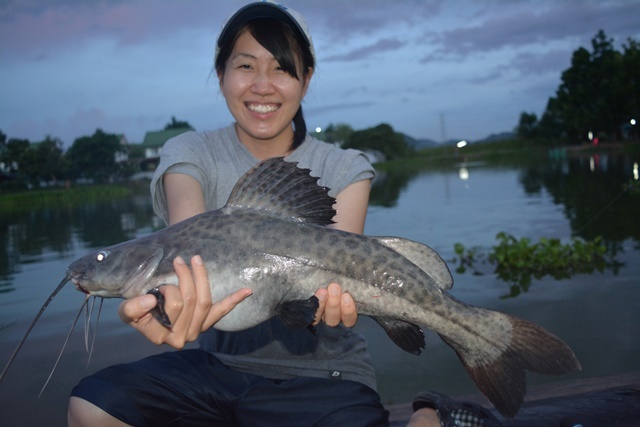 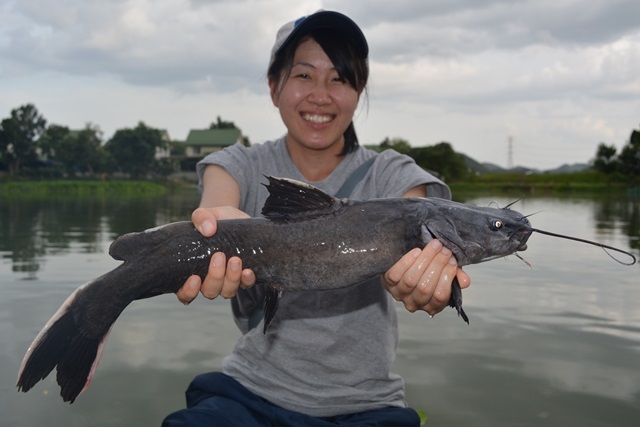 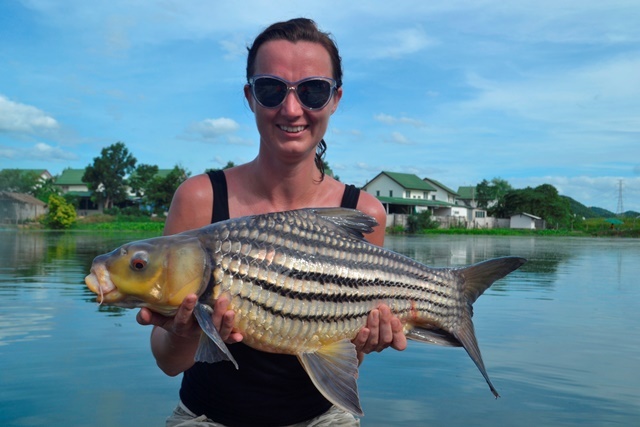 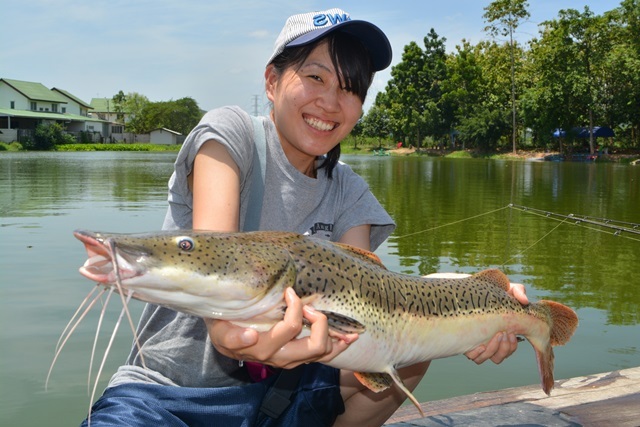 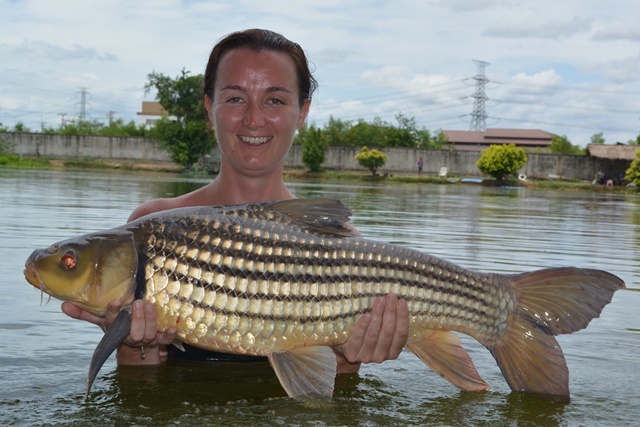 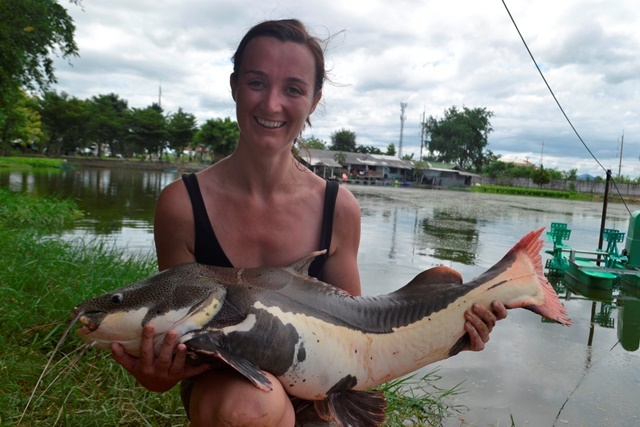 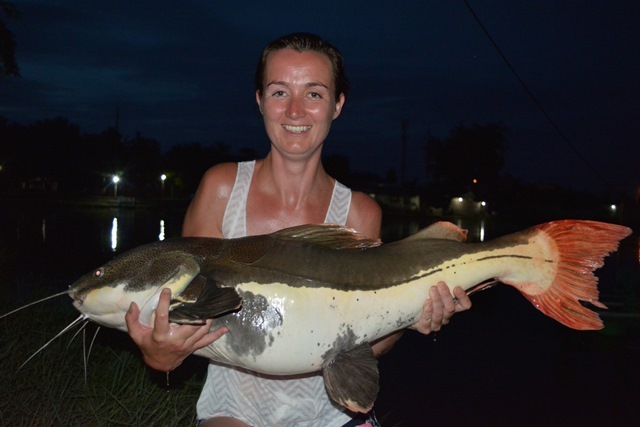 In addition to this awesome catch she also caught a number of Juliens golden price carp, Mekong catfish, rohu, arapaima, and both Asian and Amazon redtail. 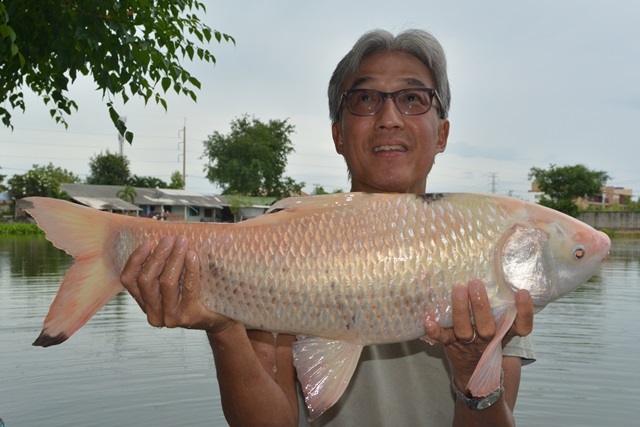 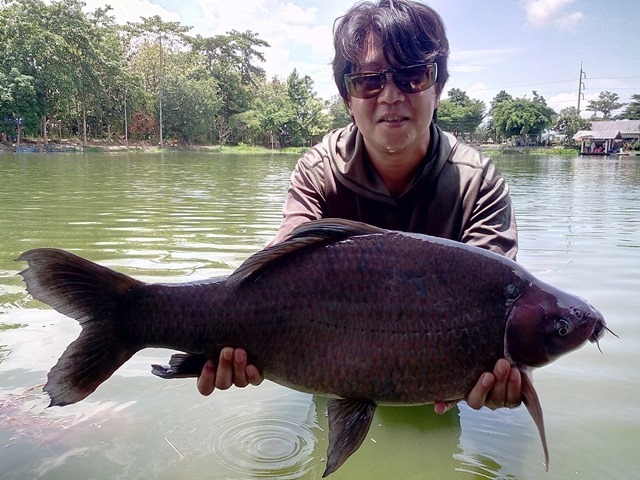 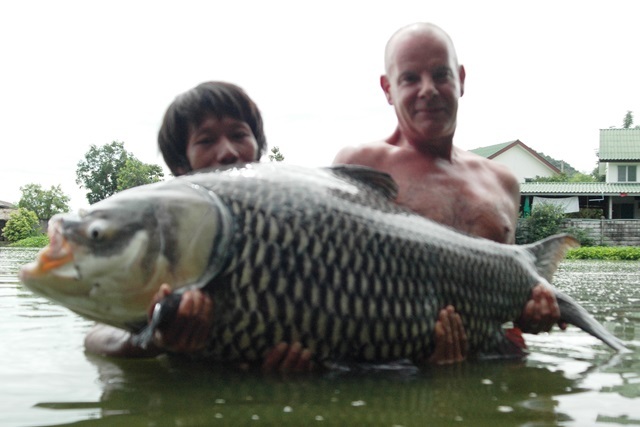 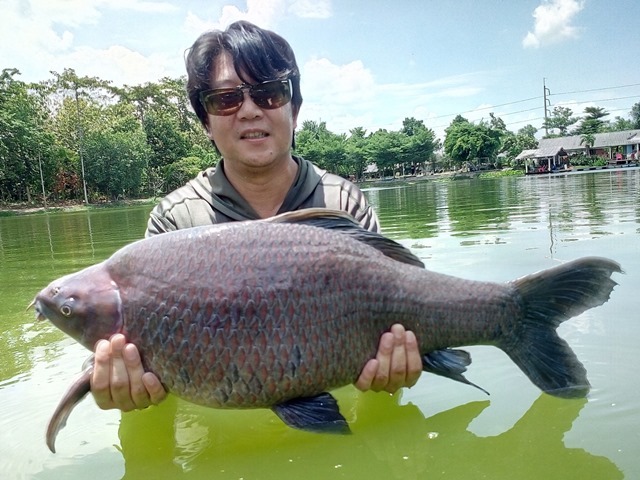 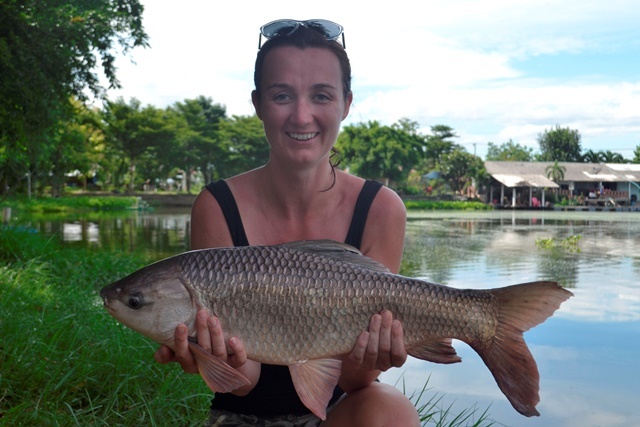 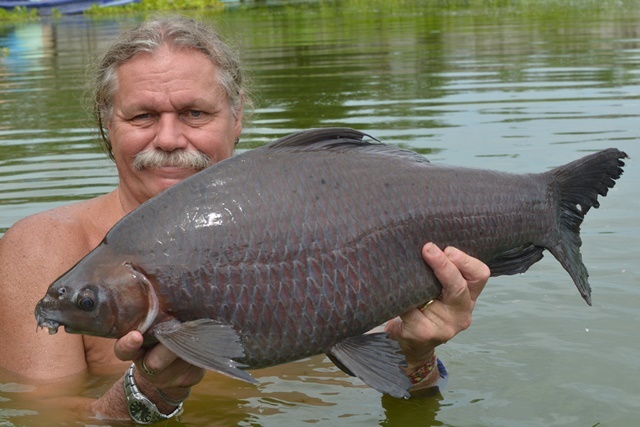 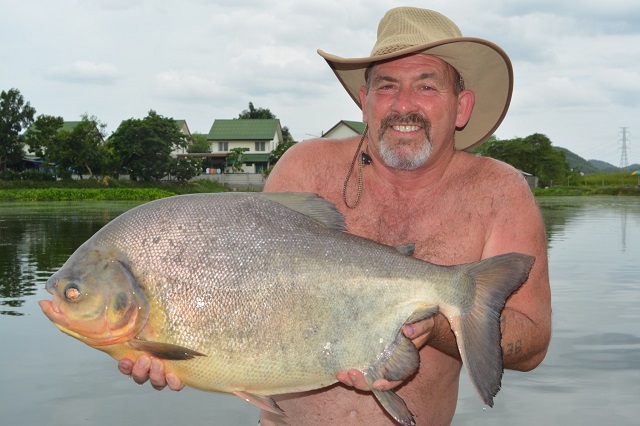 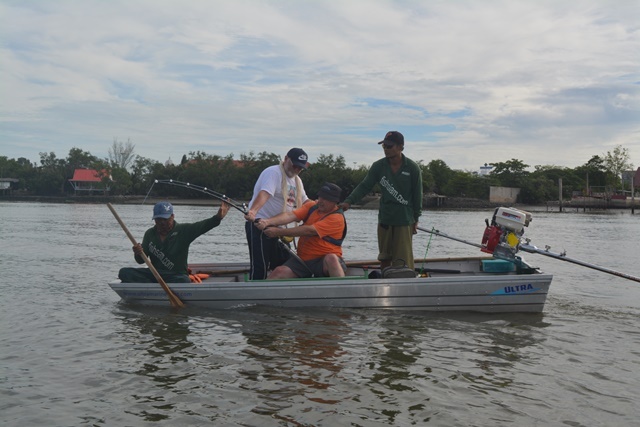 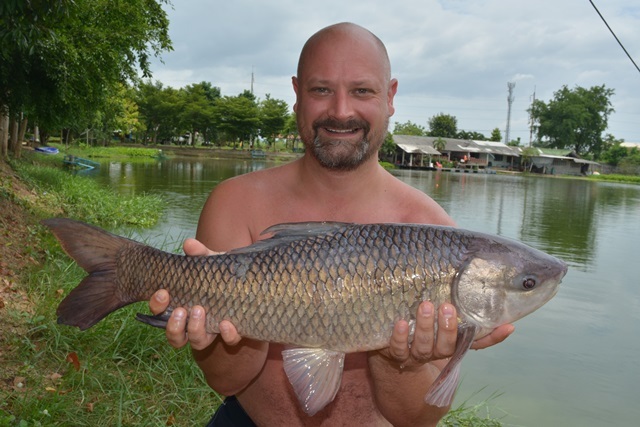 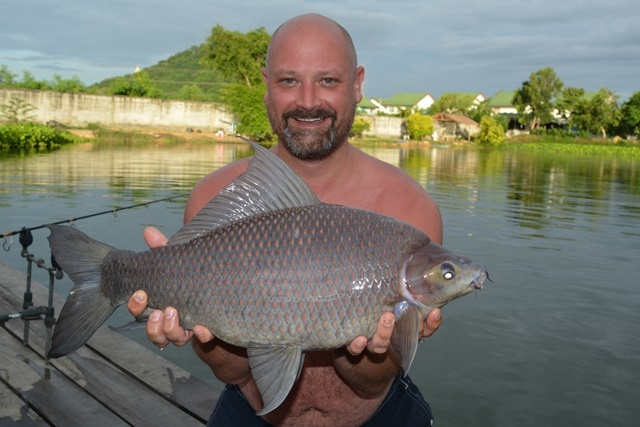 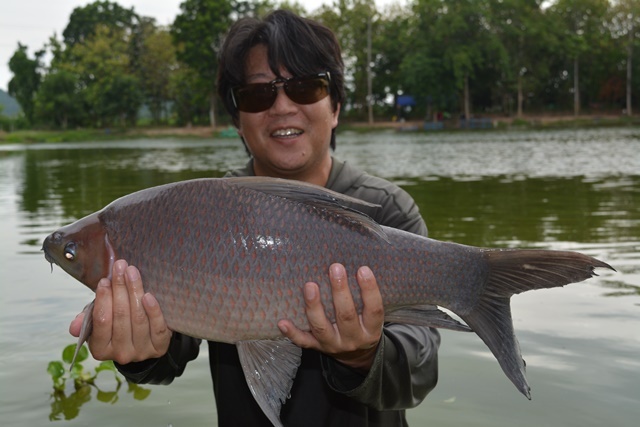 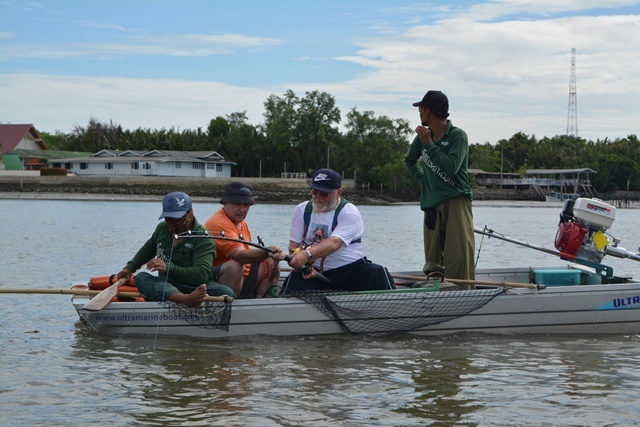 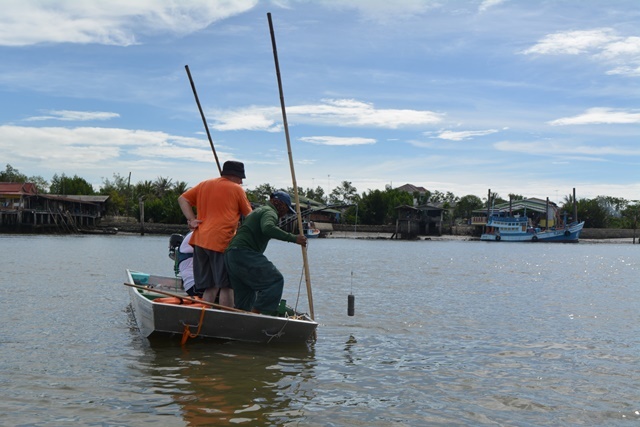 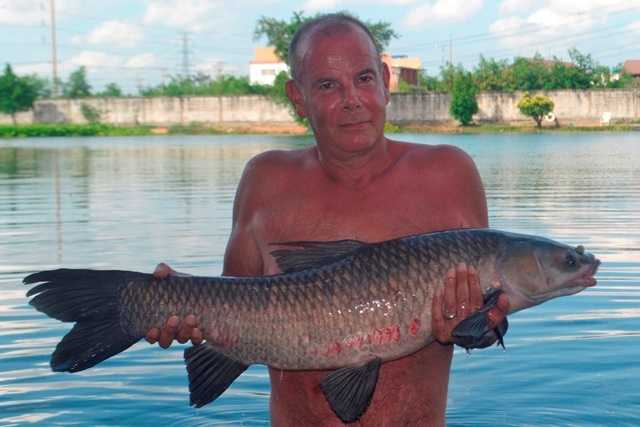 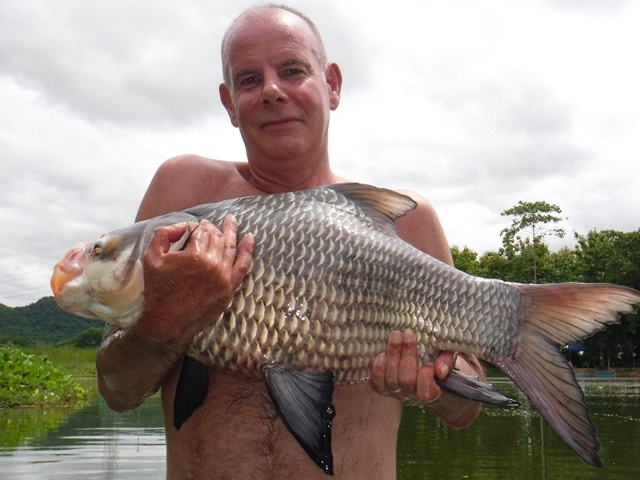 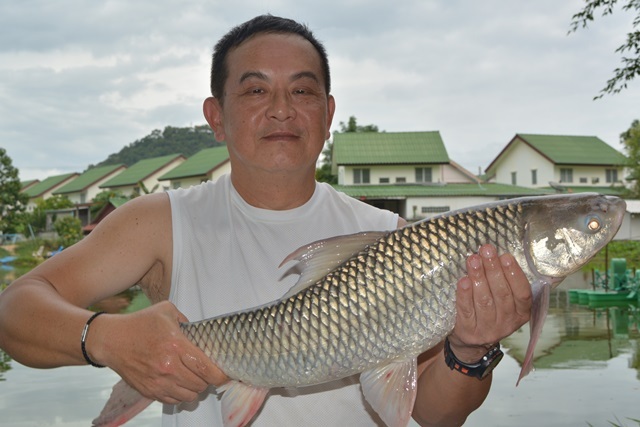 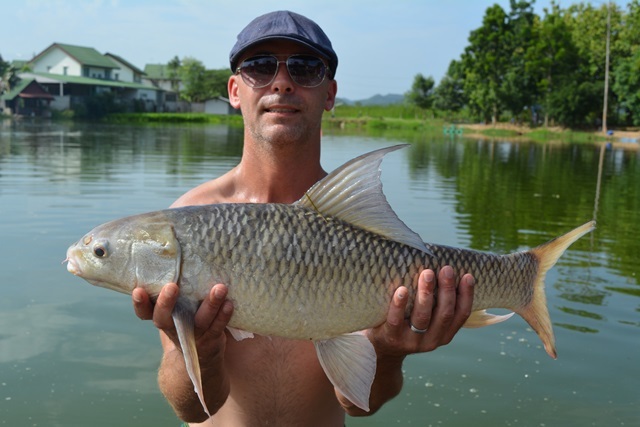 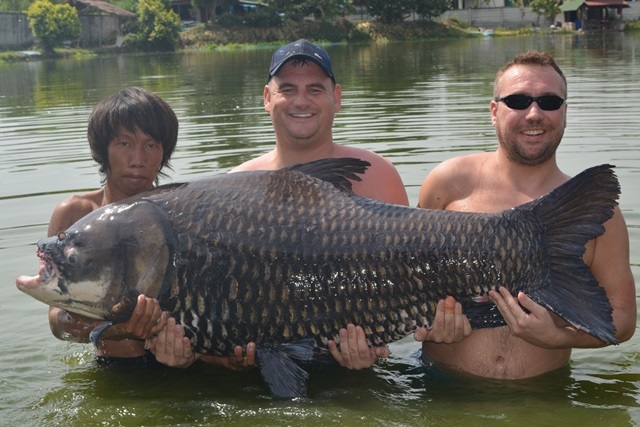 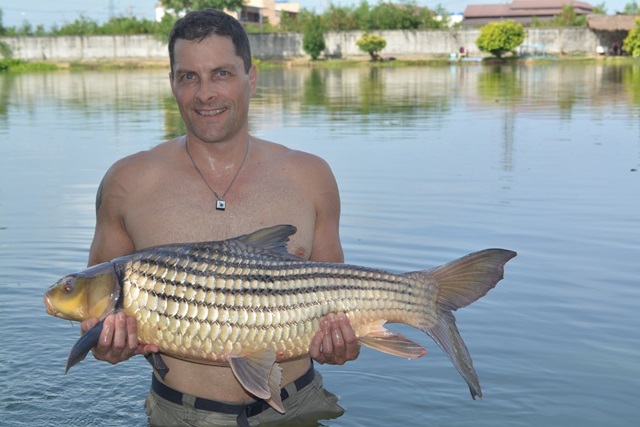 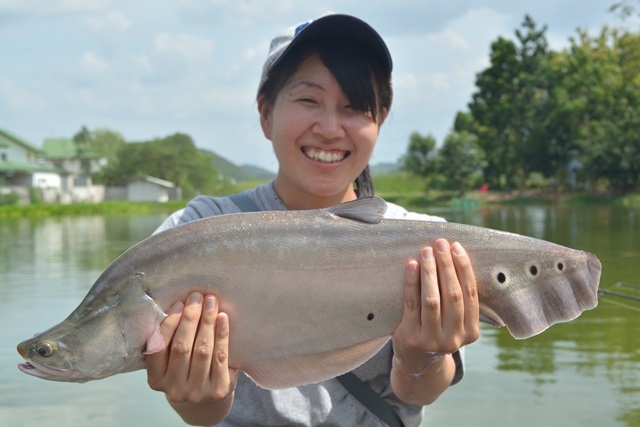 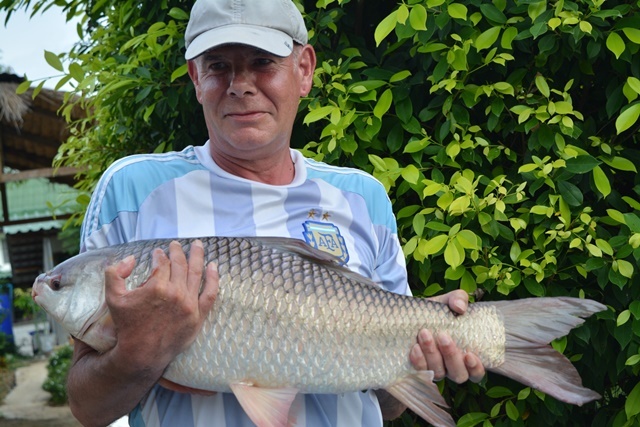 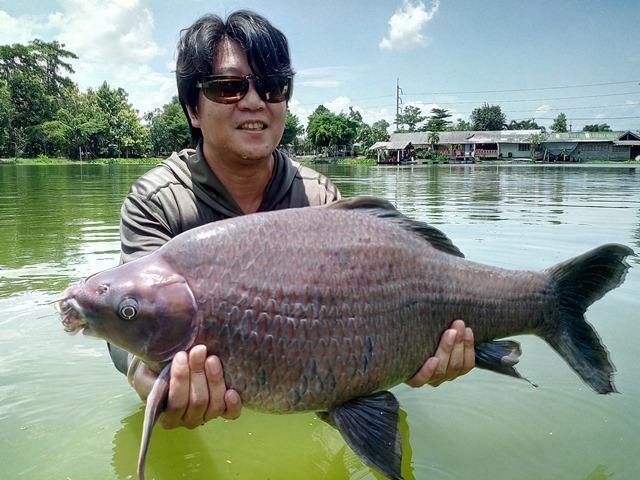 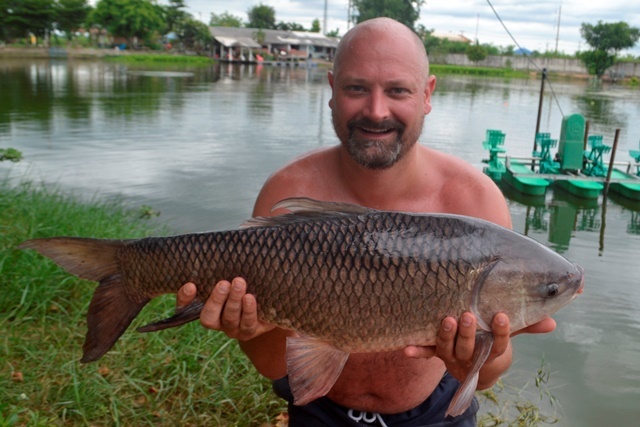 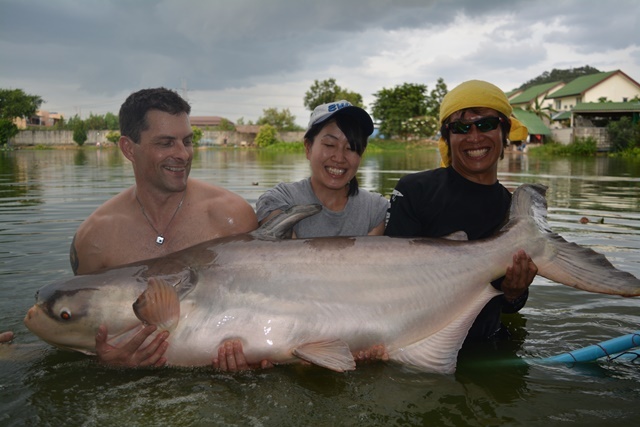 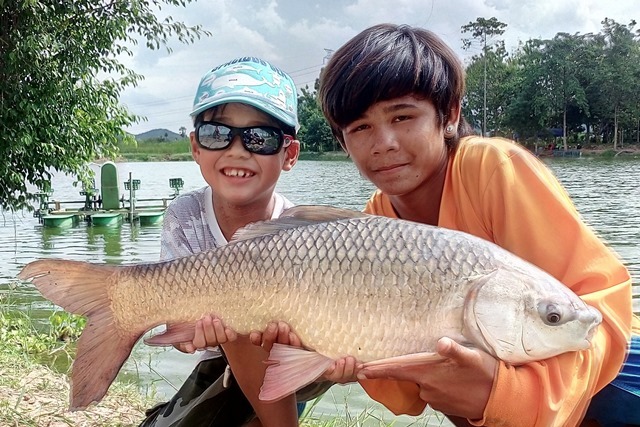 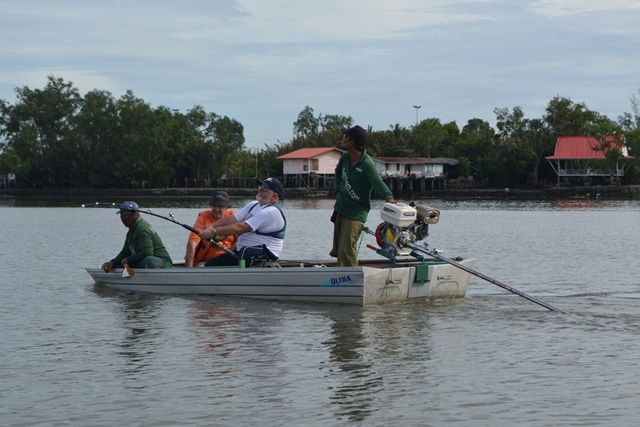 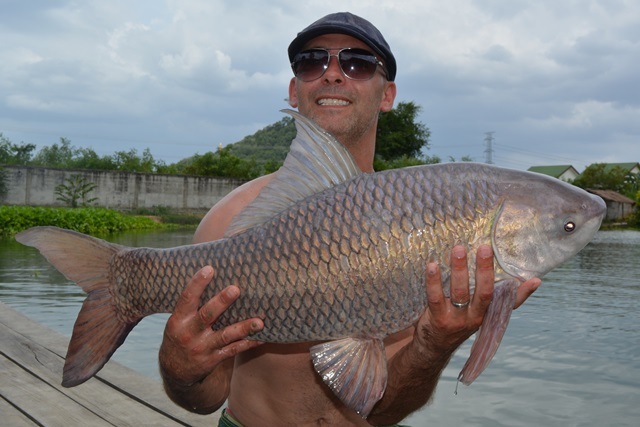 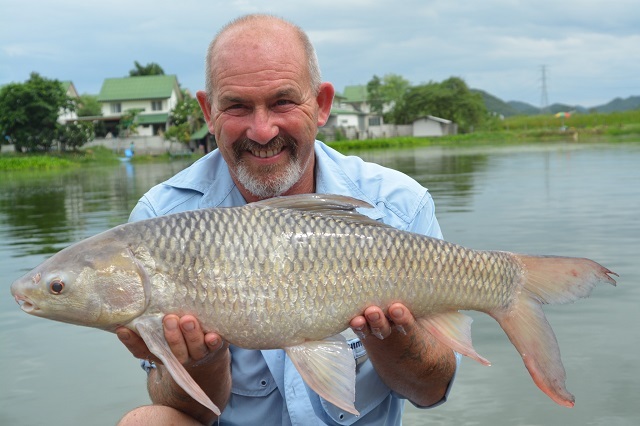 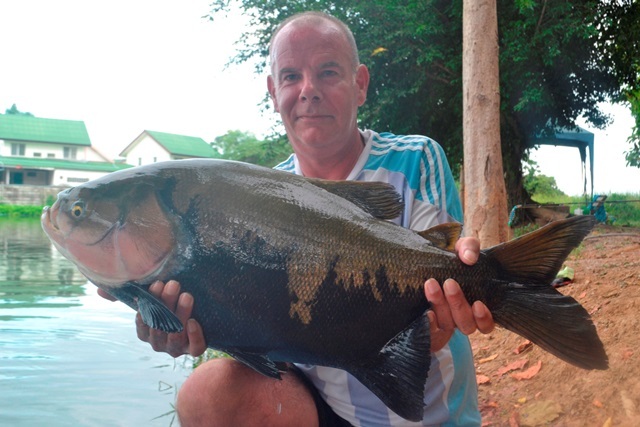 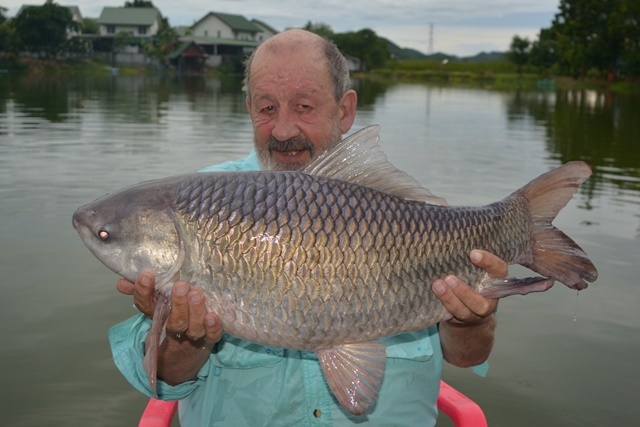 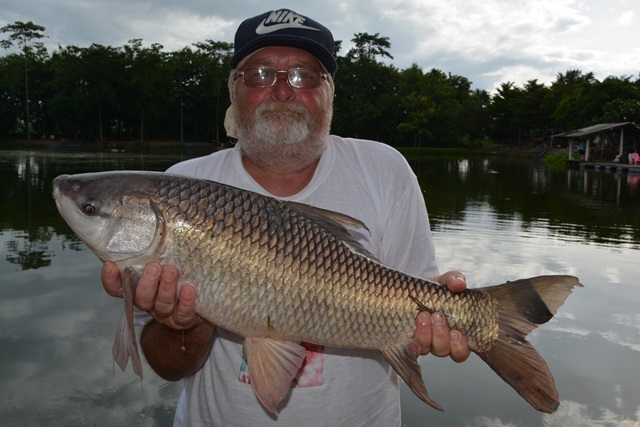 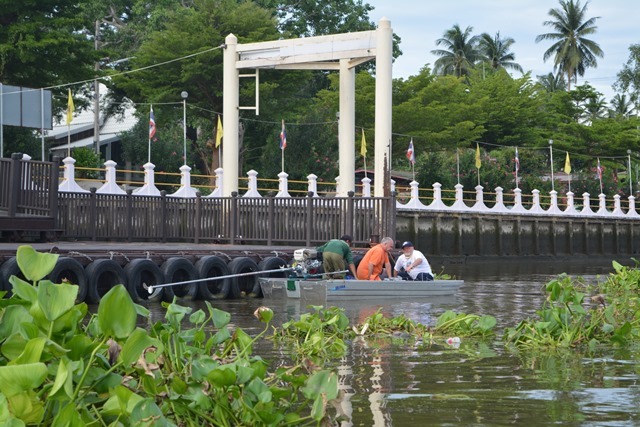 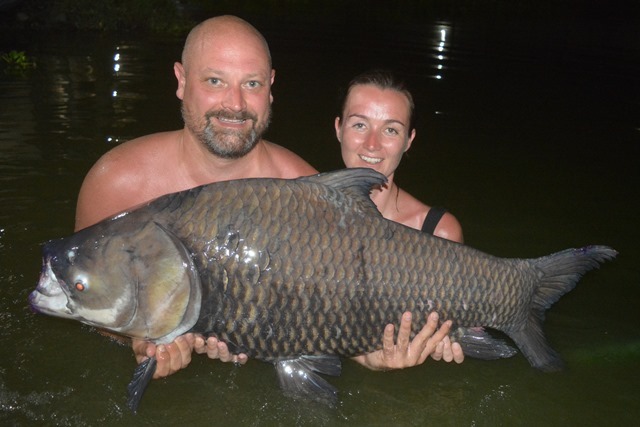 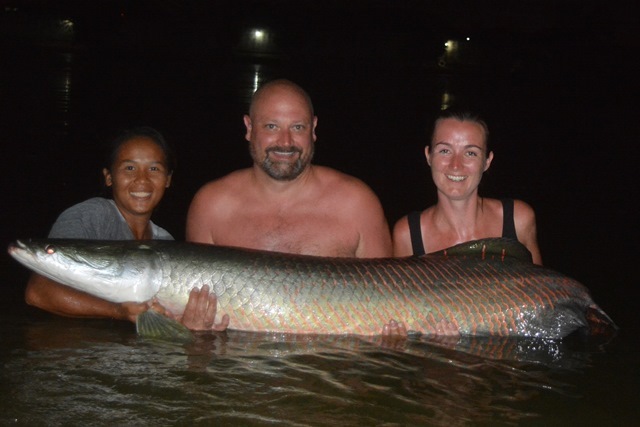 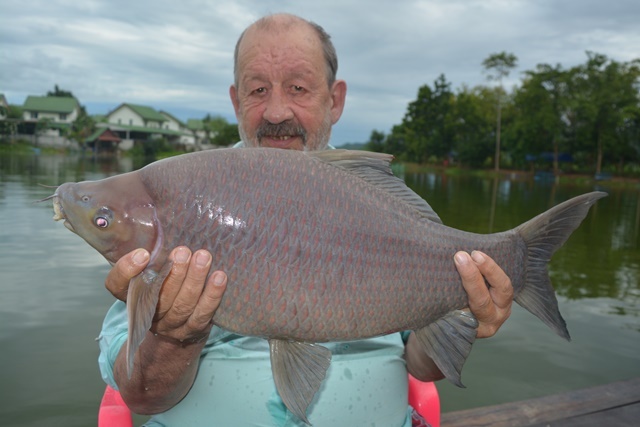 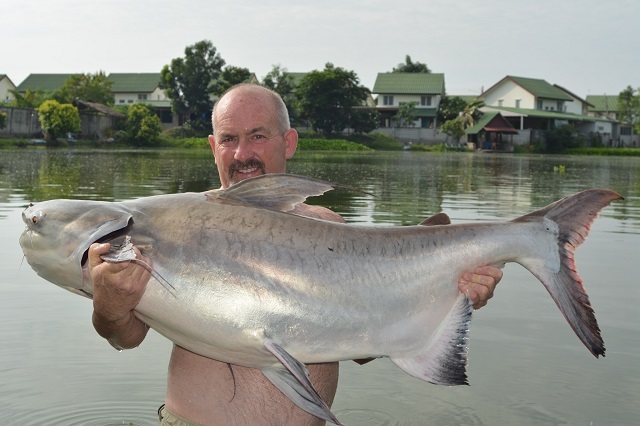 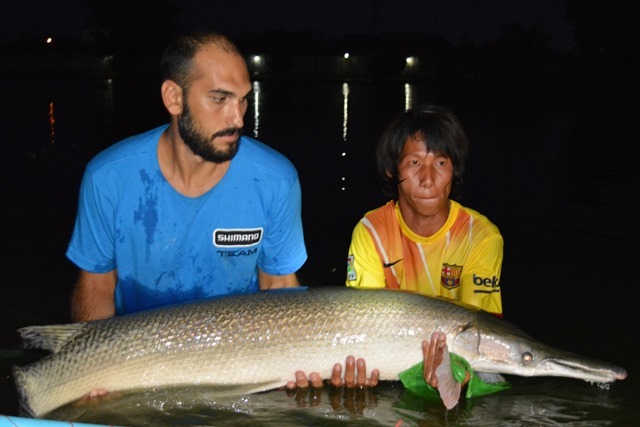 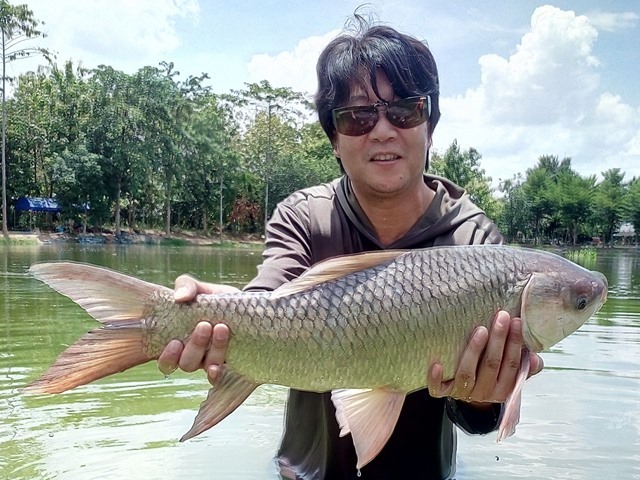 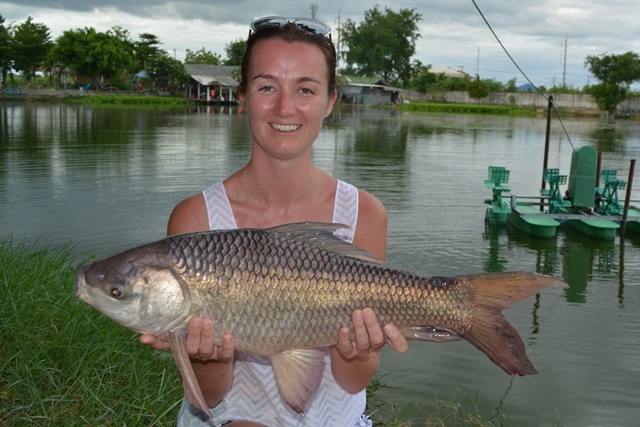 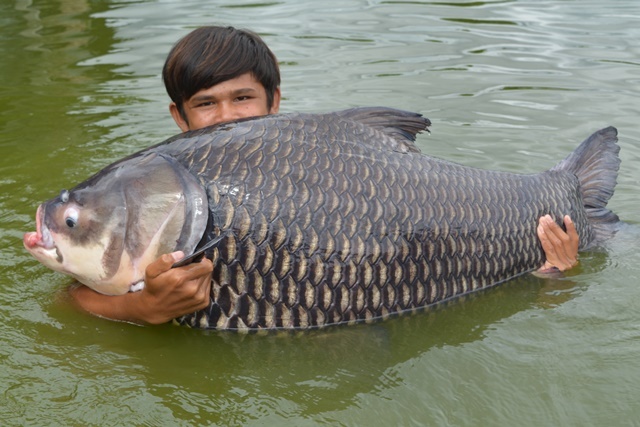 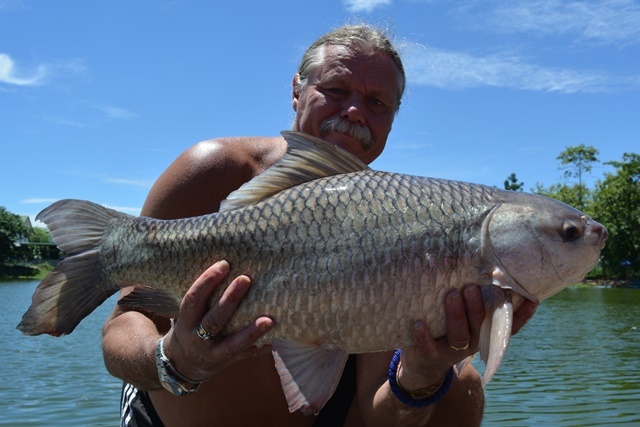 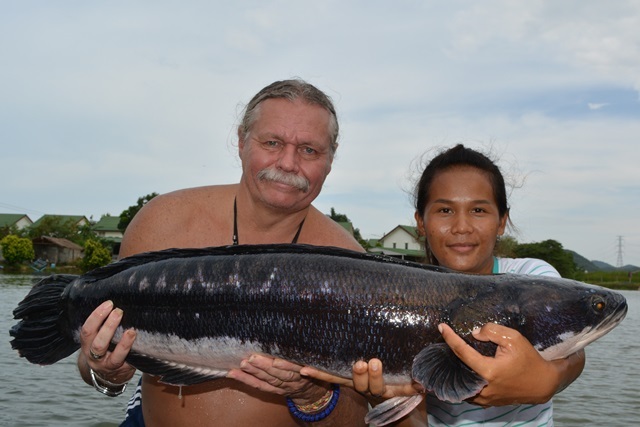 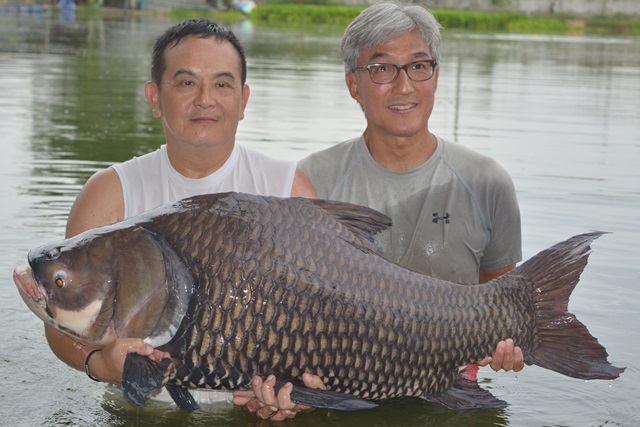 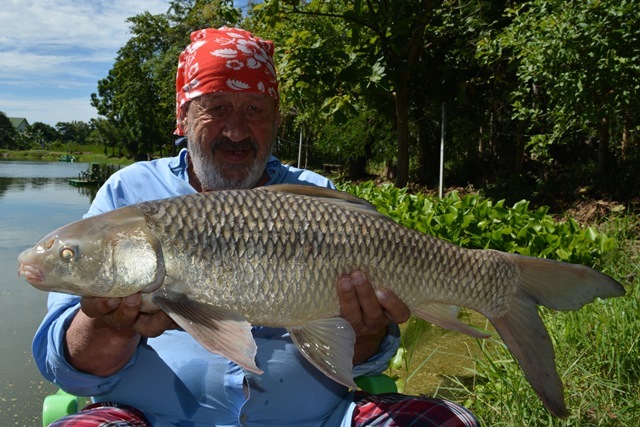 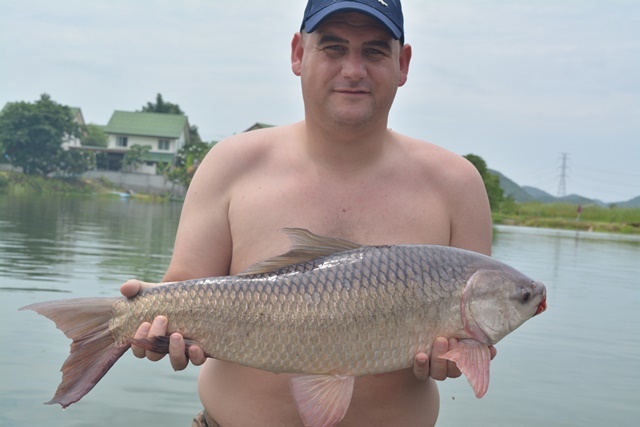 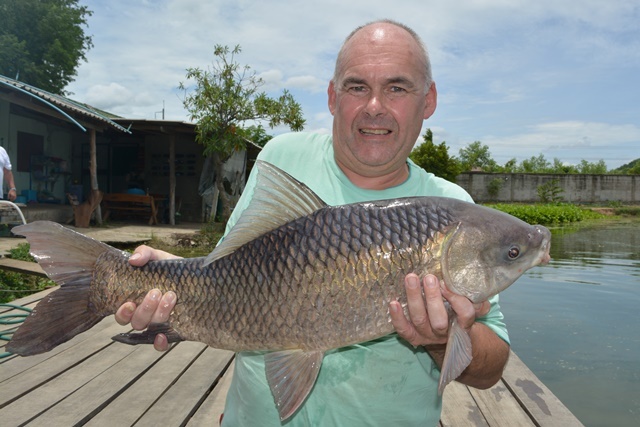 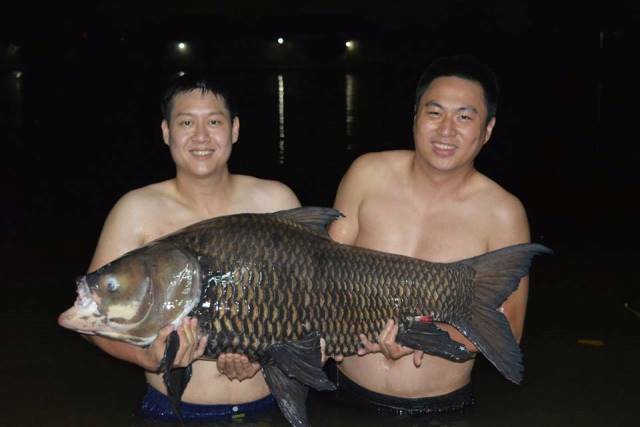 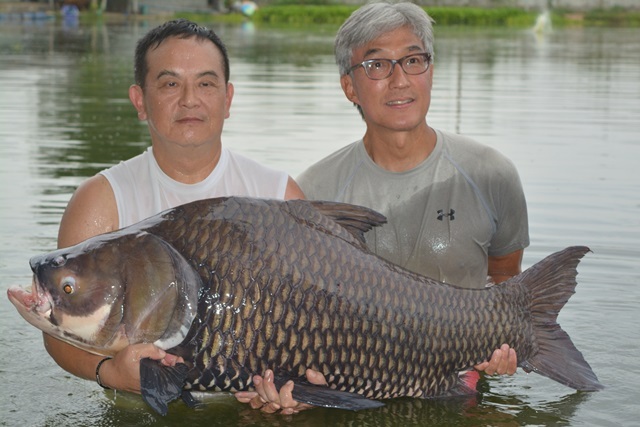 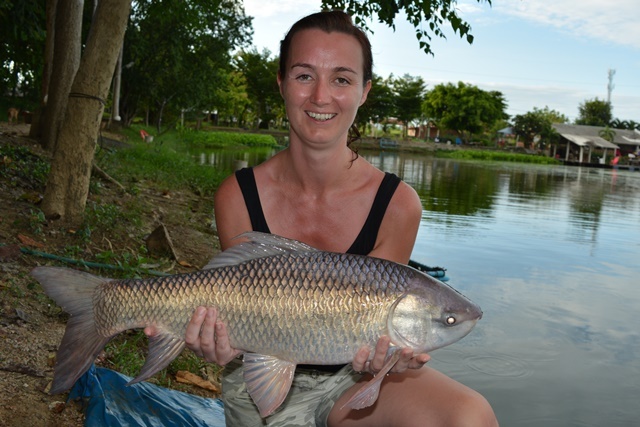 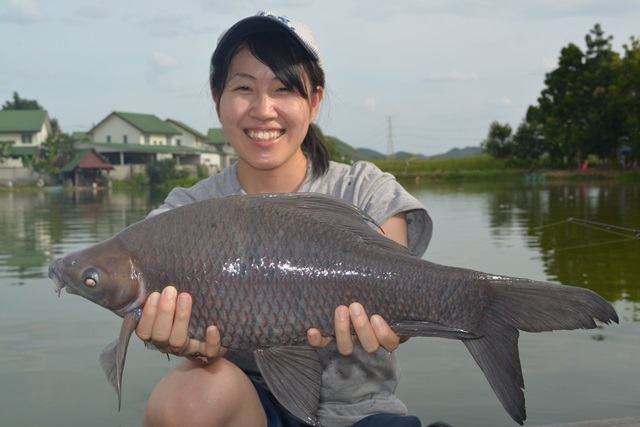 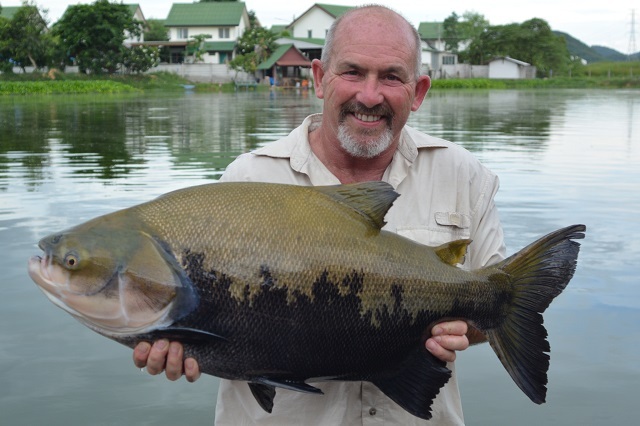 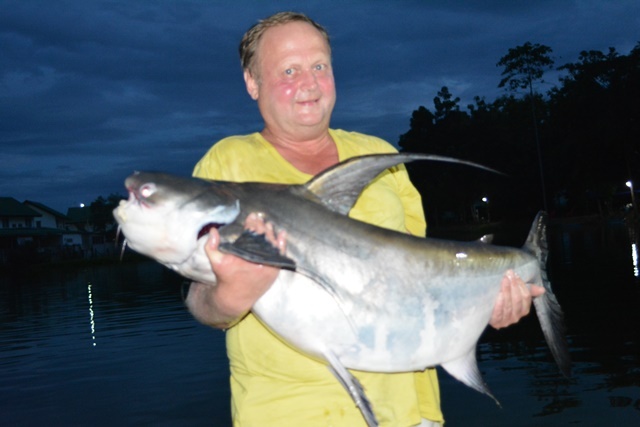 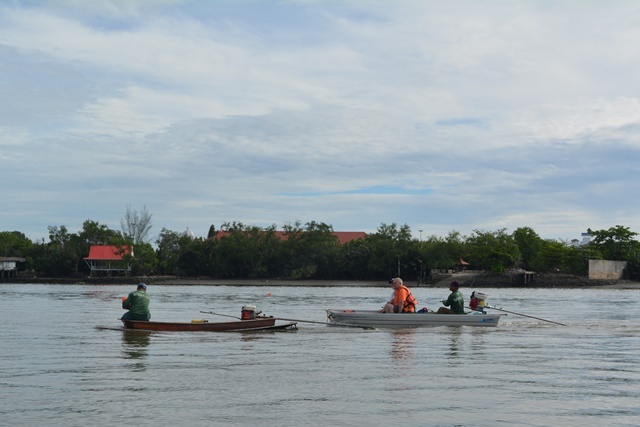 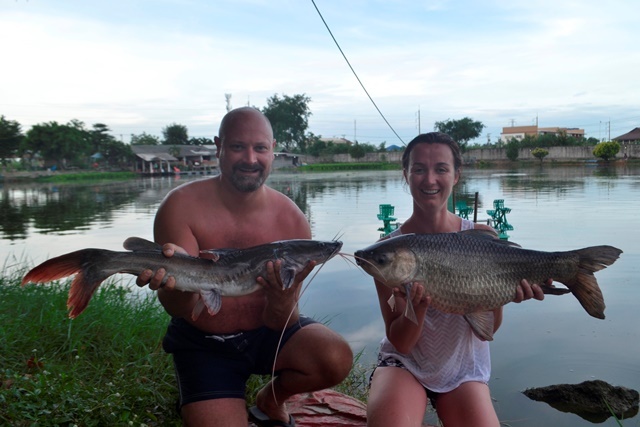 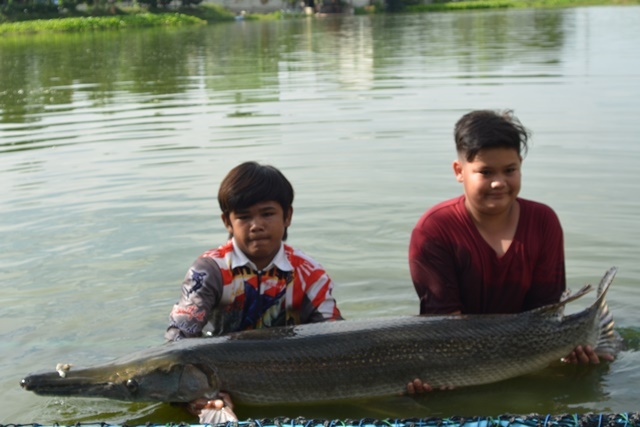 Tap of Bangkok Guiding Service was back with a couple of return customers who both had an enjoyable day catching a rare Salween rita as well as mrigal Siamese carp, Chinese grass carp and Amazon redtail. 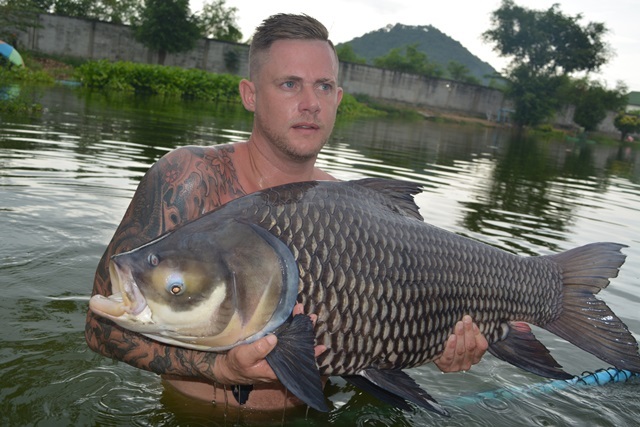 Lee Timbrell was another angler who returned after a prolonged absence and caught some stunning fish like a 120lb Siamese carp, a pb Mekong catfish, He also caught a great variety of other species that included tambaqui, Juliens golden price carp, African walking catfish, rohu, Big-Y catfish, black shark minnow, catfish shark as well as both Asian and Amazon catfish. 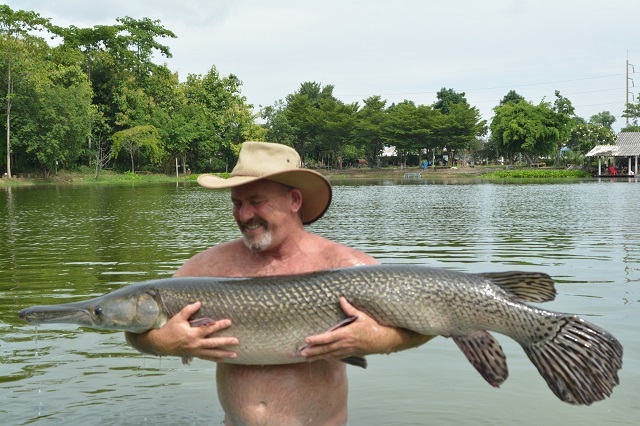 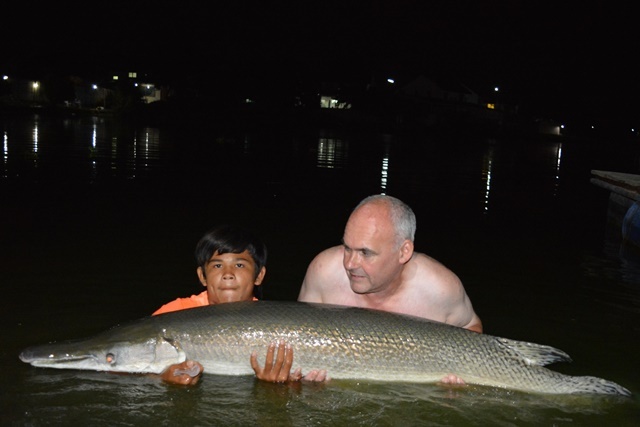 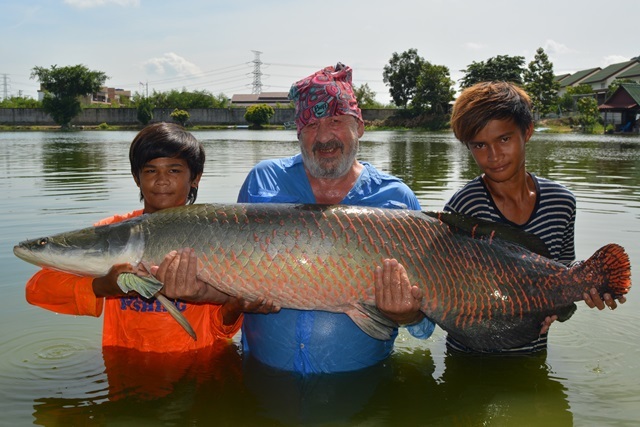 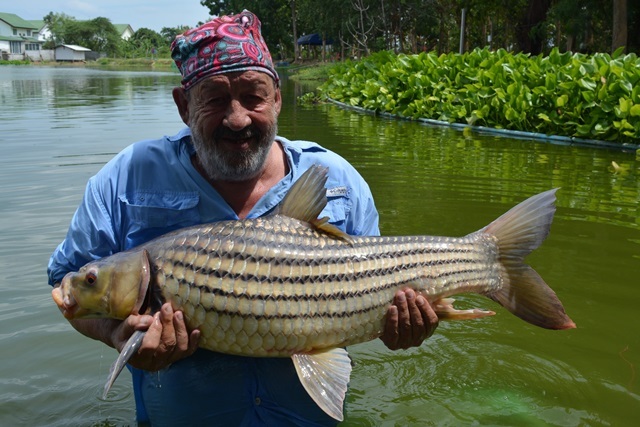 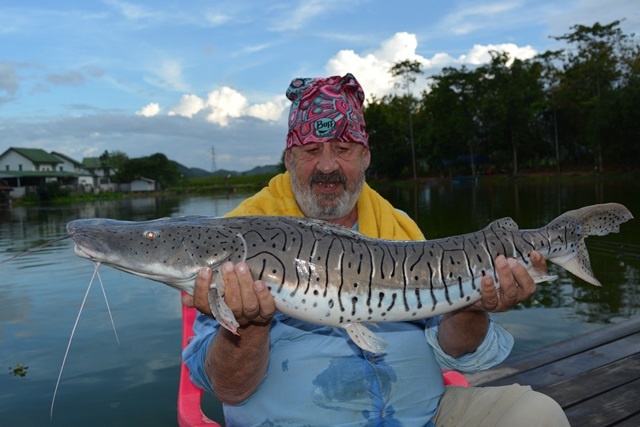 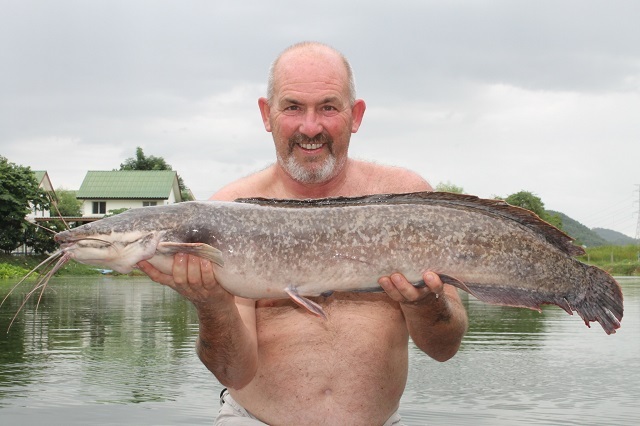 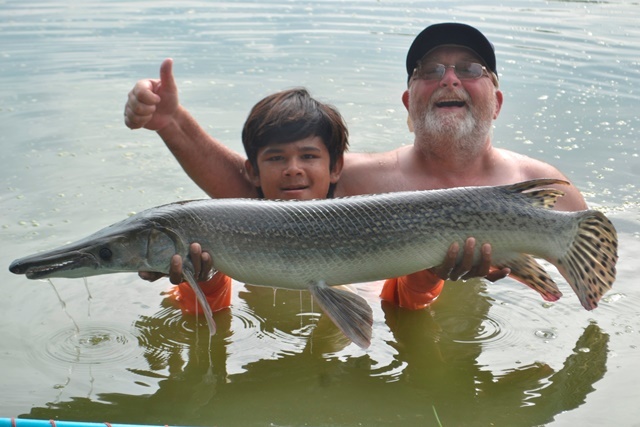 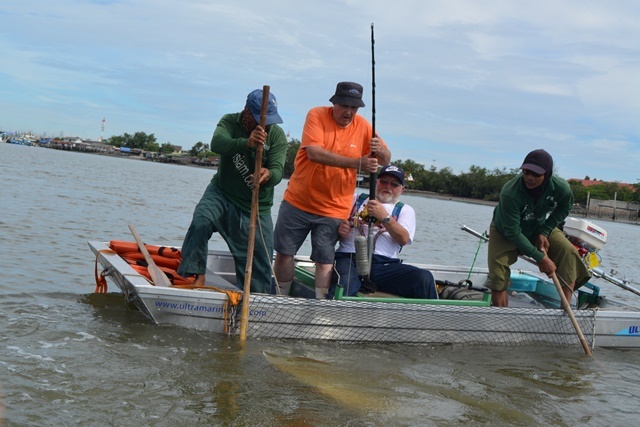 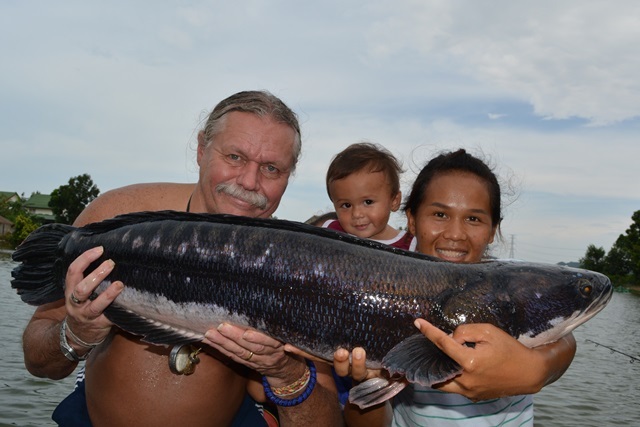 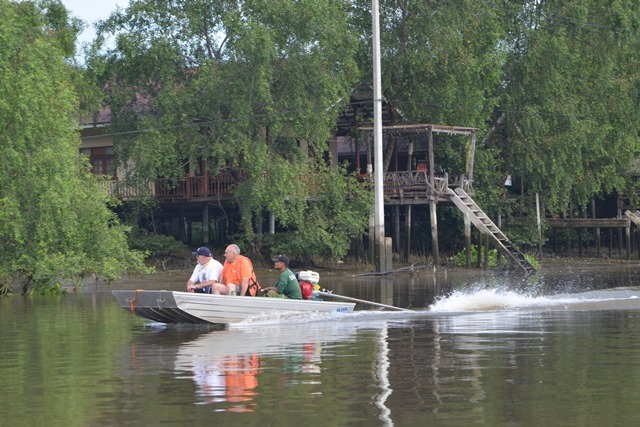 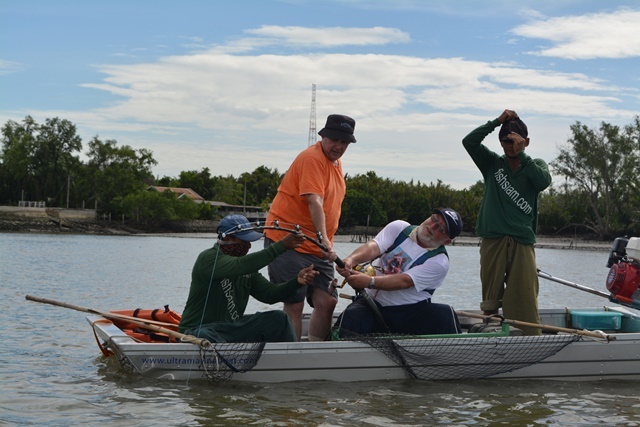 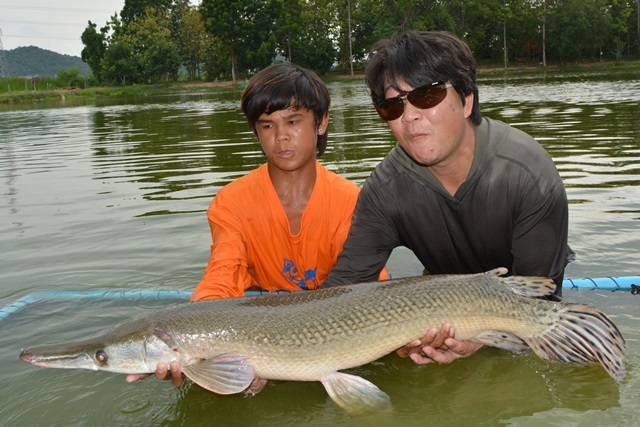 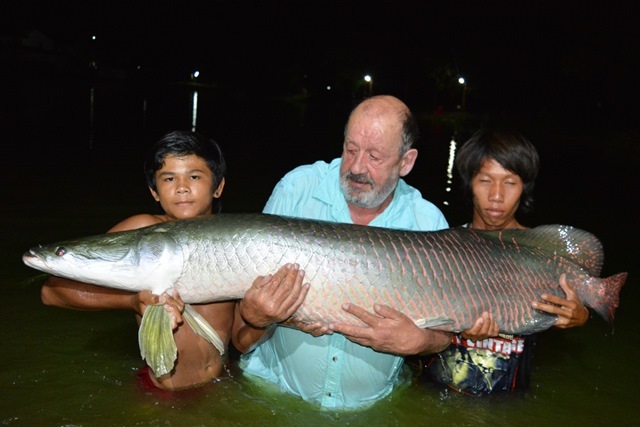 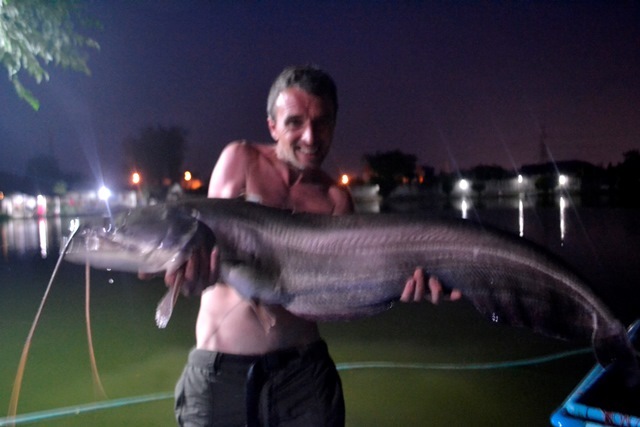 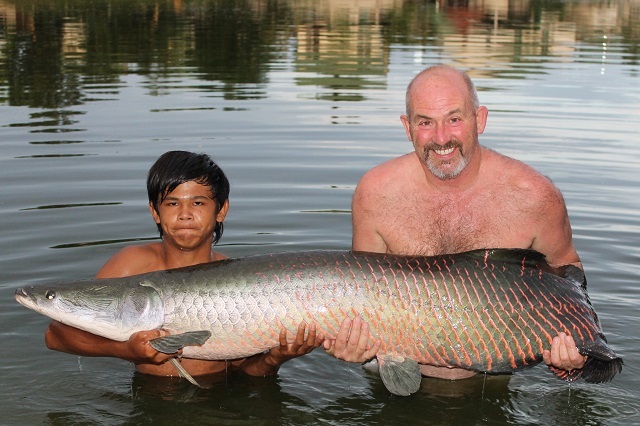 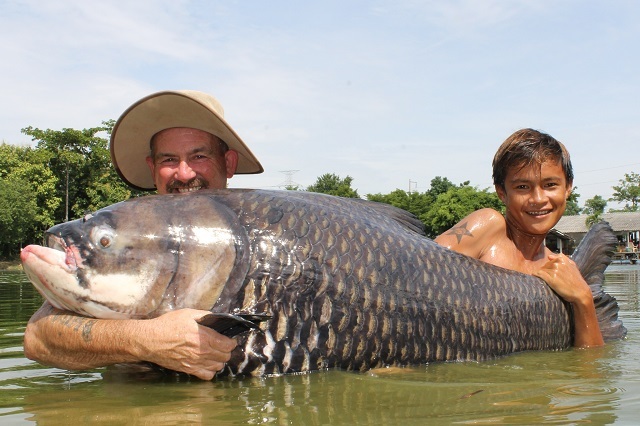 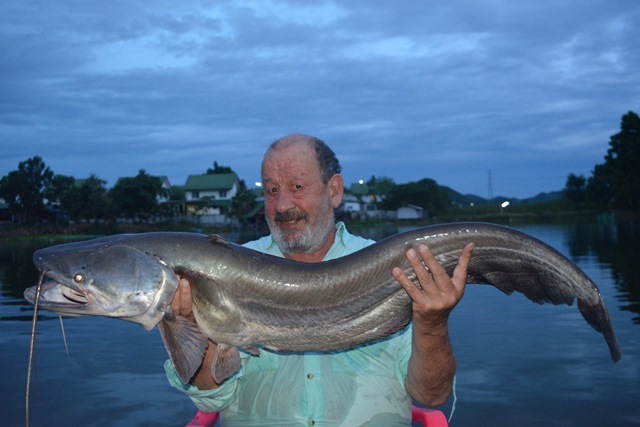 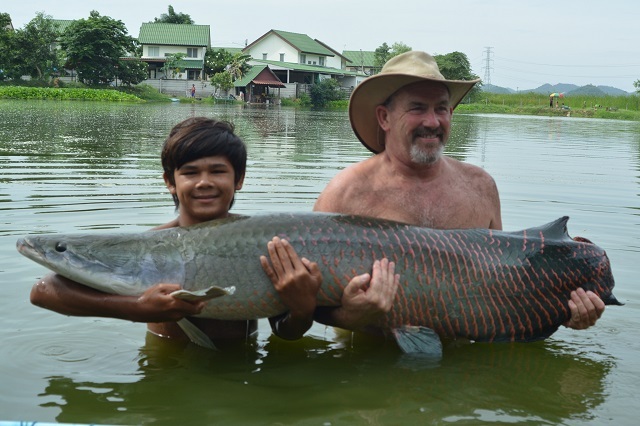 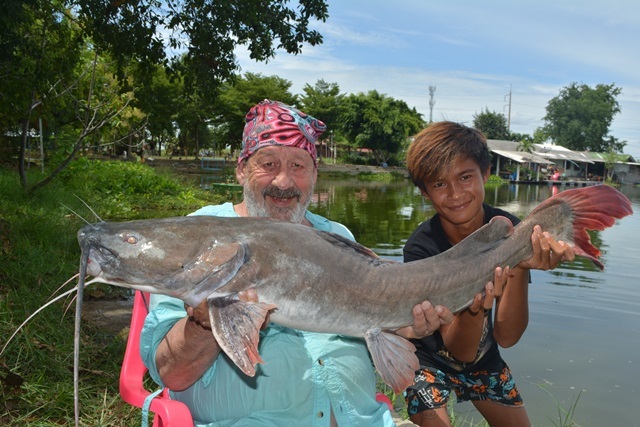 Harald Klein and his son Dani were back for their bi-annual visit and a usual caught a number of great catches that included some huge alligator gar, chao phrays catfish, Juliens golden price carp, Siamese carp, Mekong catfish, and Amazon redtail. 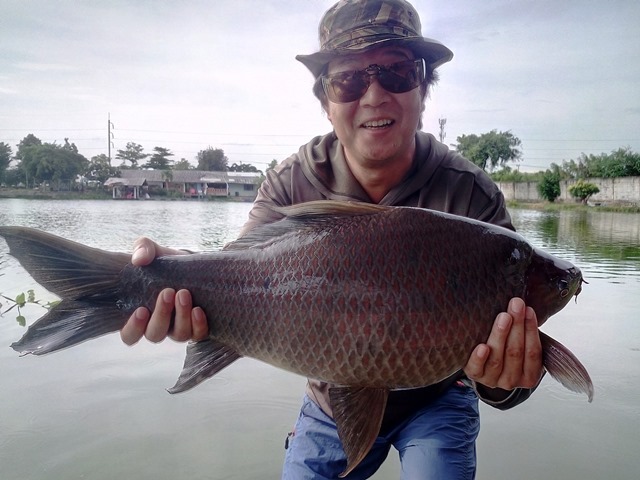 A Japanese angling father and son duo had a great day catching albino pacu, alligator gar, rohu, black shark minnow, bearded labeo, and Juliens golden price carp. 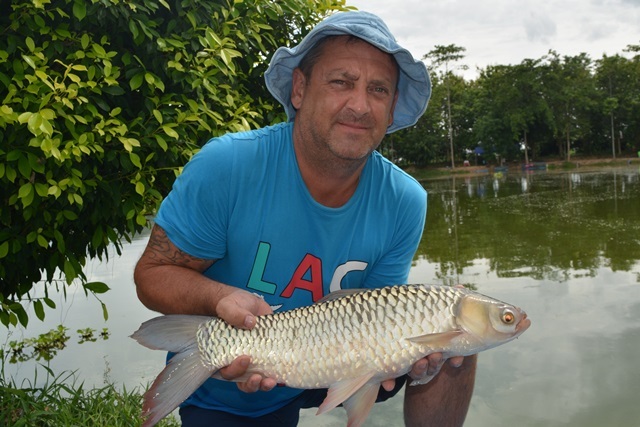 Craig Reeder returned after an absence of several years and caught some nice fish that included Juliens golden price carp, mrigal, rohu, Siamese carp and Amazon redtail. 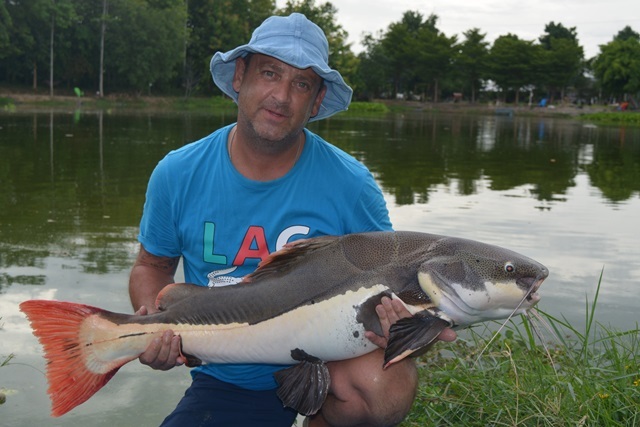 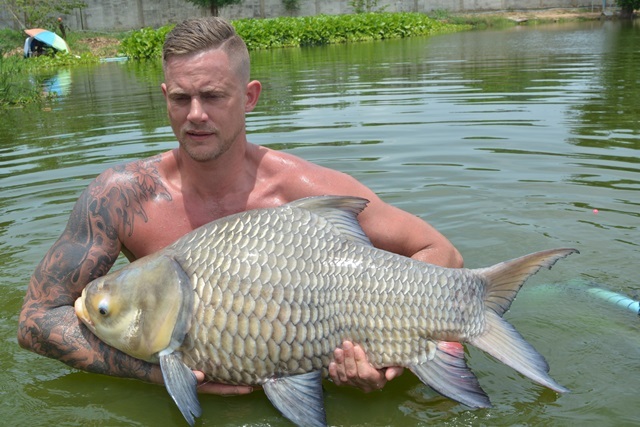 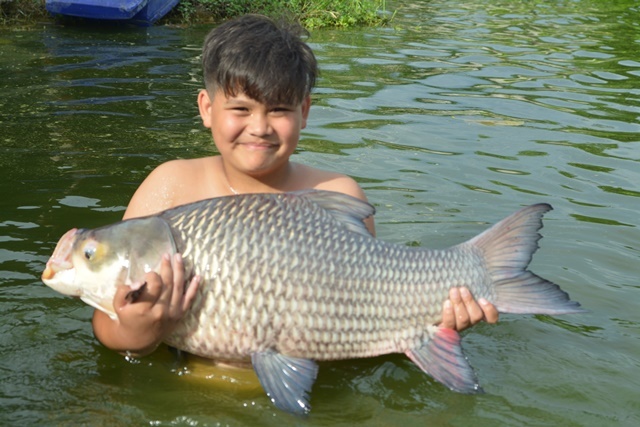 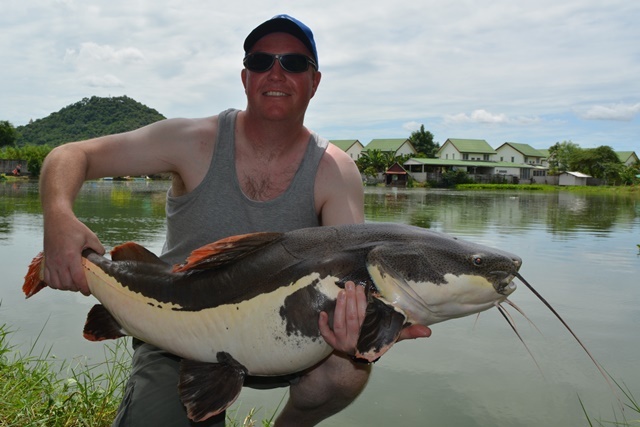 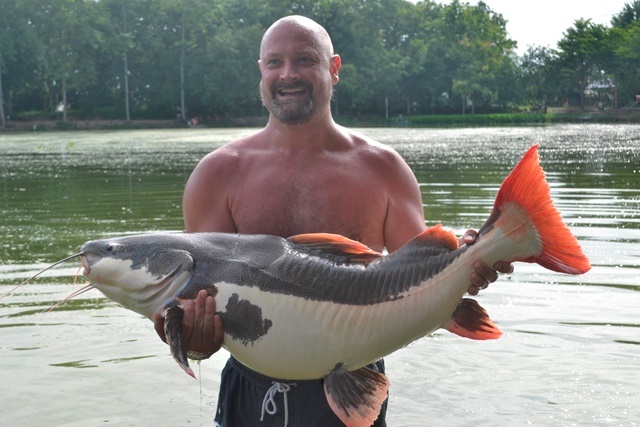 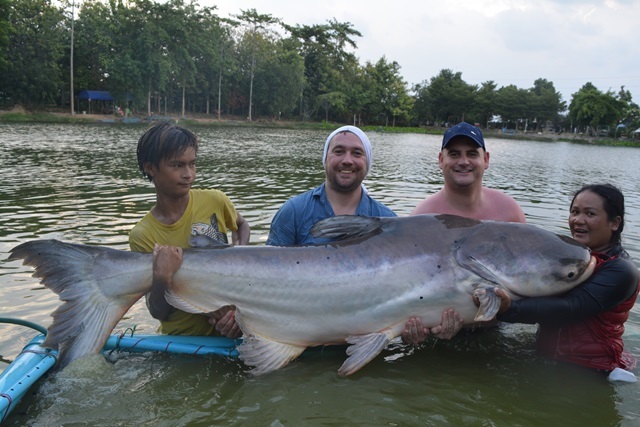 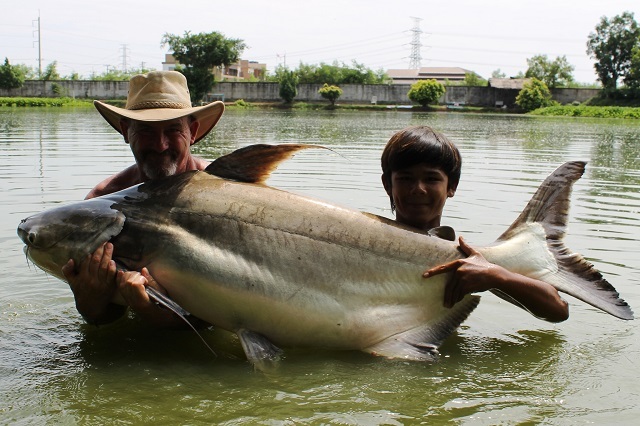 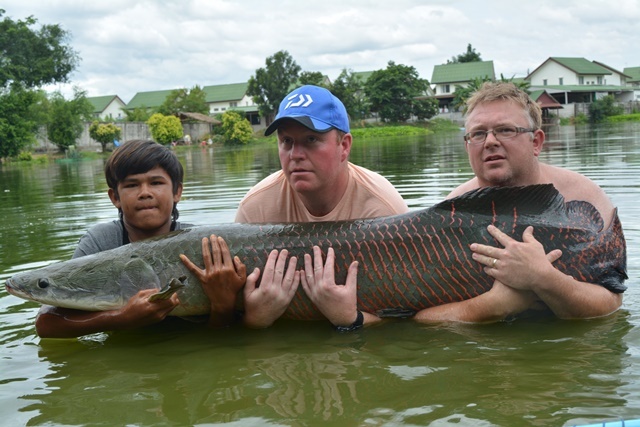 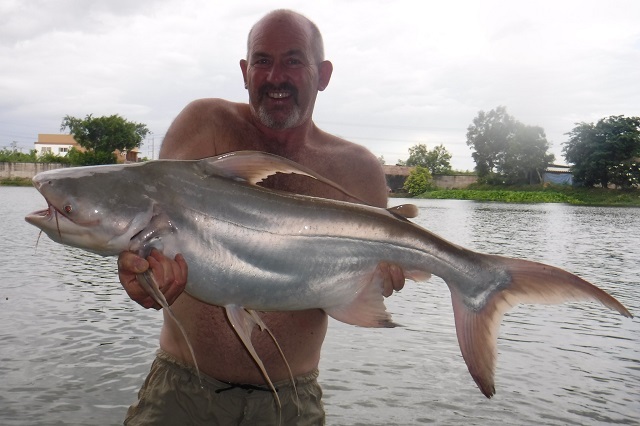 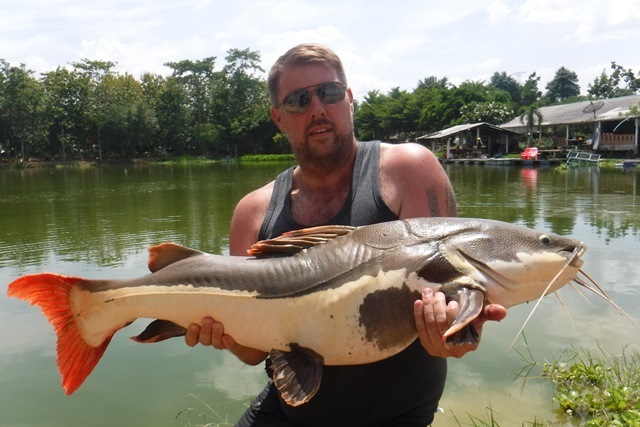 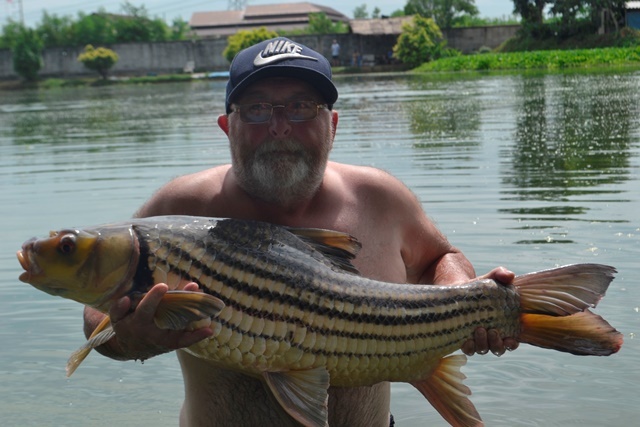 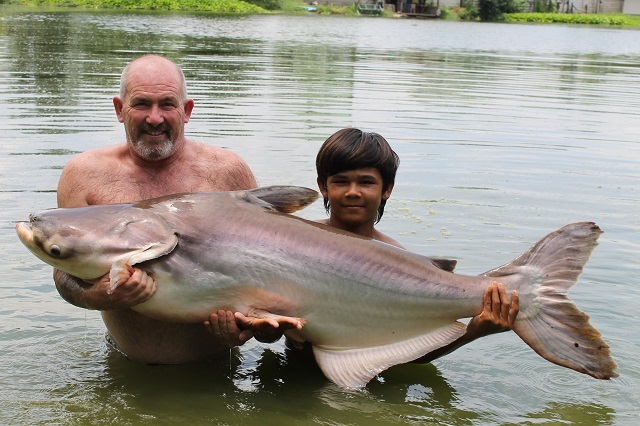 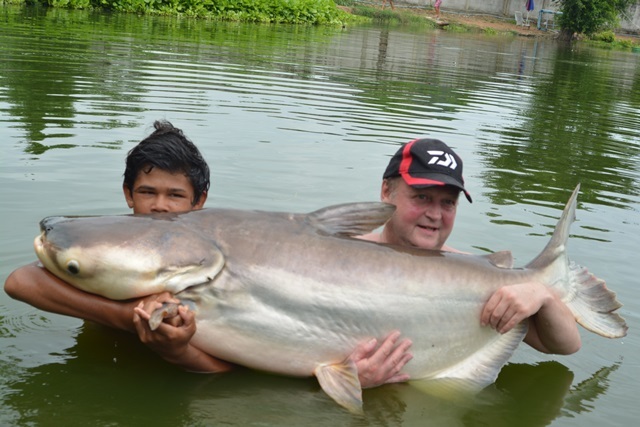 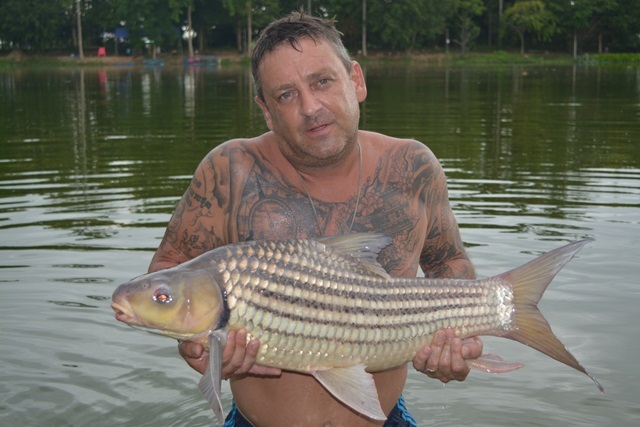 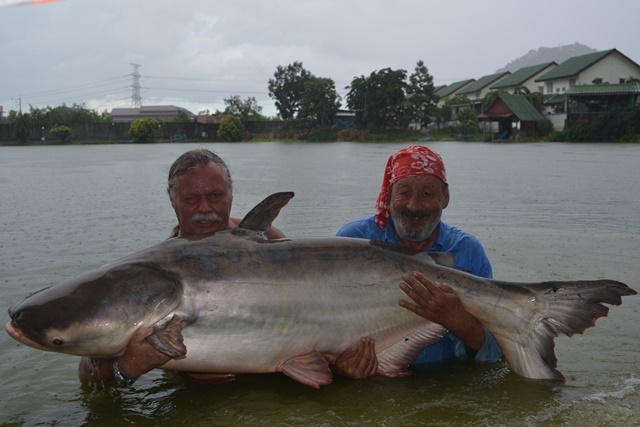 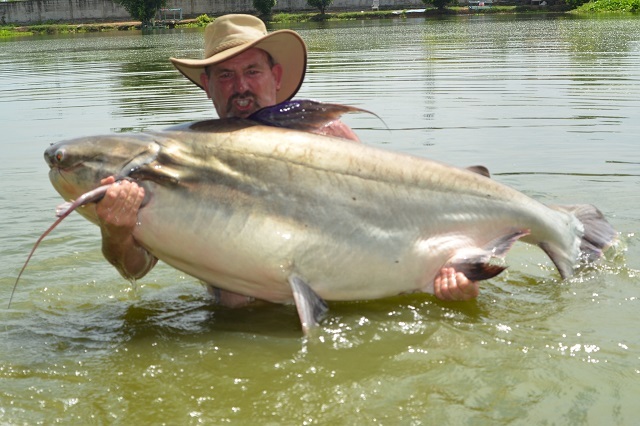 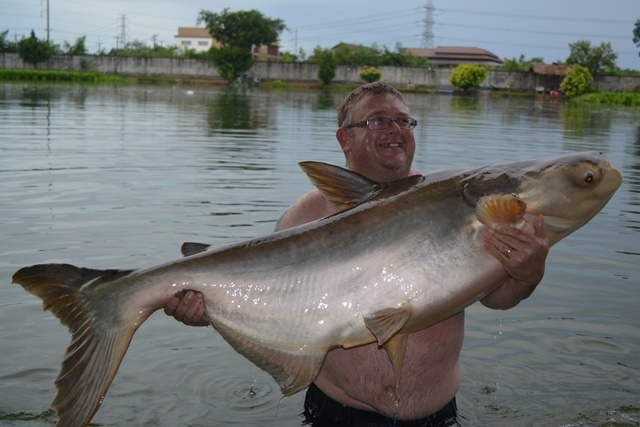 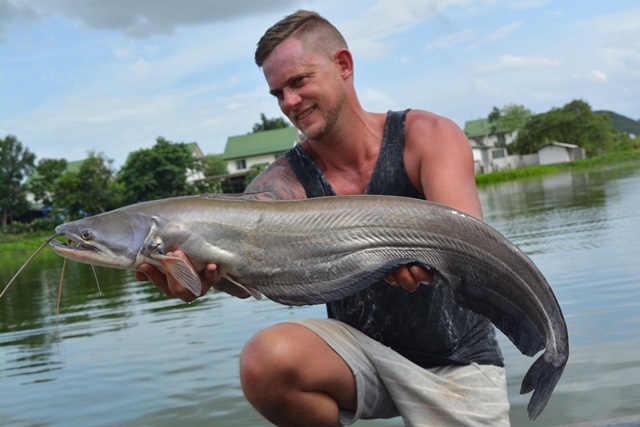 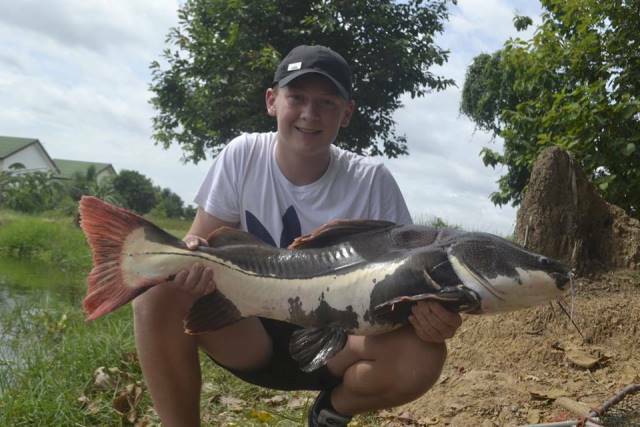 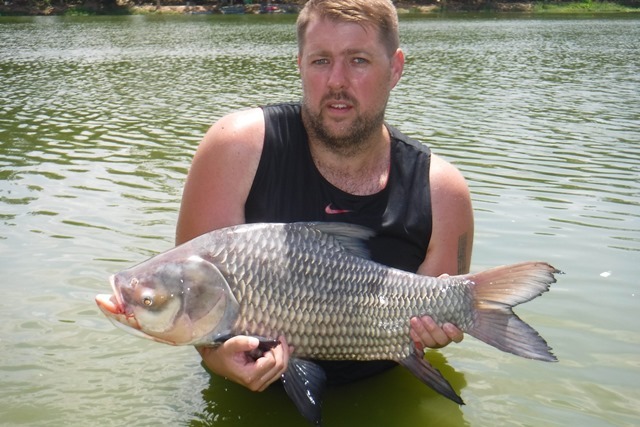 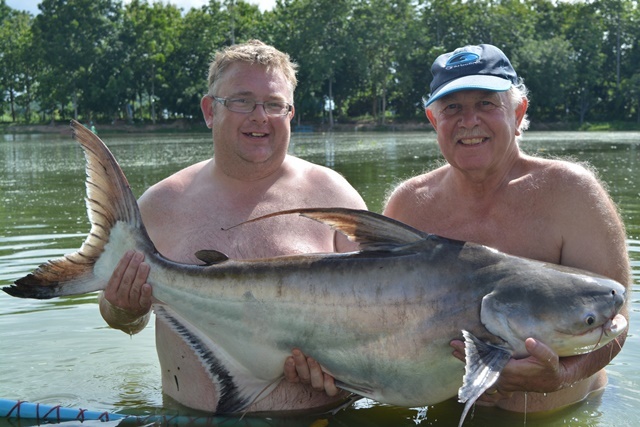 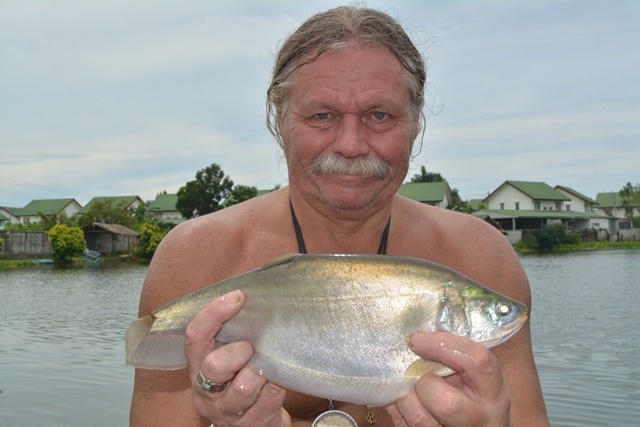 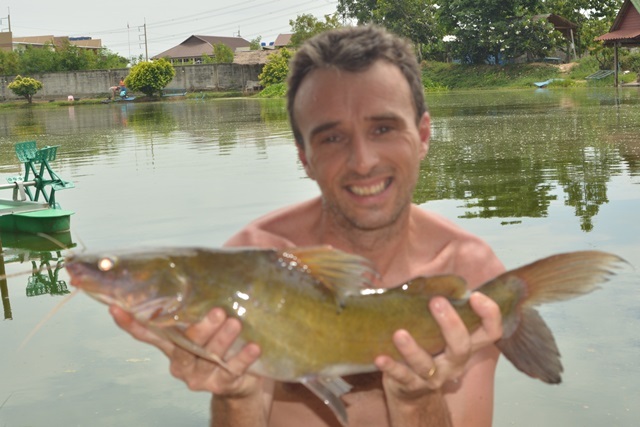 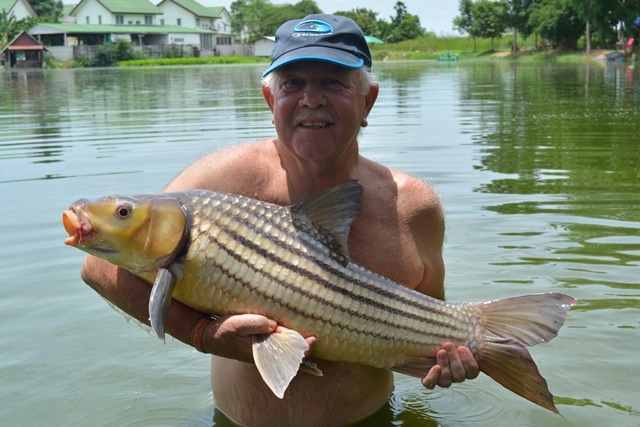 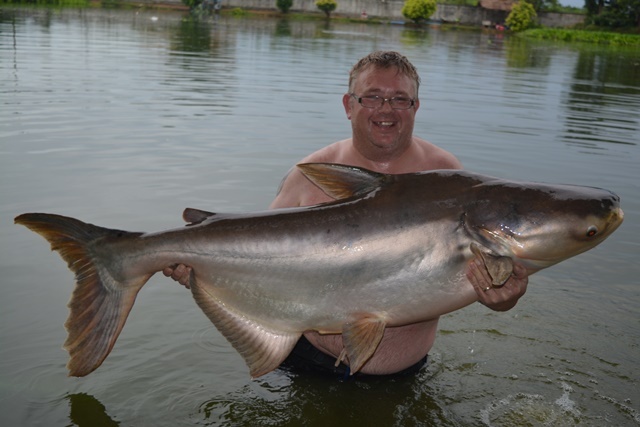 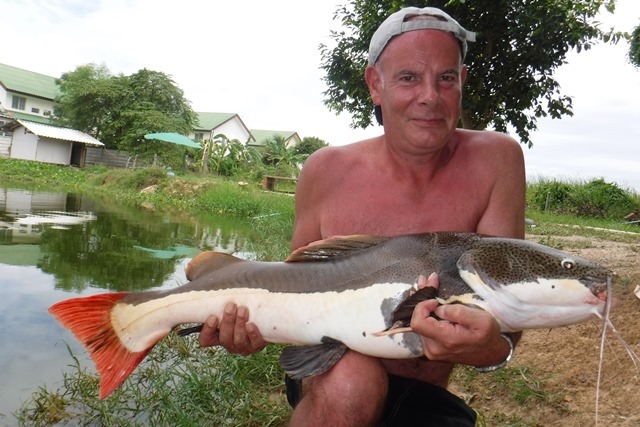 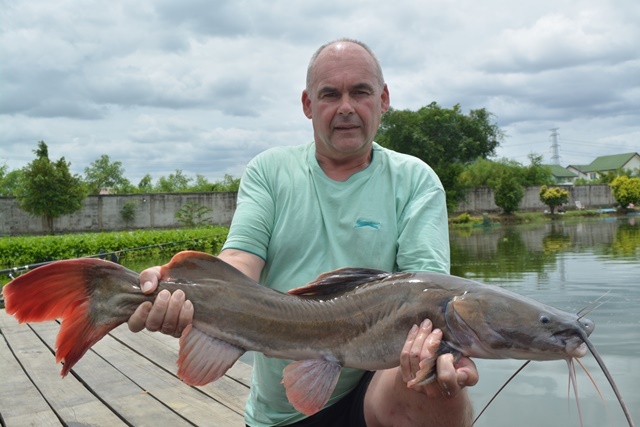 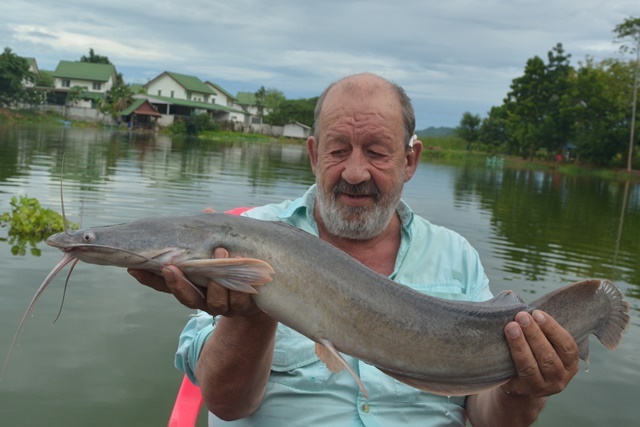 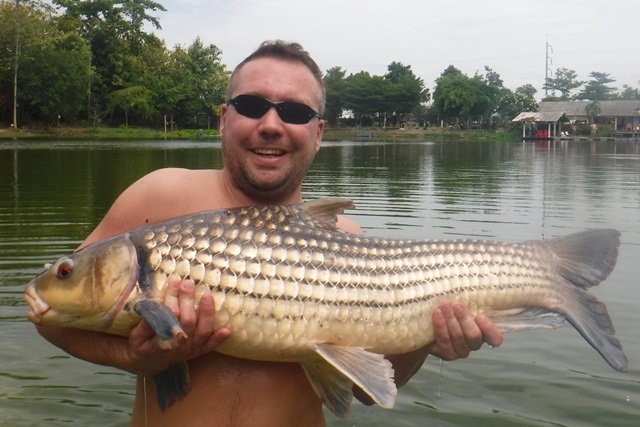 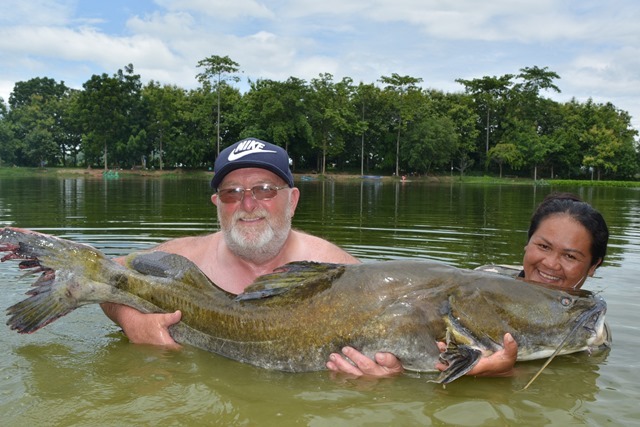 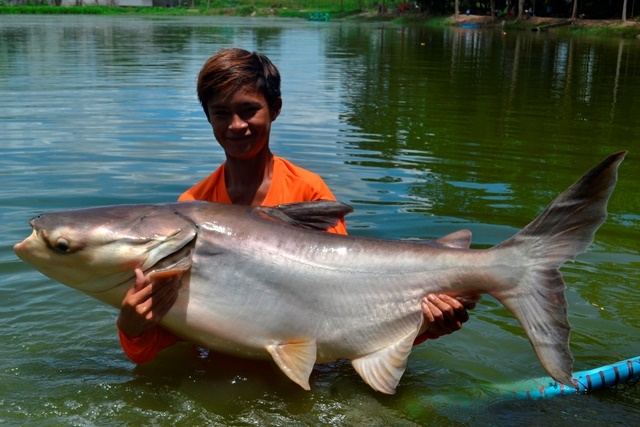 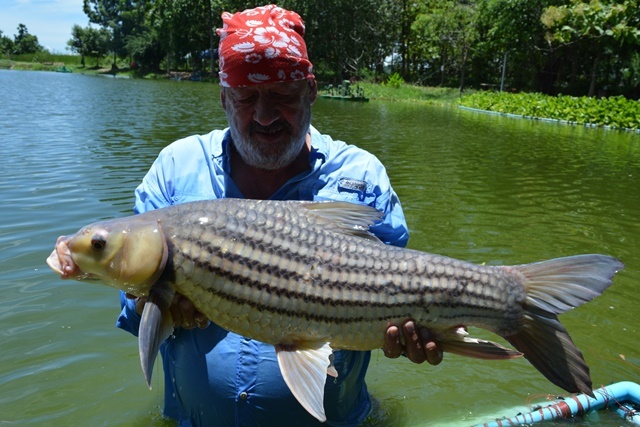 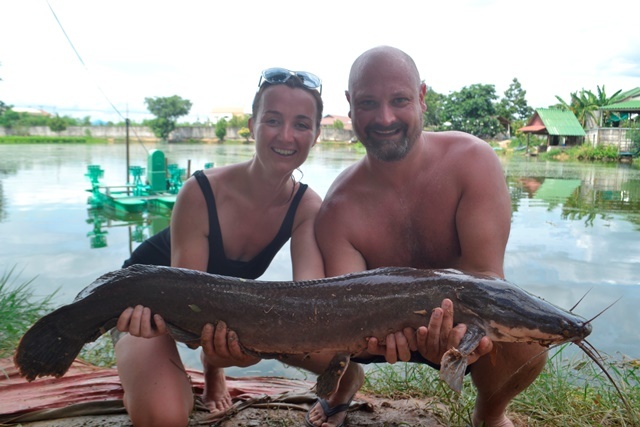 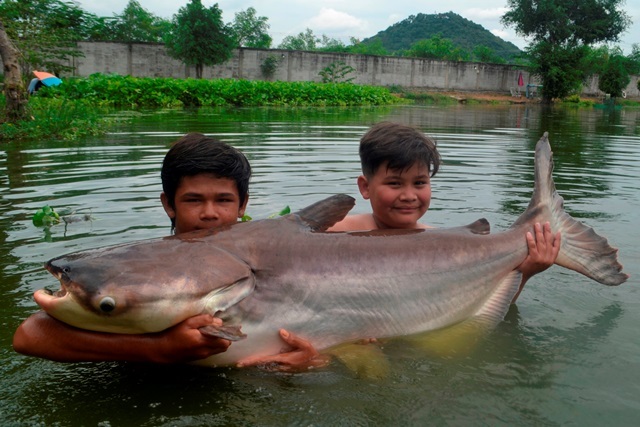 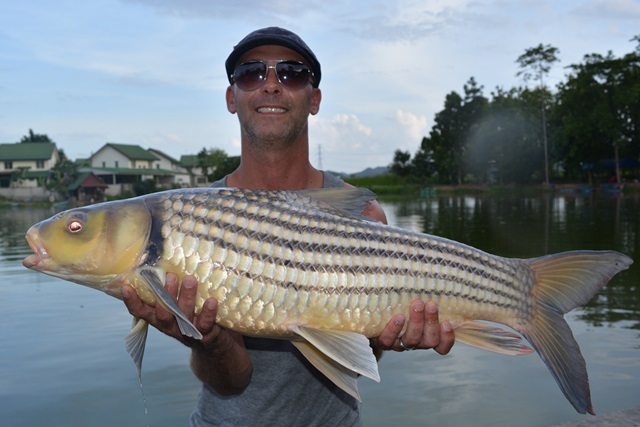 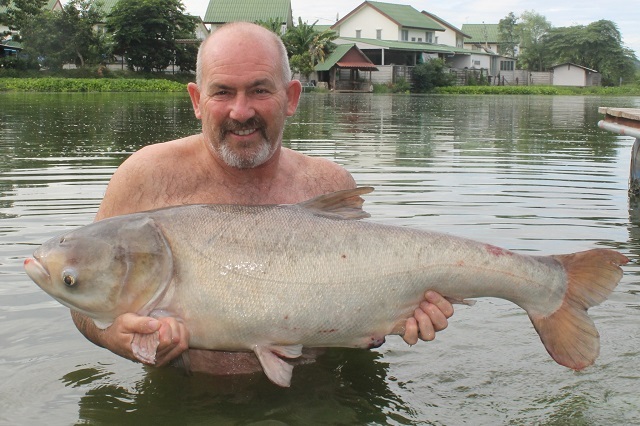 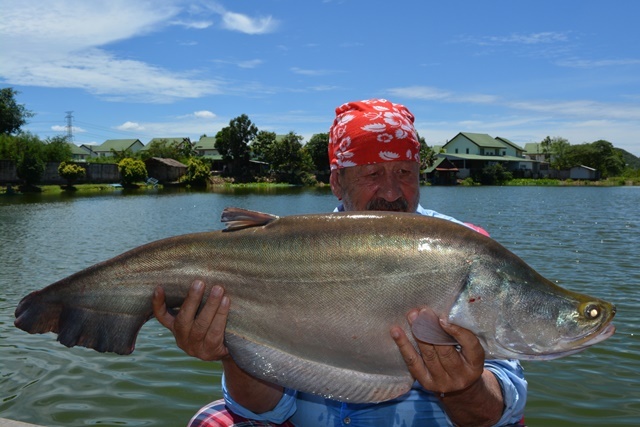 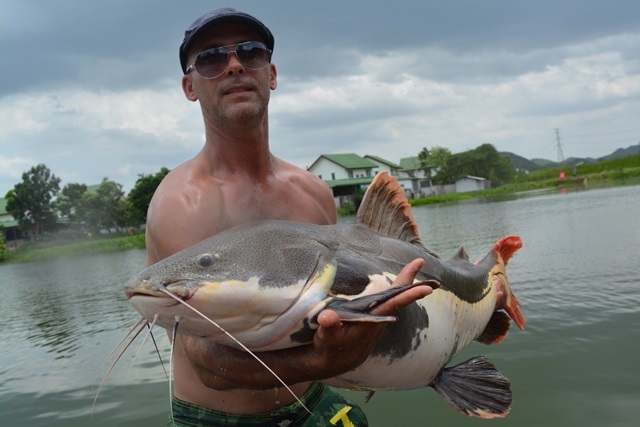 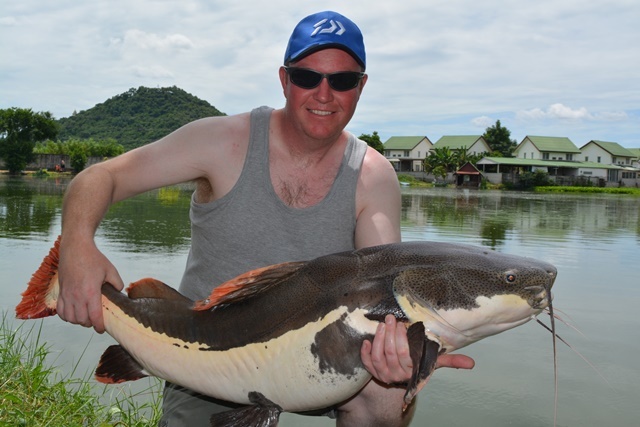 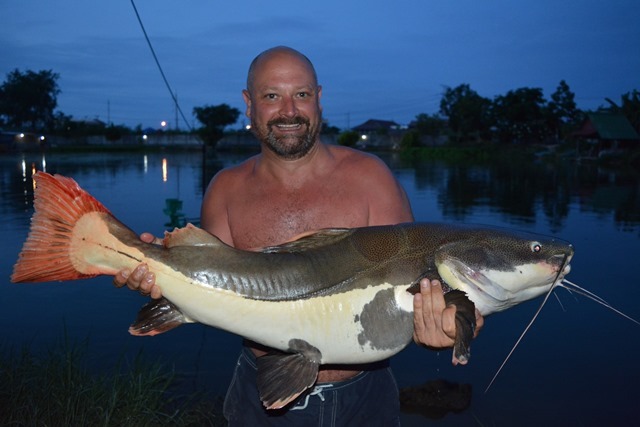 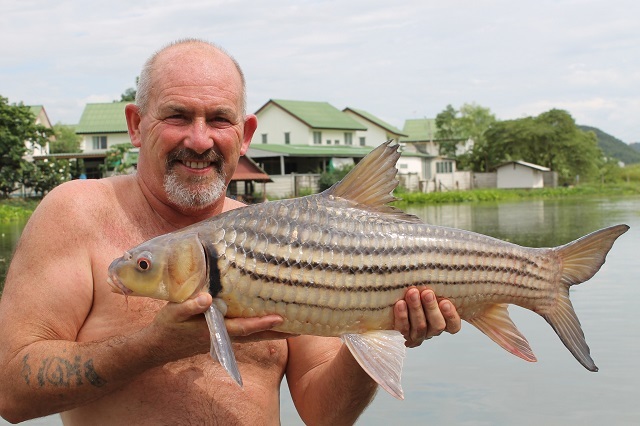 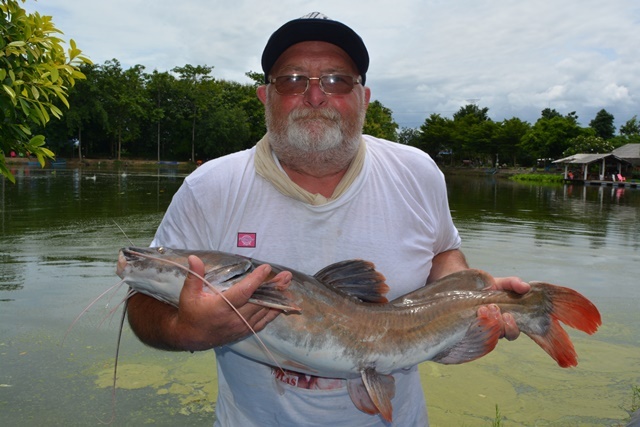 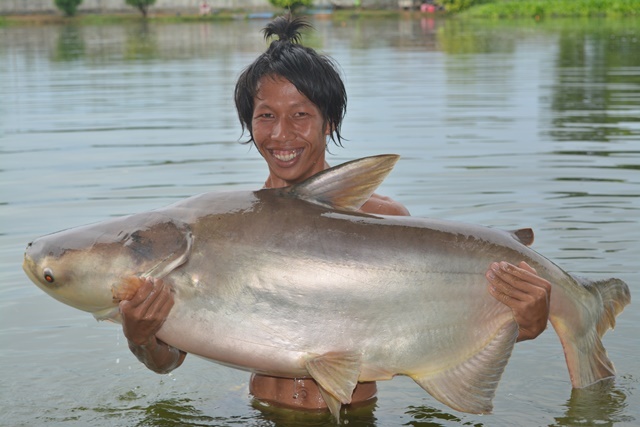 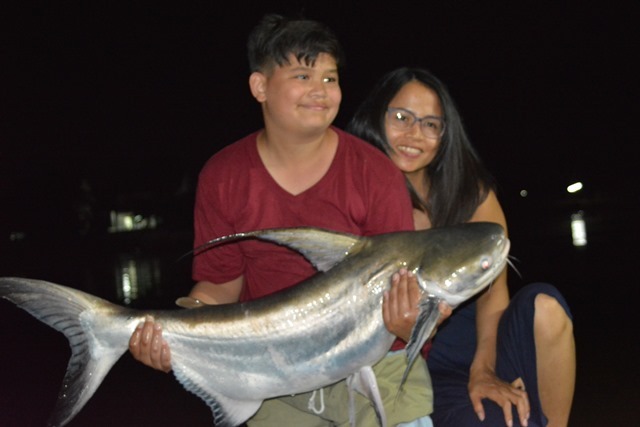 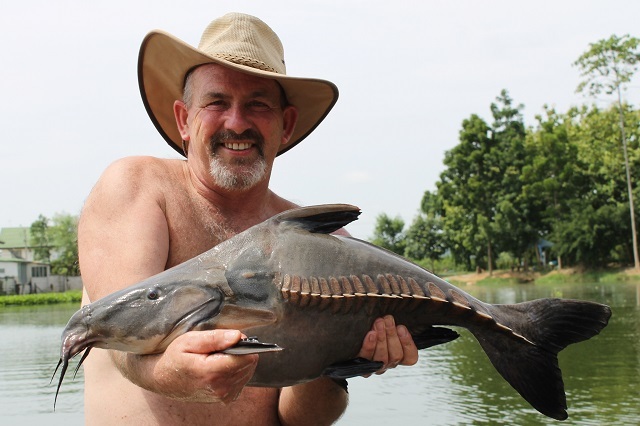 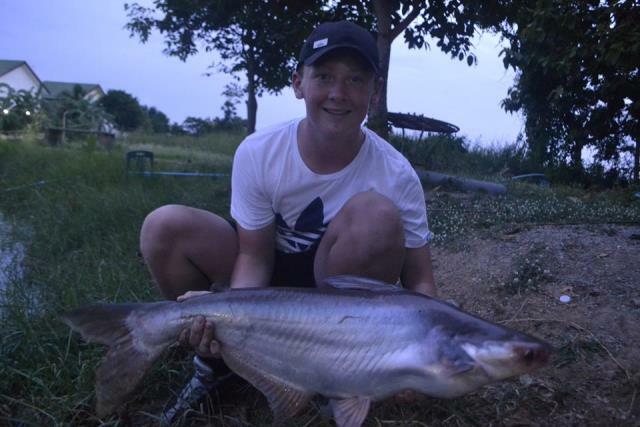 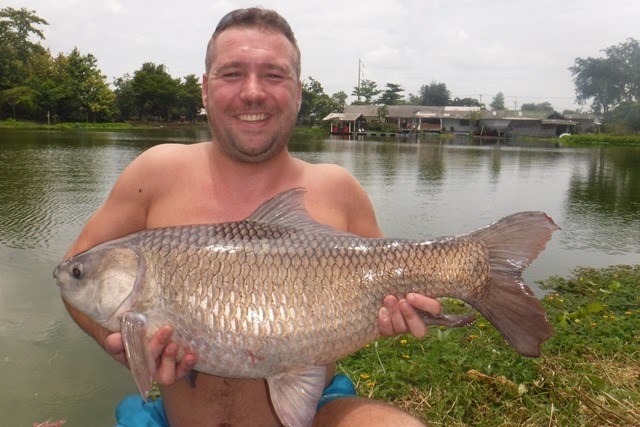 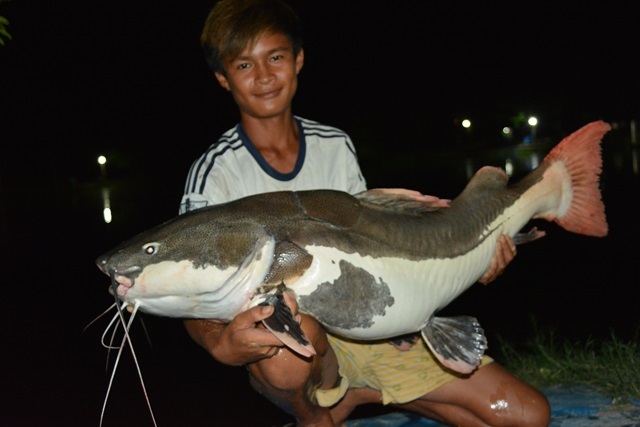 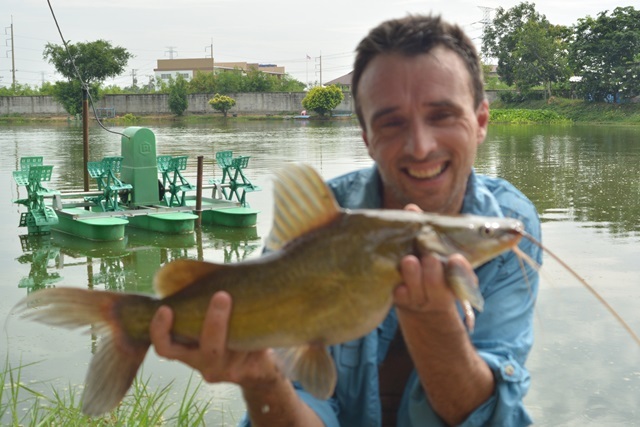 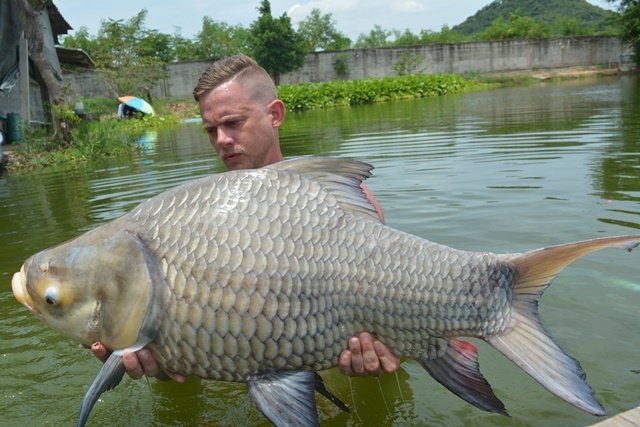 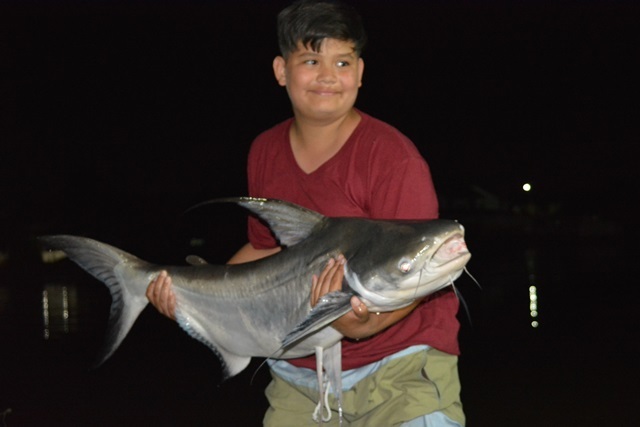 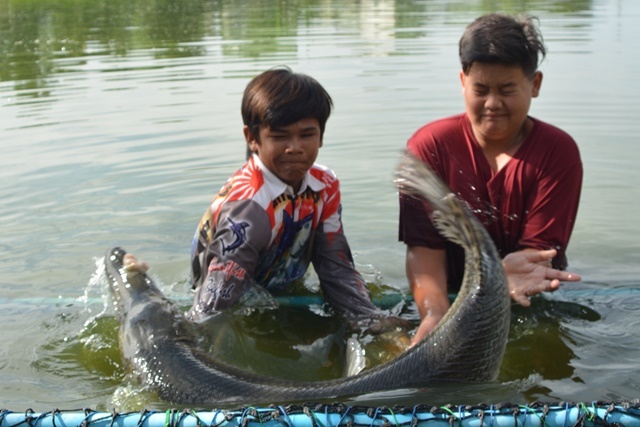 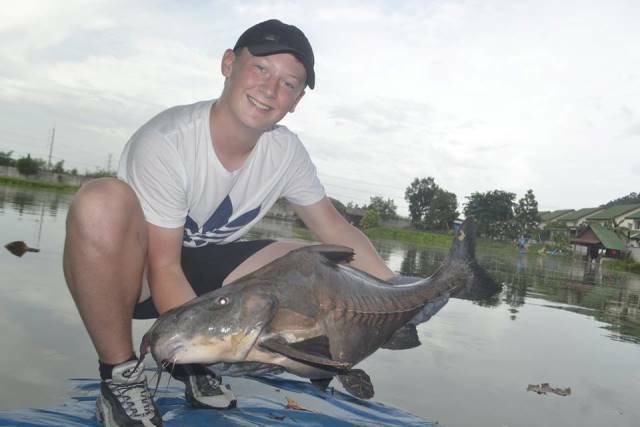 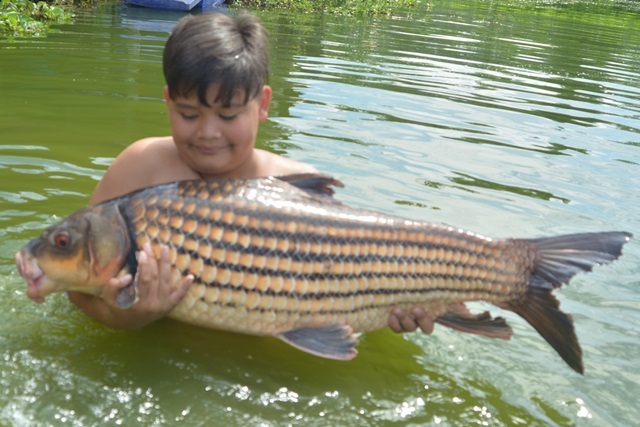 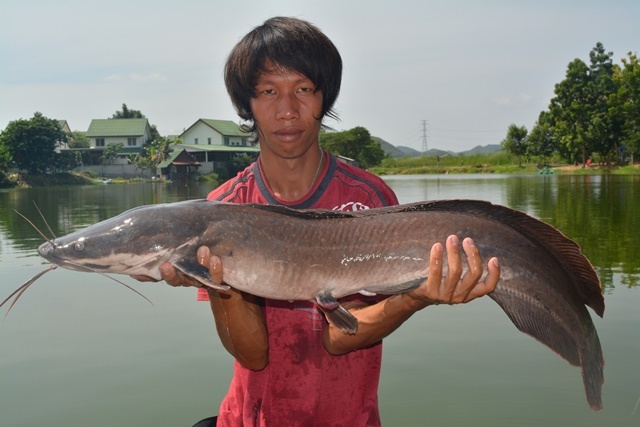 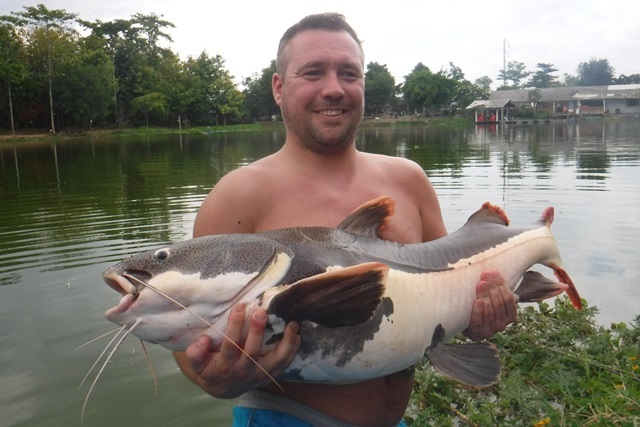 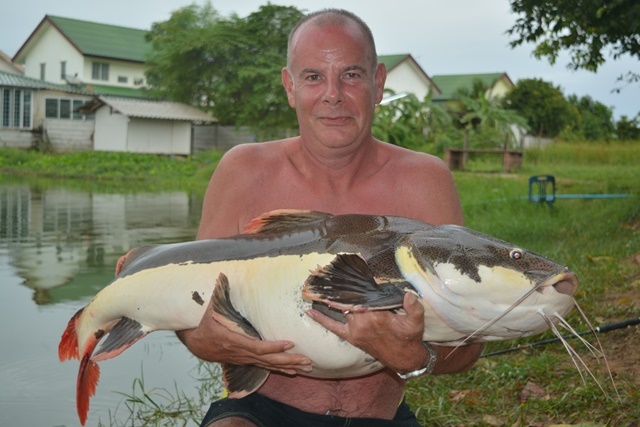 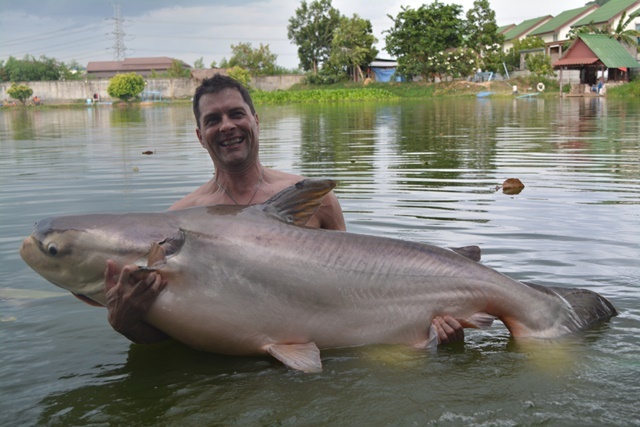 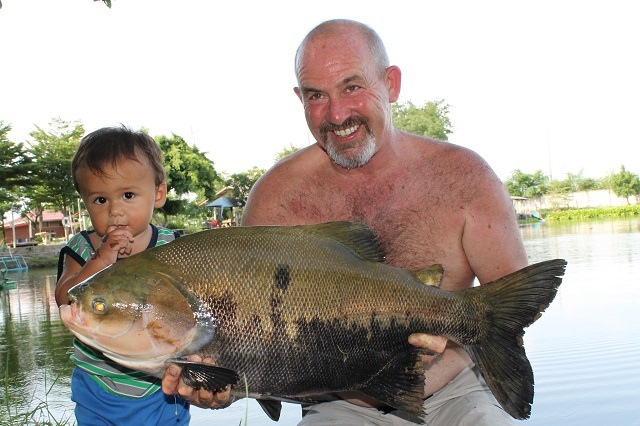 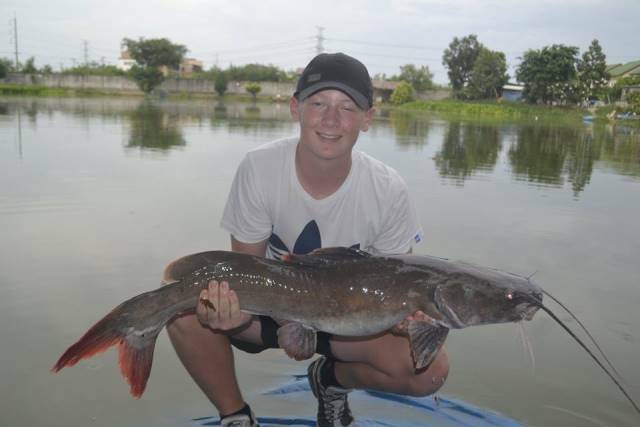 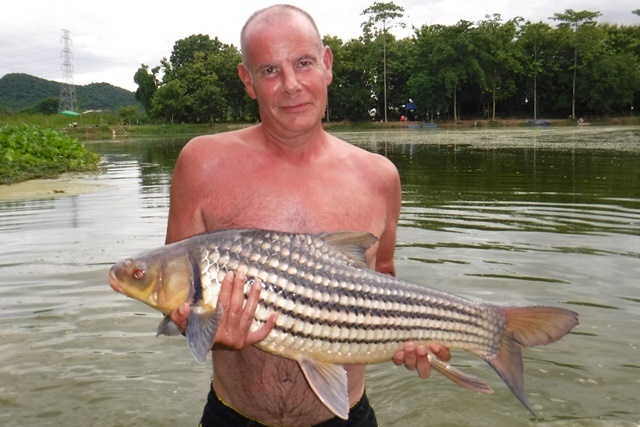 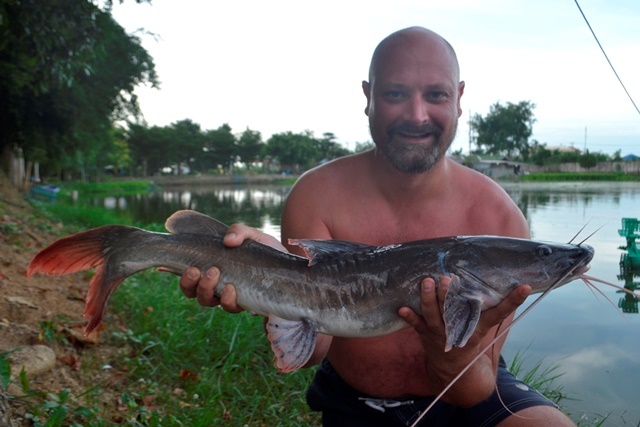 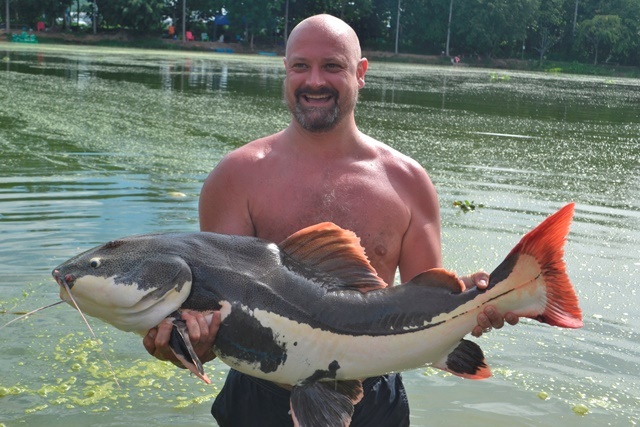 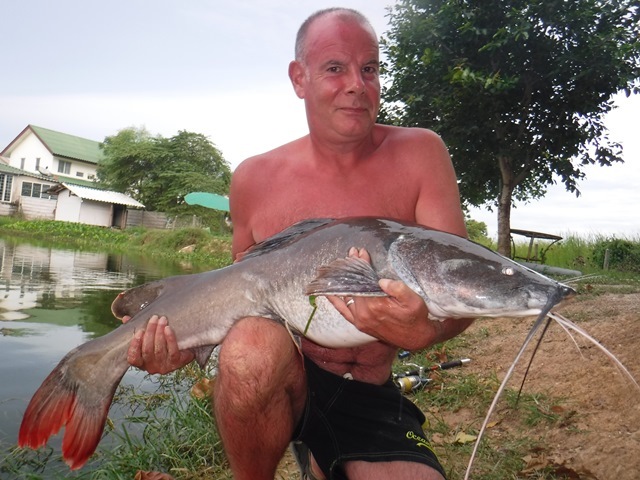 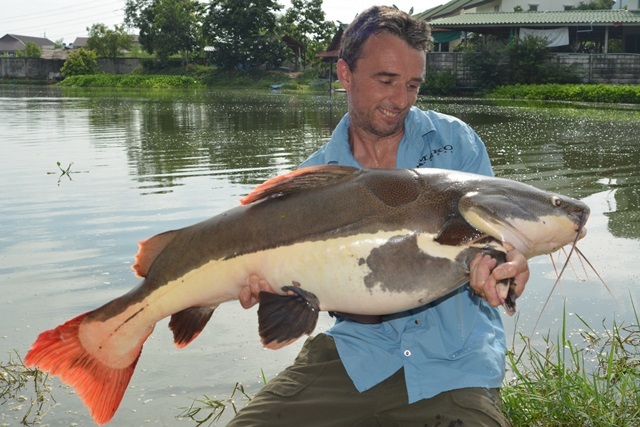 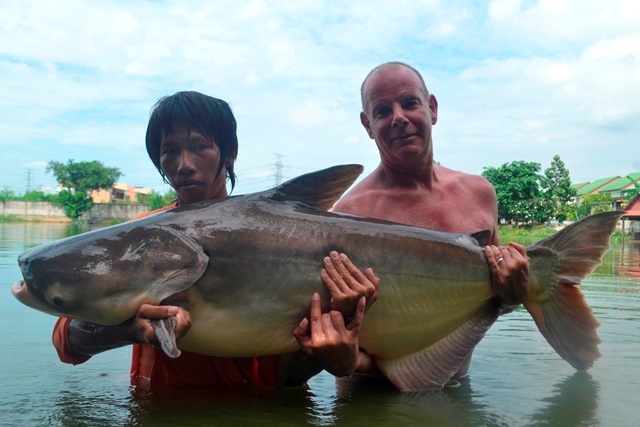 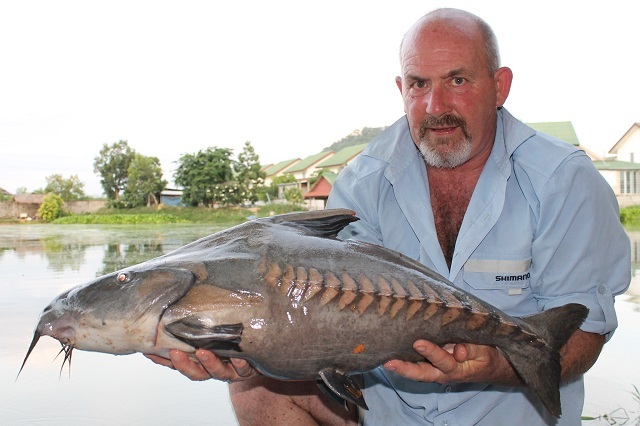 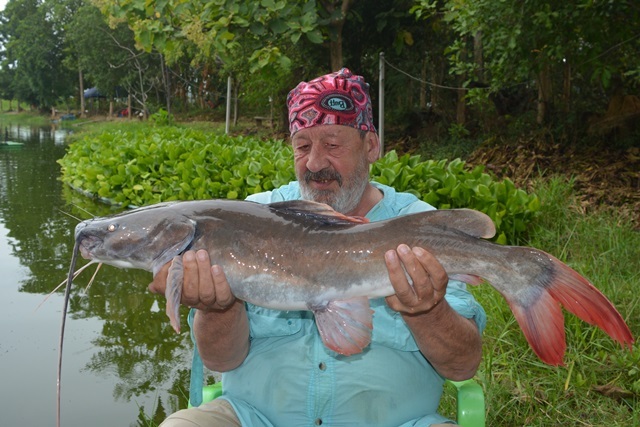 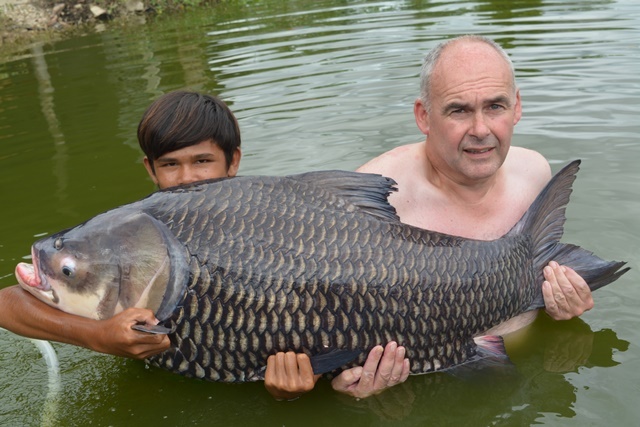 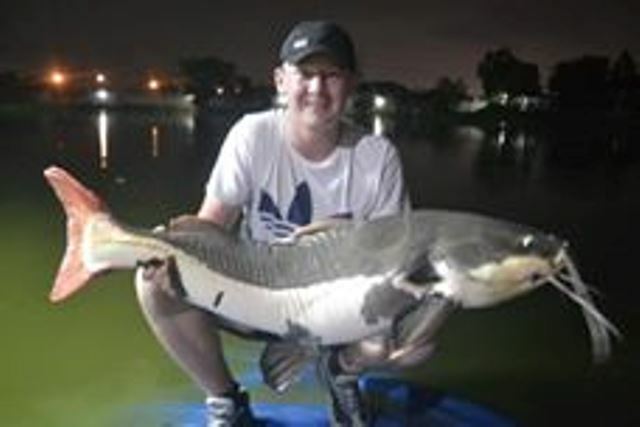 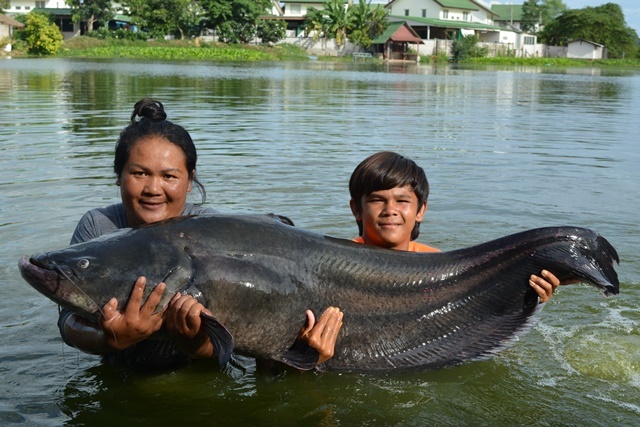 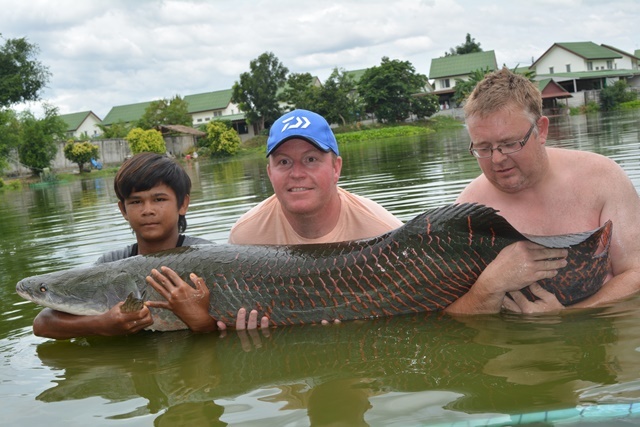 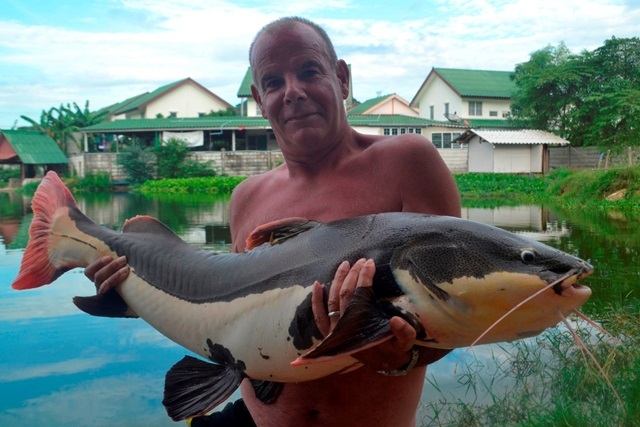 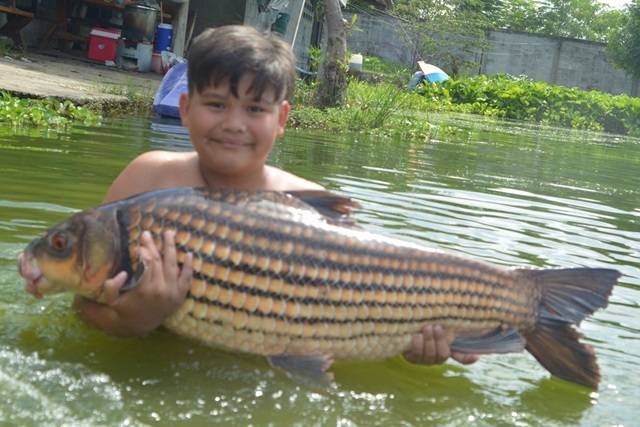 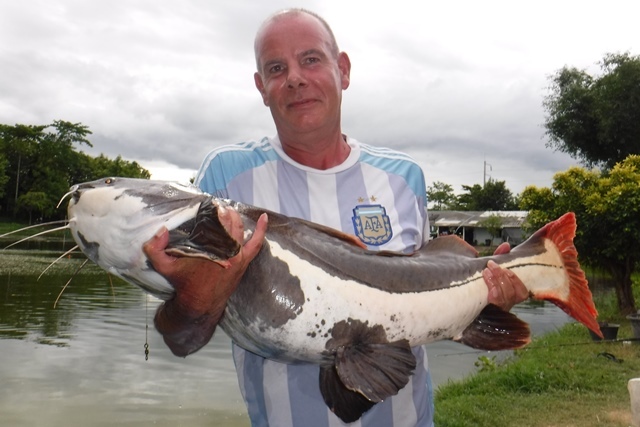 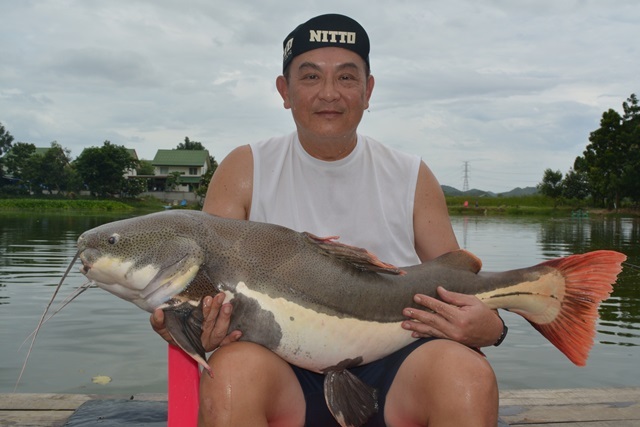 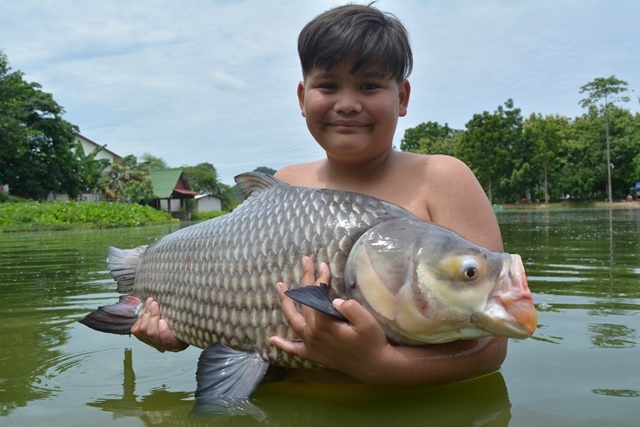 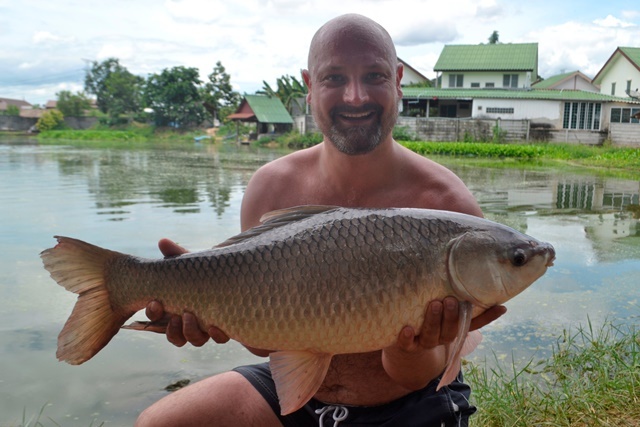 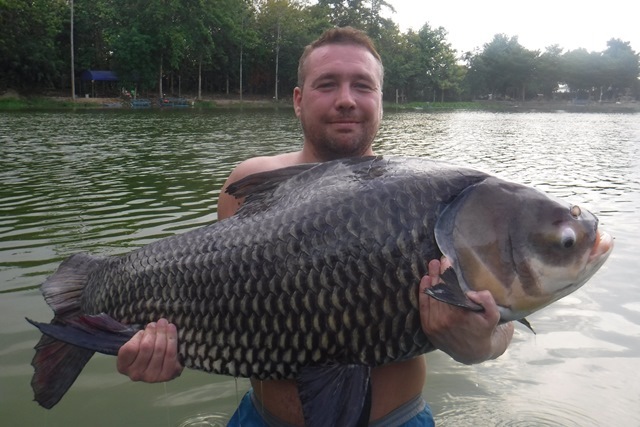 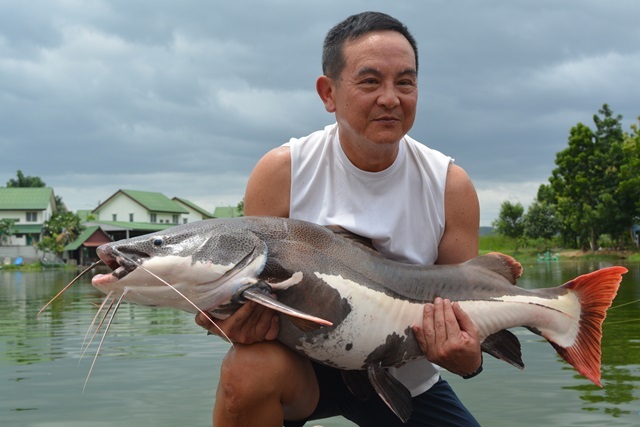 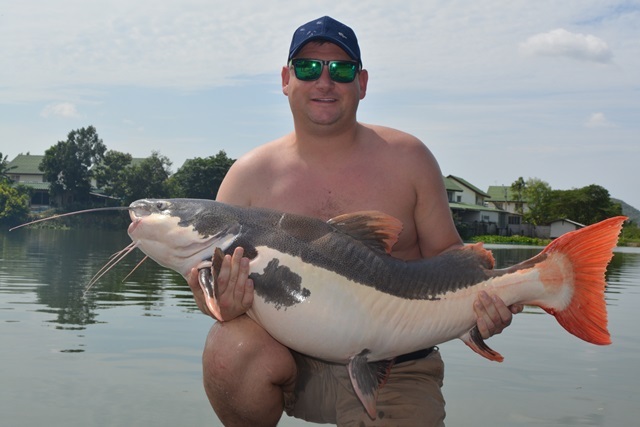 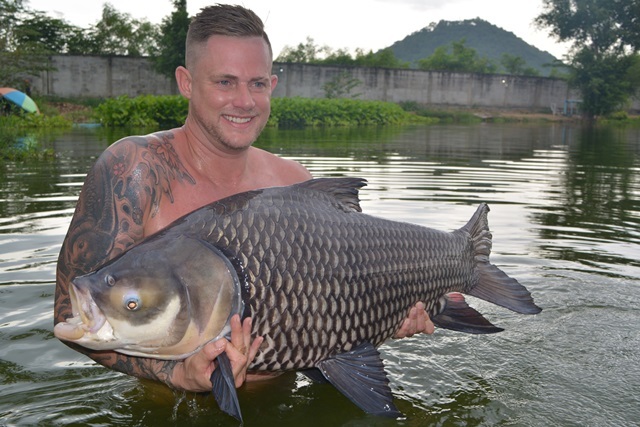 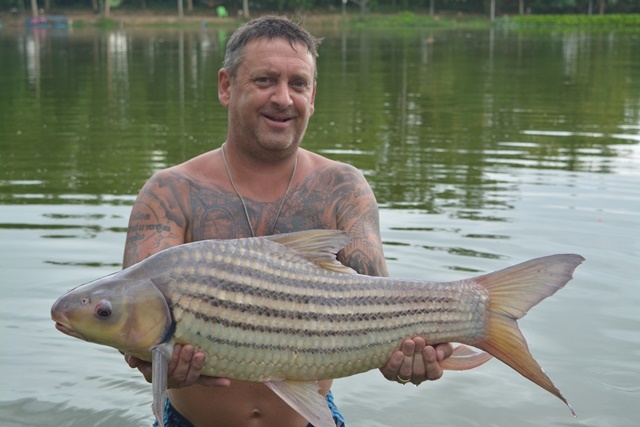 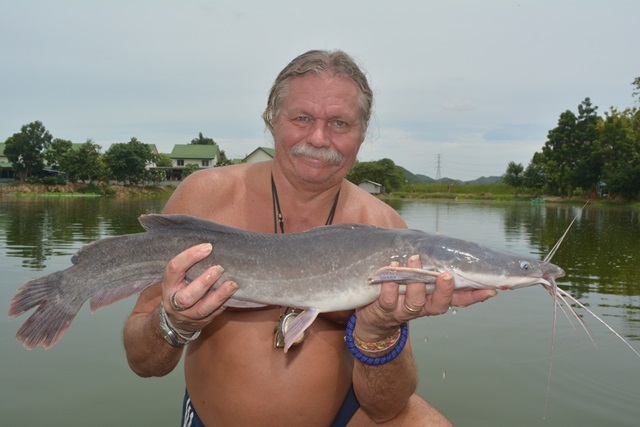 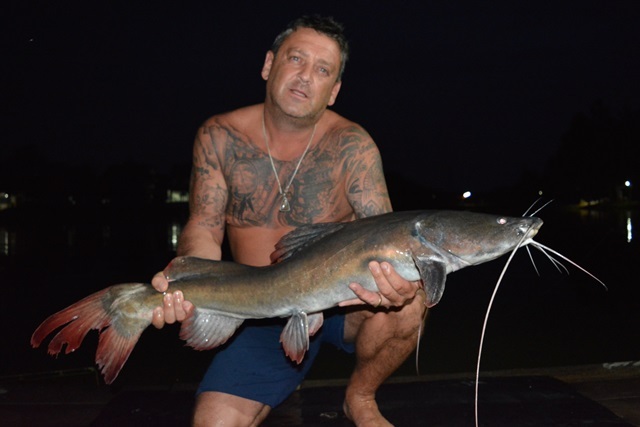 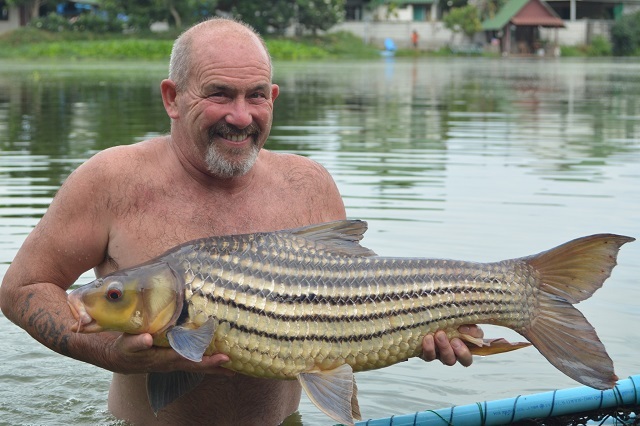 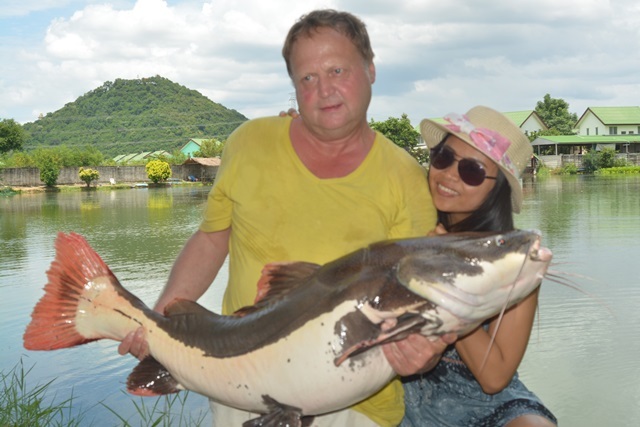 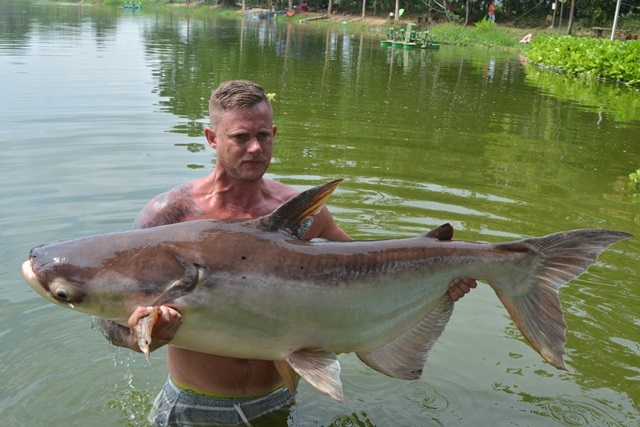 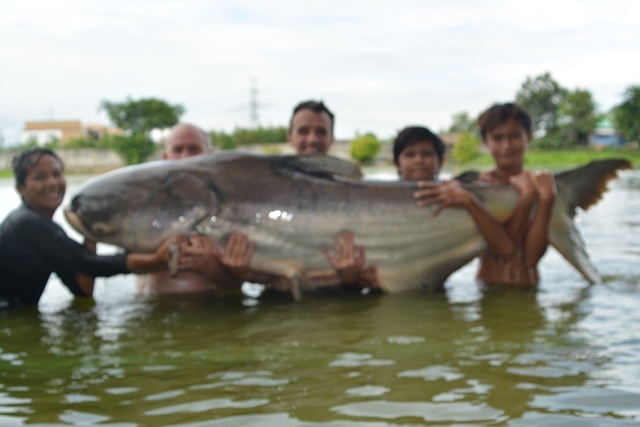 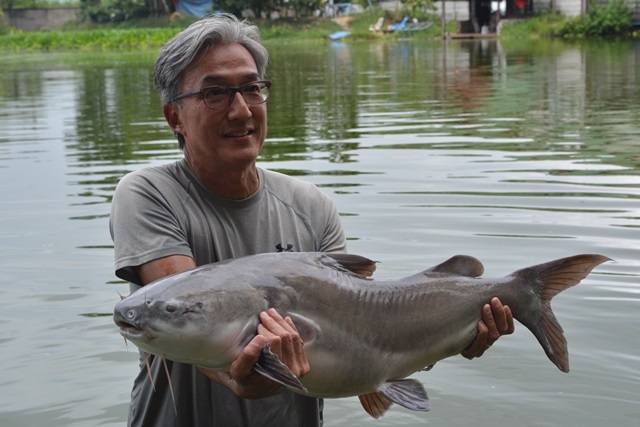 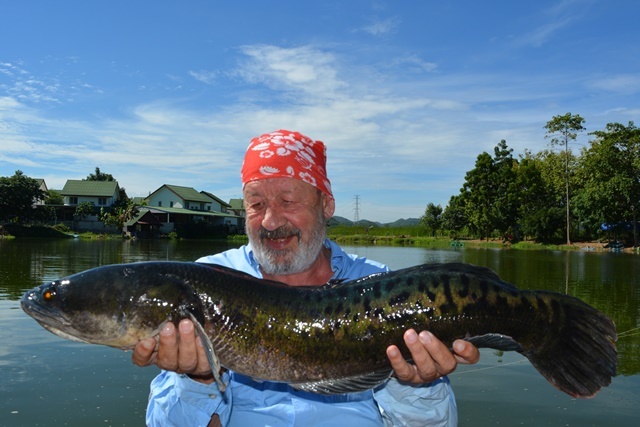 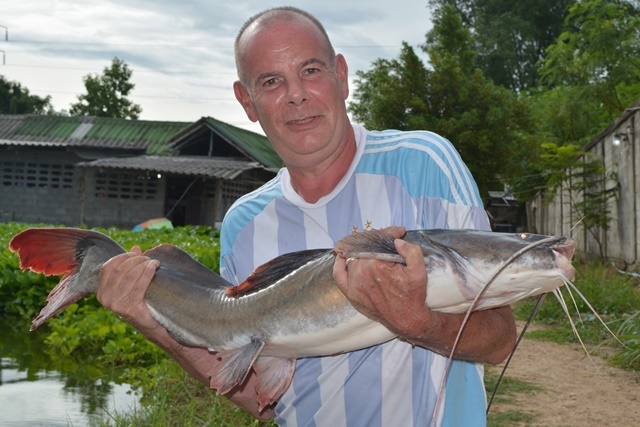 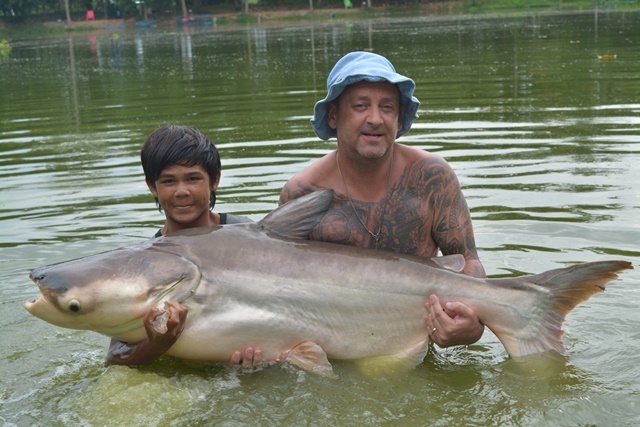 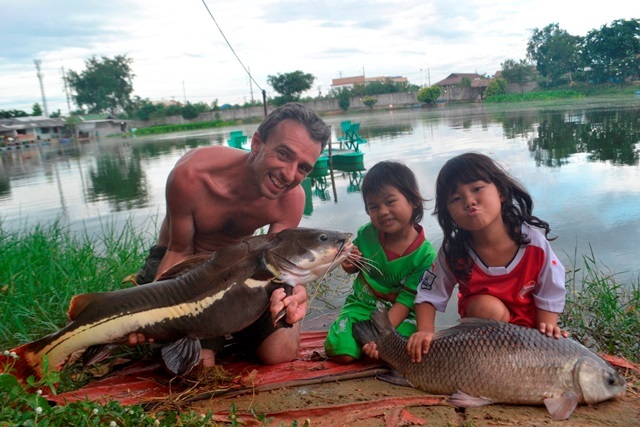 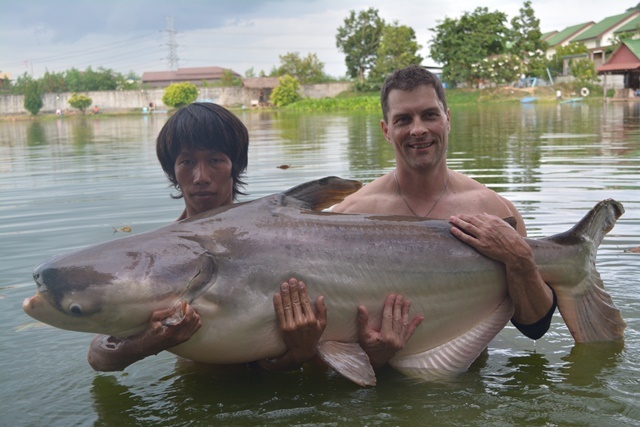 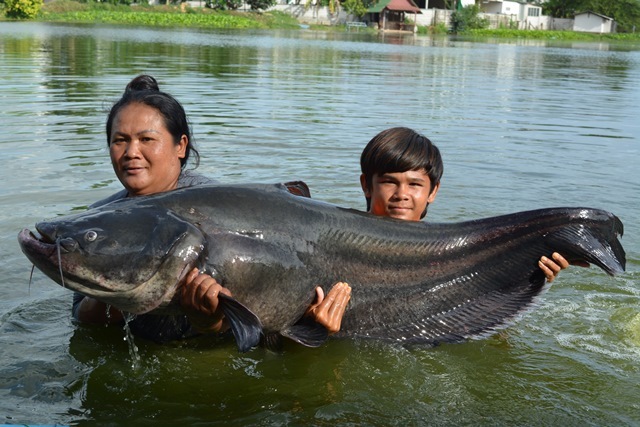 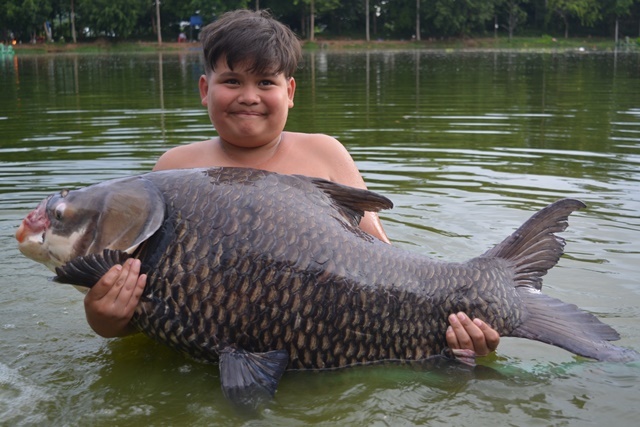 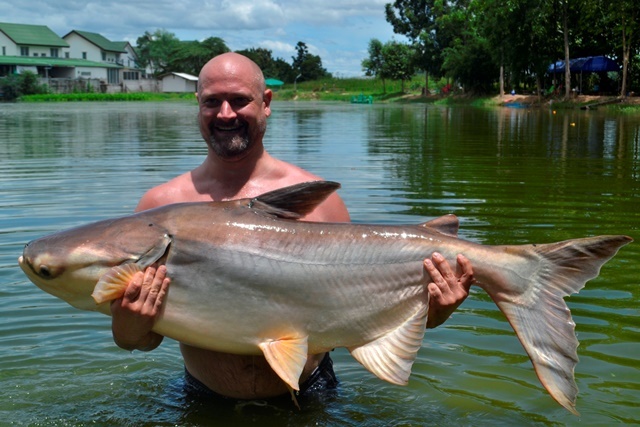 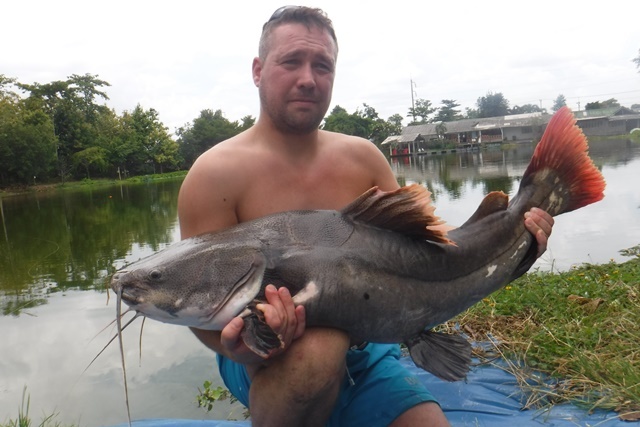 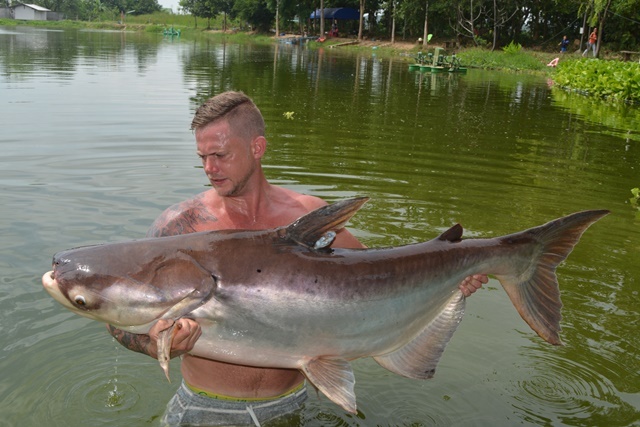 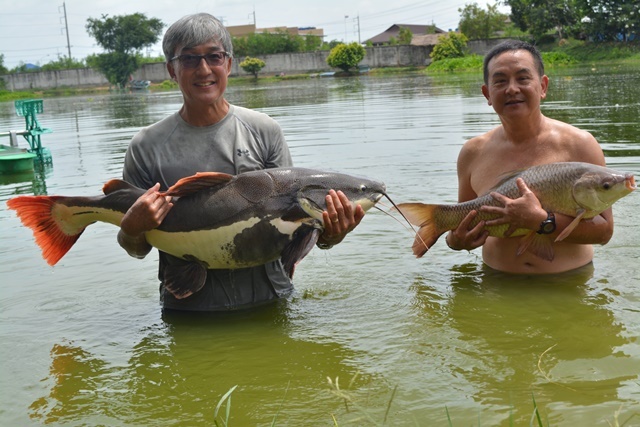 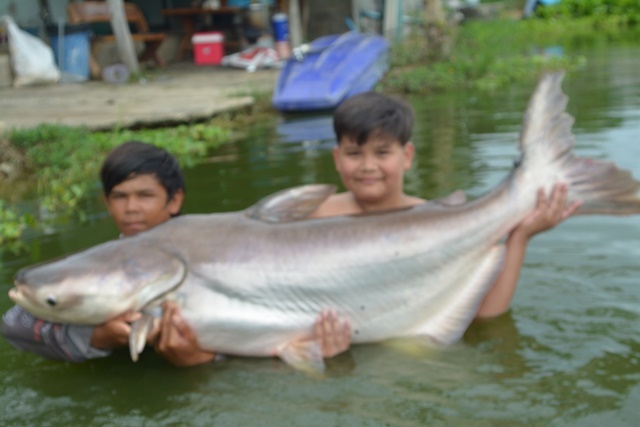 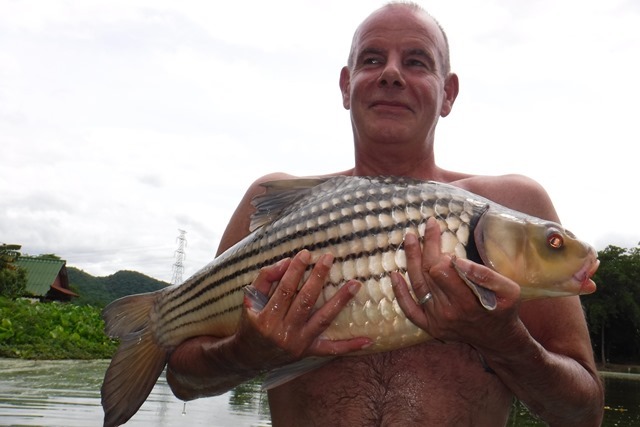 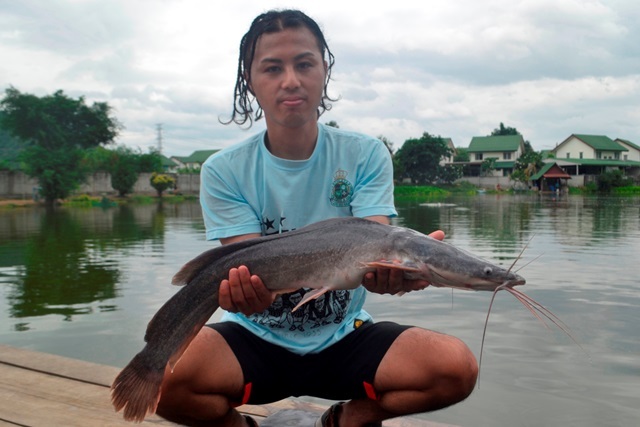 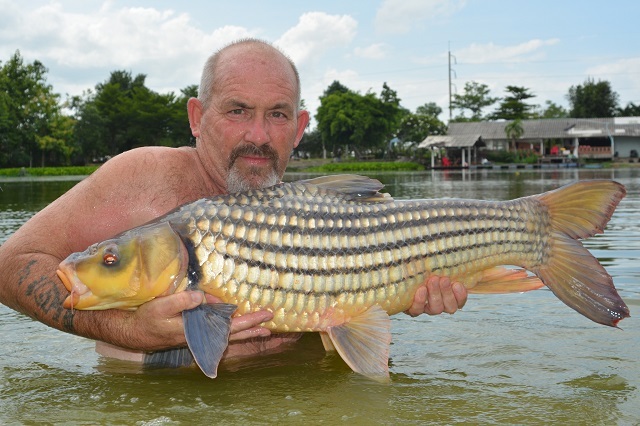 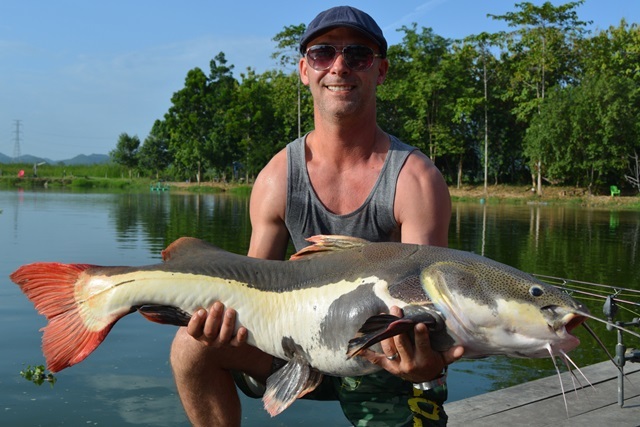 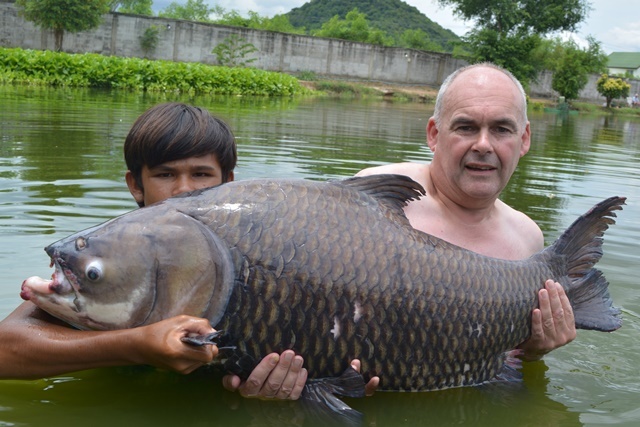 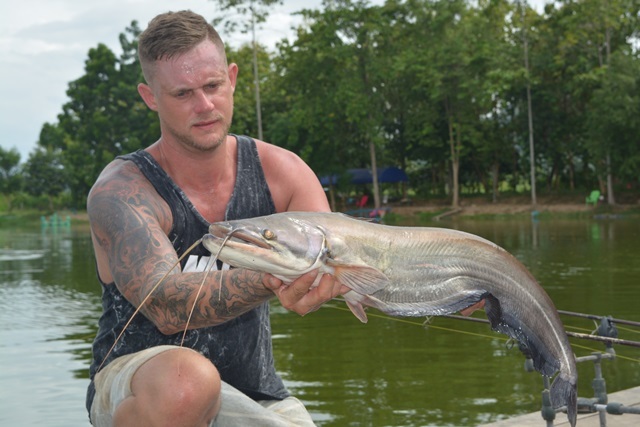 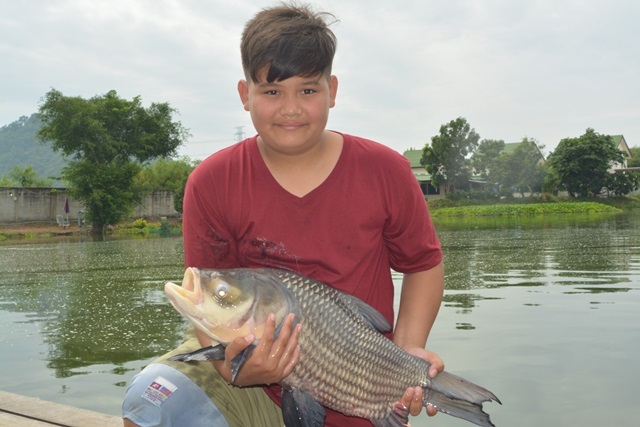 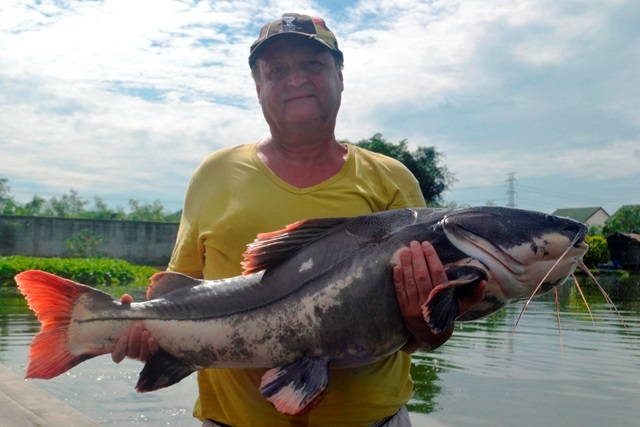 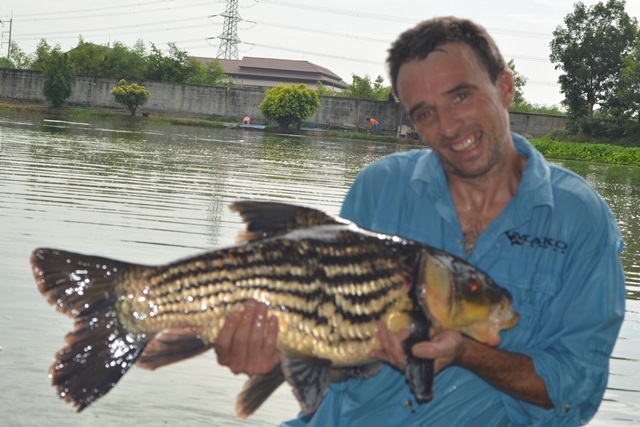 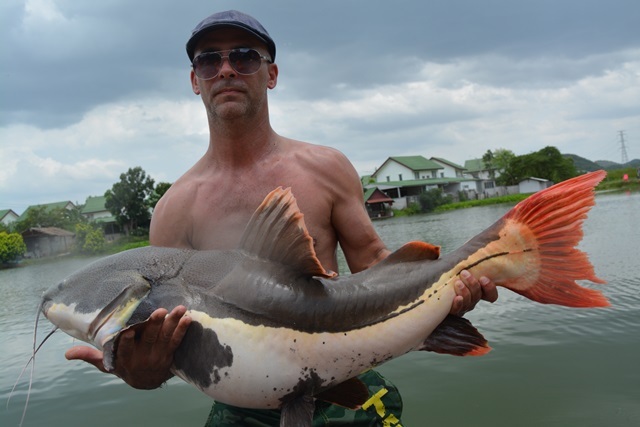 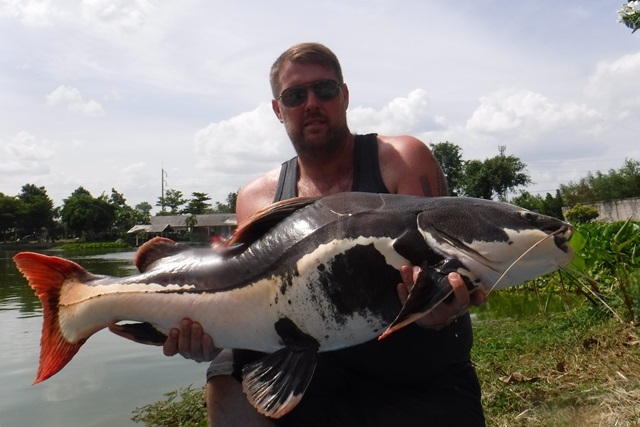 Thai resident Richy Sandys came down with his son who was visiting him from England and they had an enjoyable session catching ripsaw catfish, mad barb, Juliens golden price carp, Siamese carp, striped catfish, catfish shark, Mekong catfish as well as both Asian and Amazon redtails. 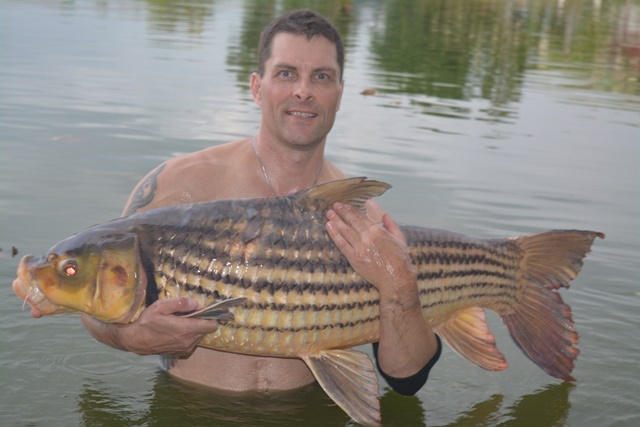 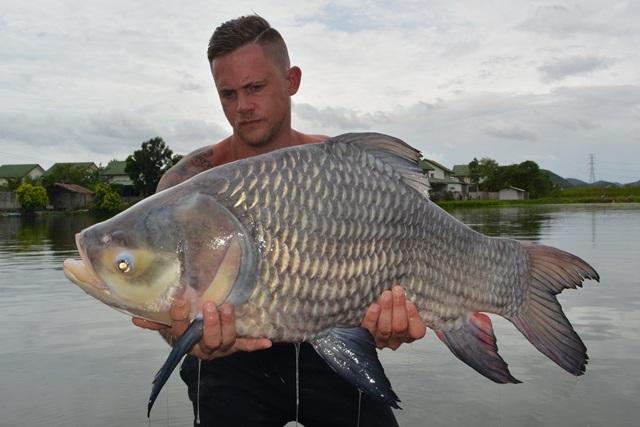 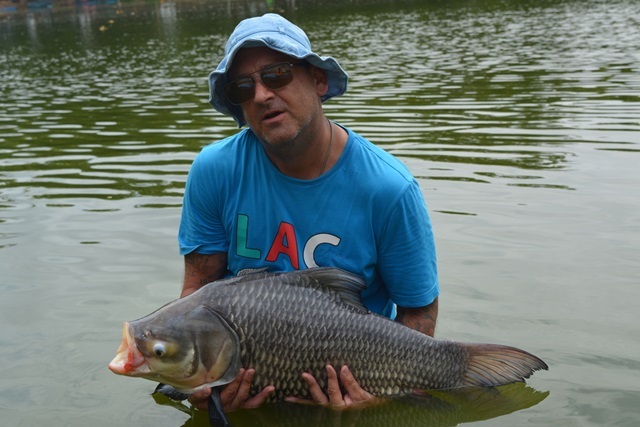 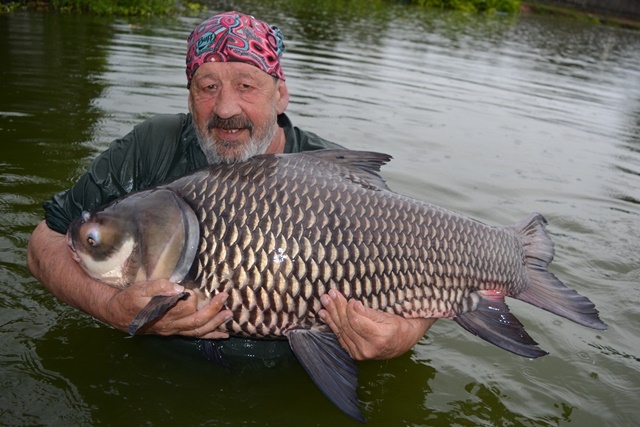 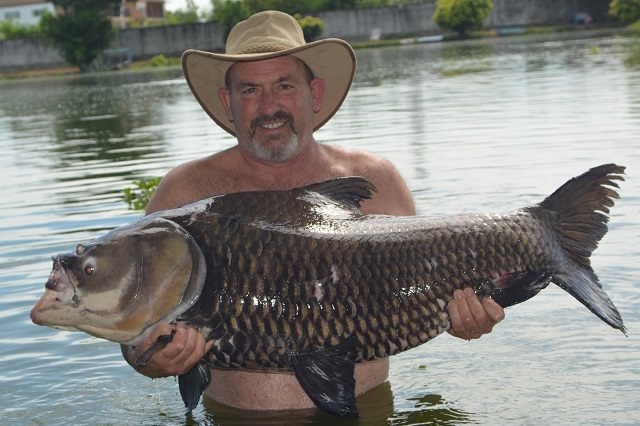 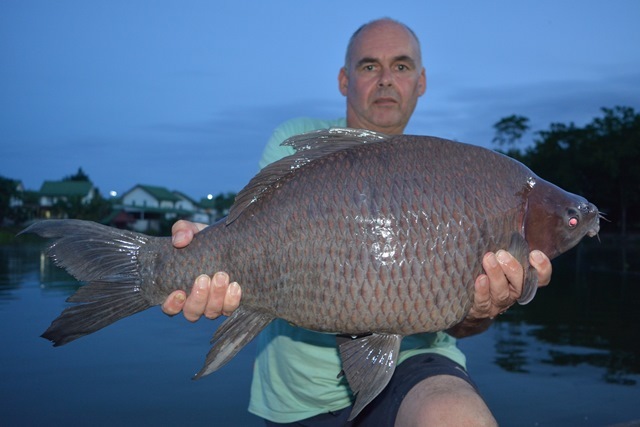 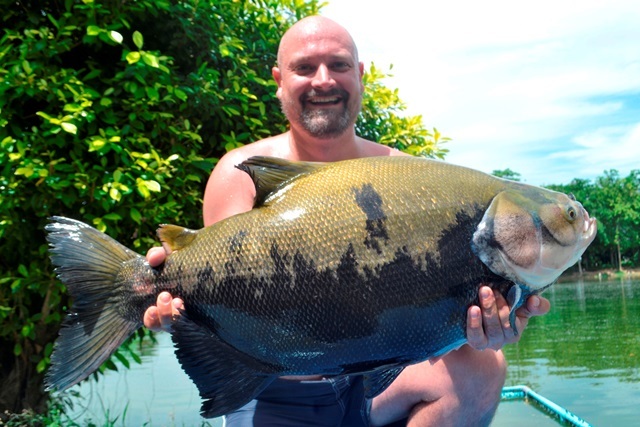 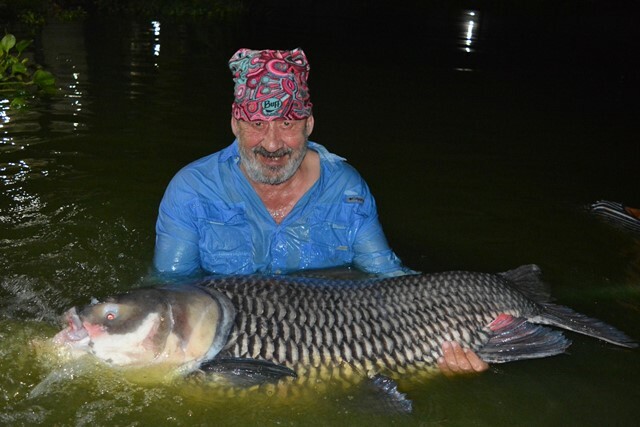 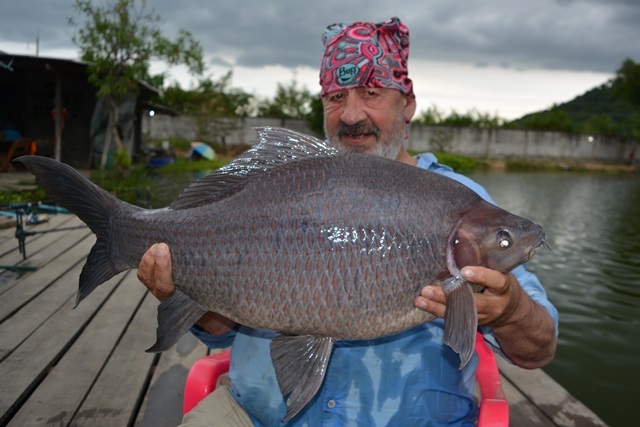 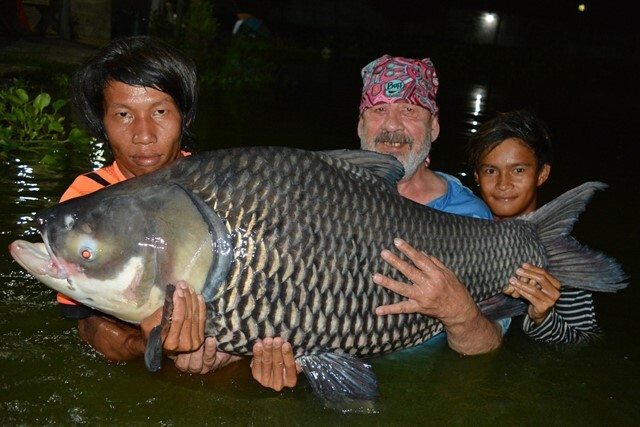 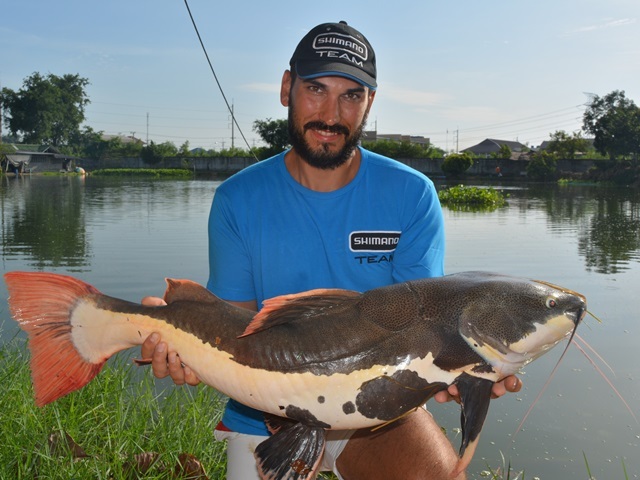 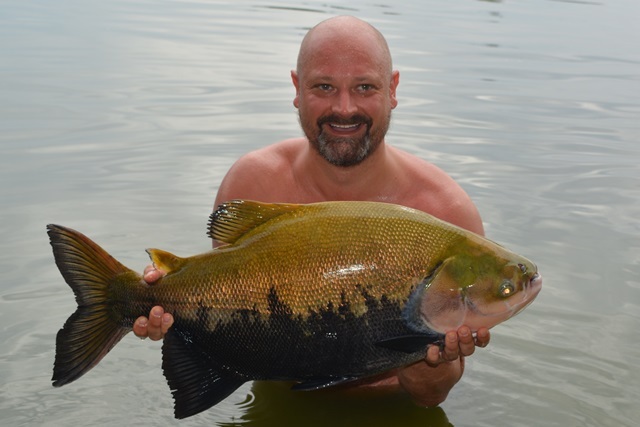 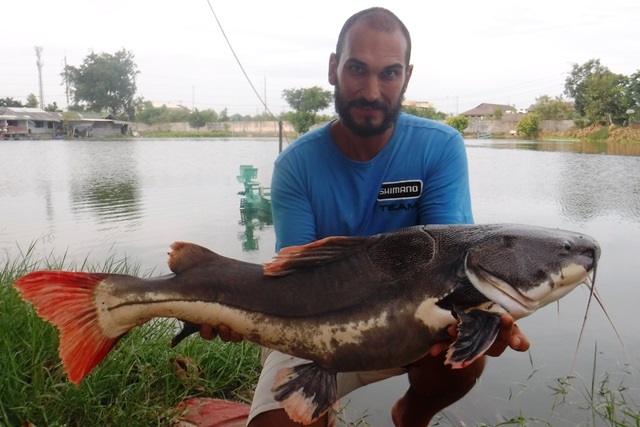 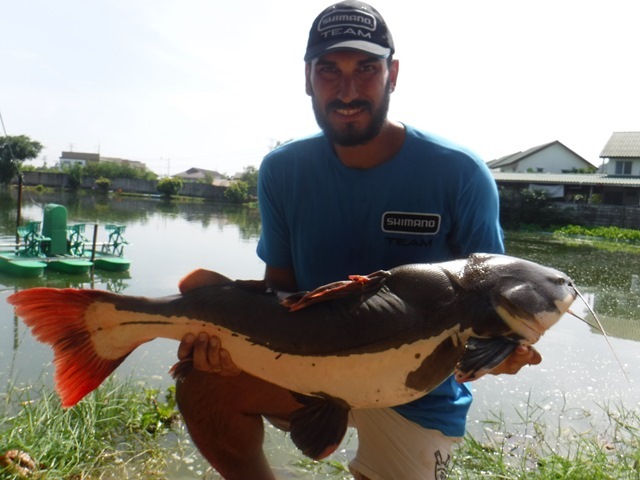 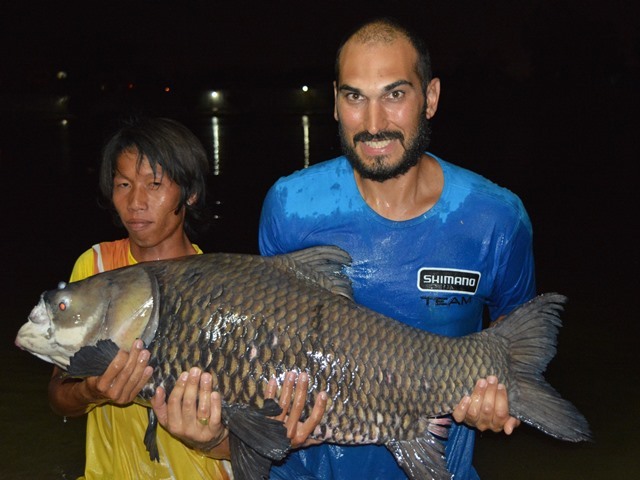 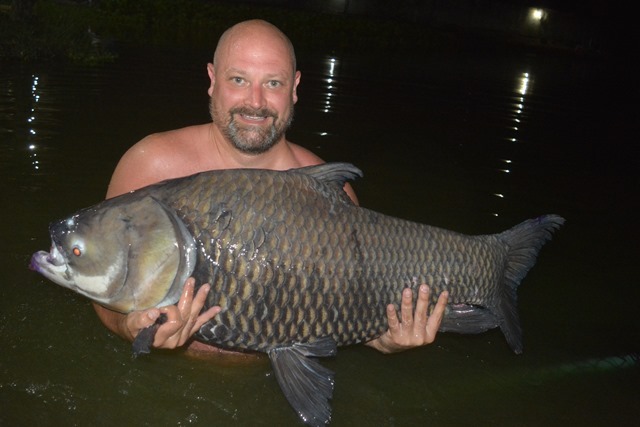 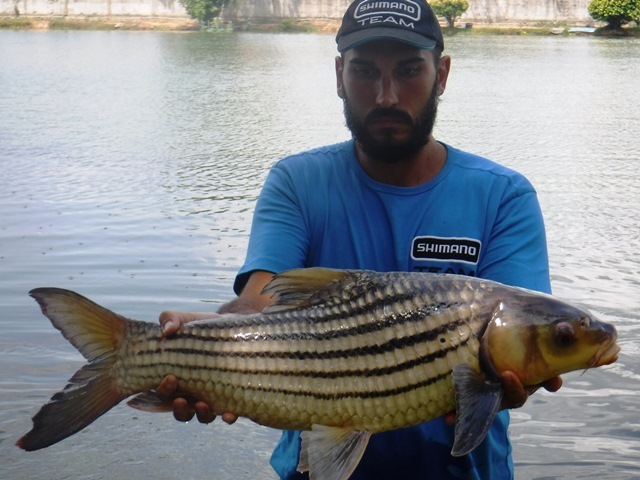 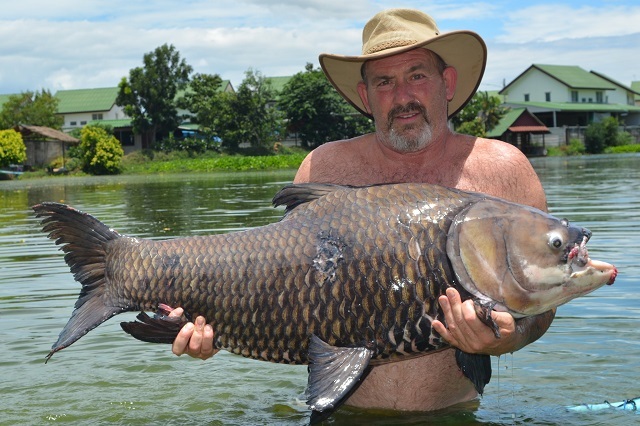 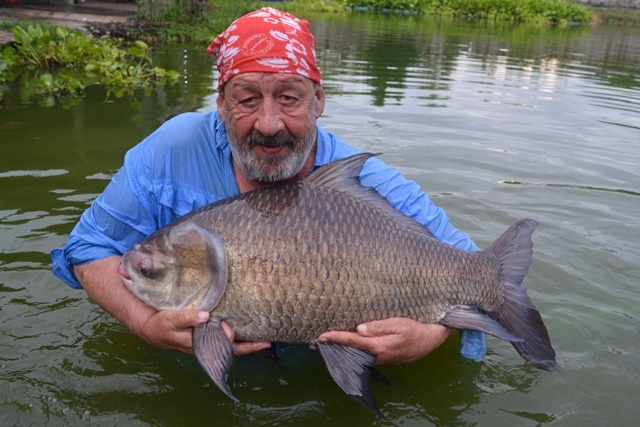 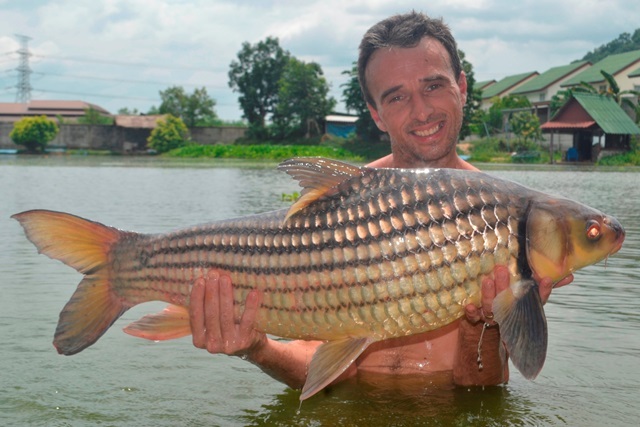 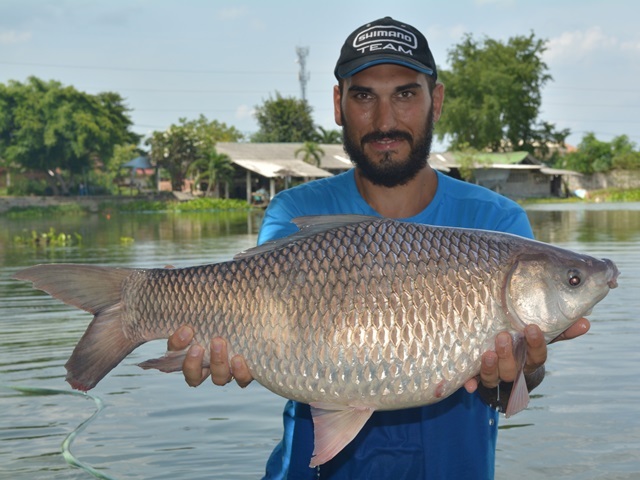 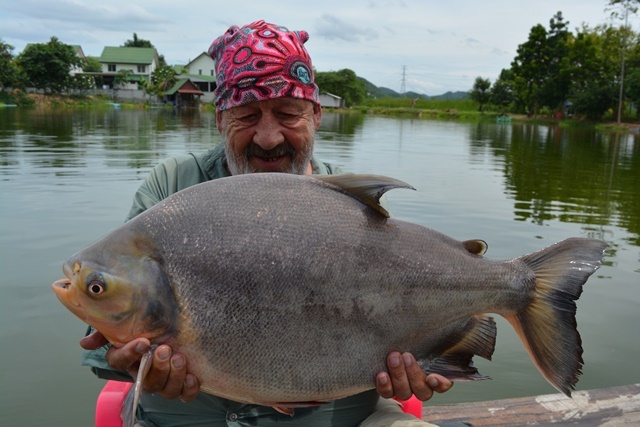 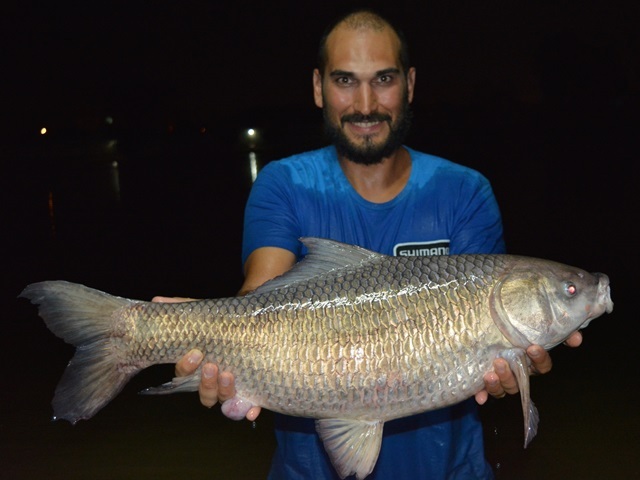 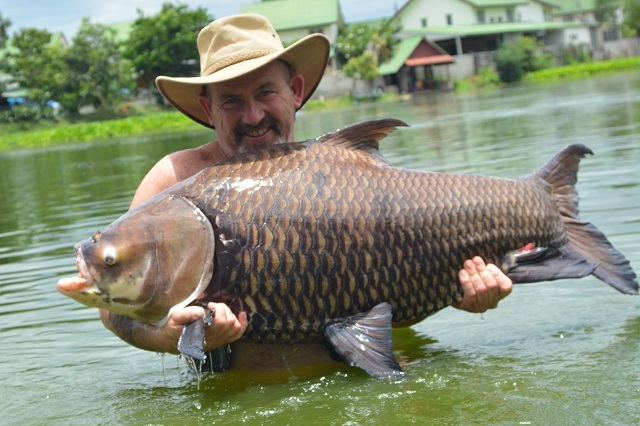 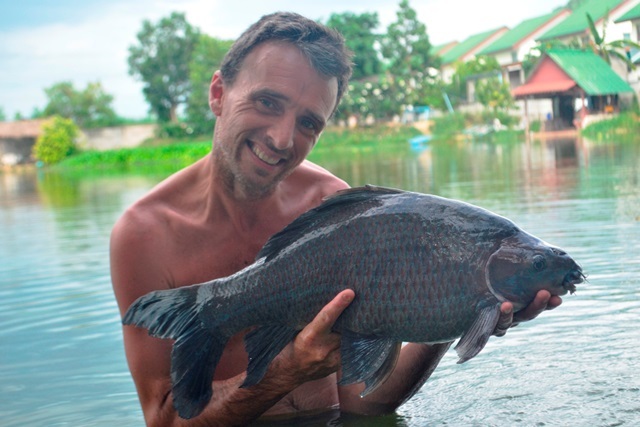 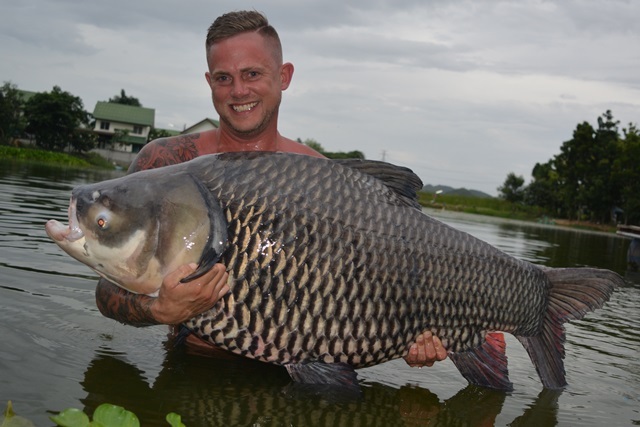 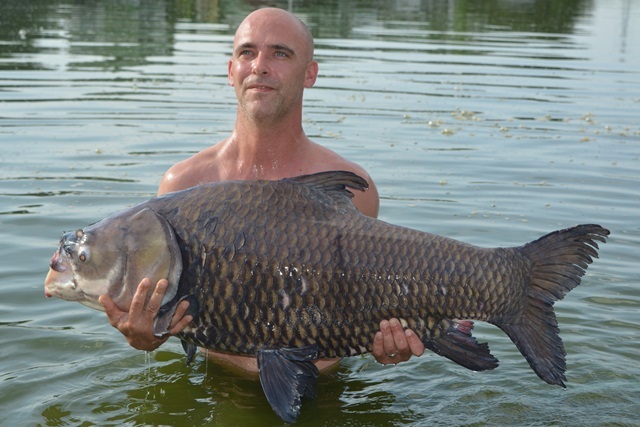 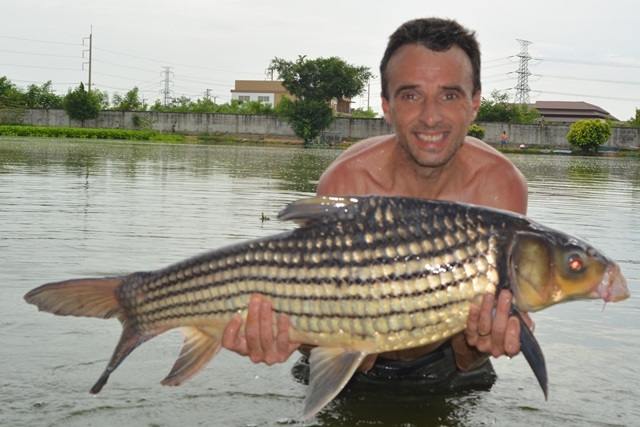 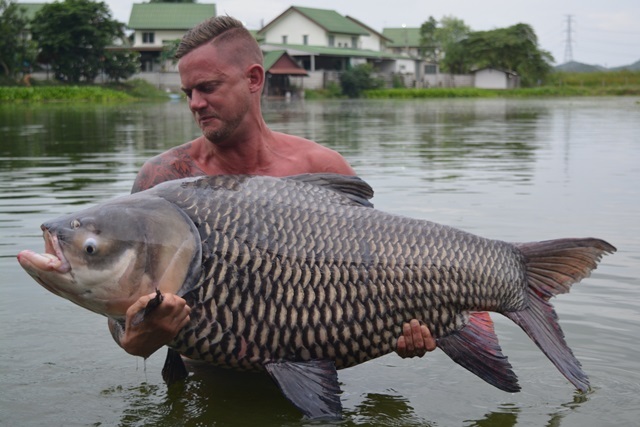 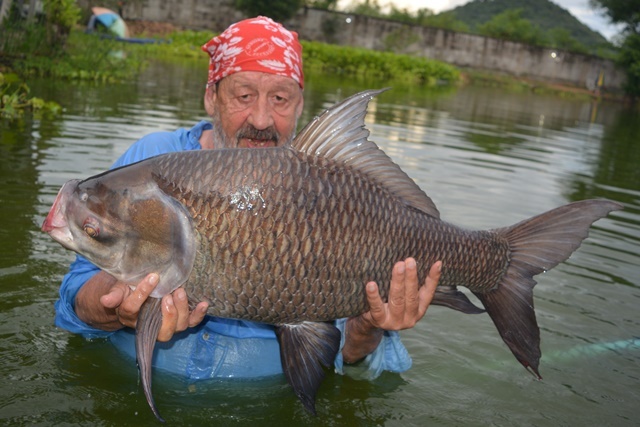 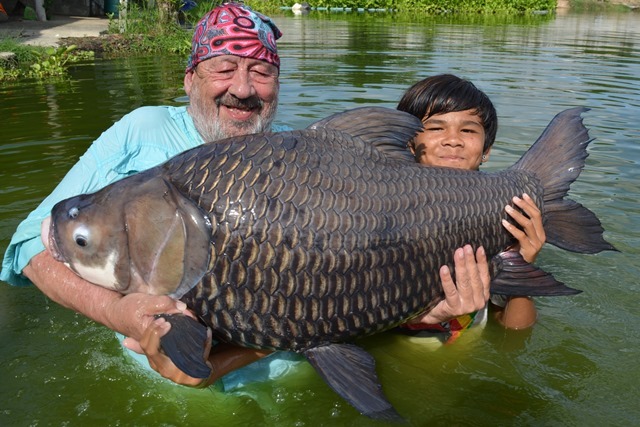 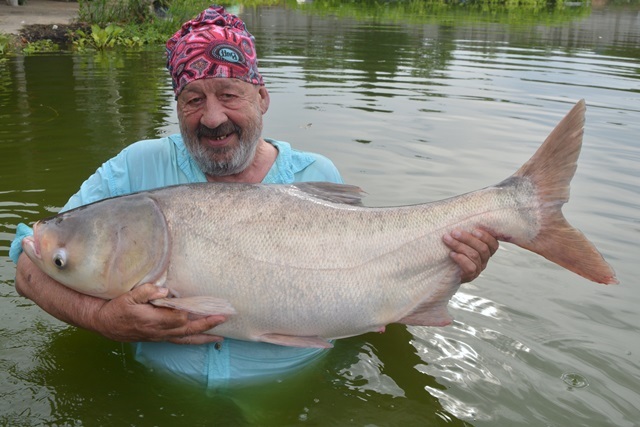 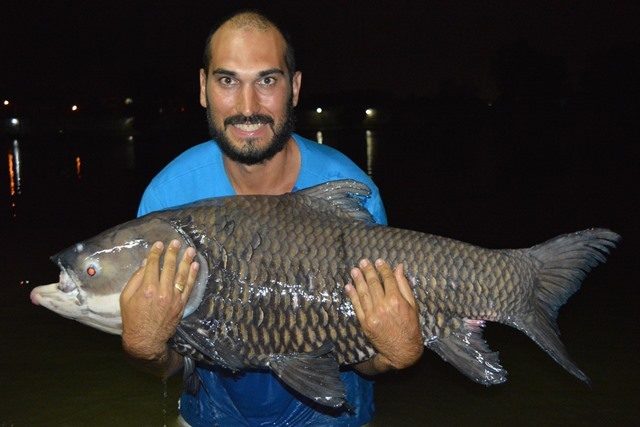 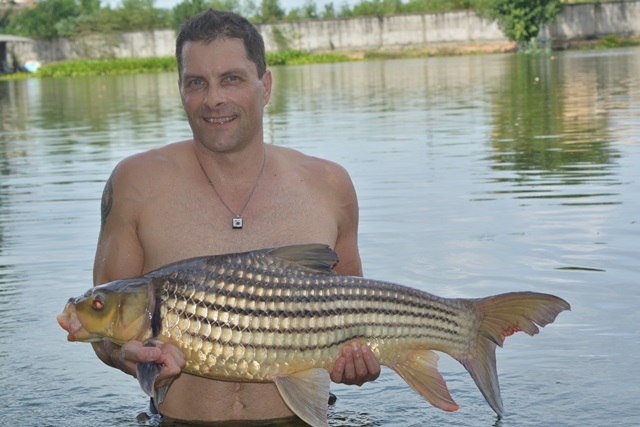 Italian angler Andrea Fava who has fished all over Thailand also visited Palm Tree for the first during the month and was more than happy with his catches of Juliens golden price carp, Siamese carp, rohu, and Amazon redtail. 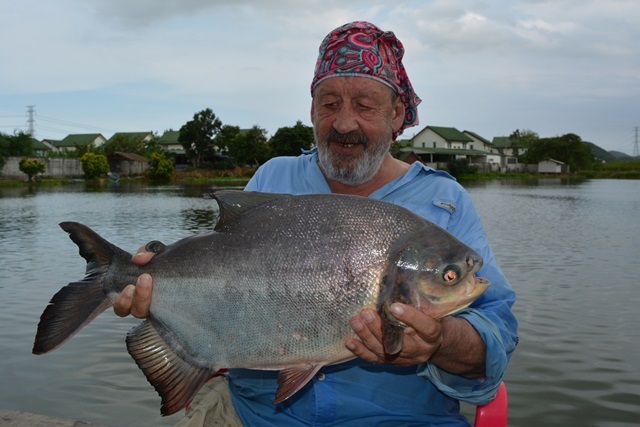 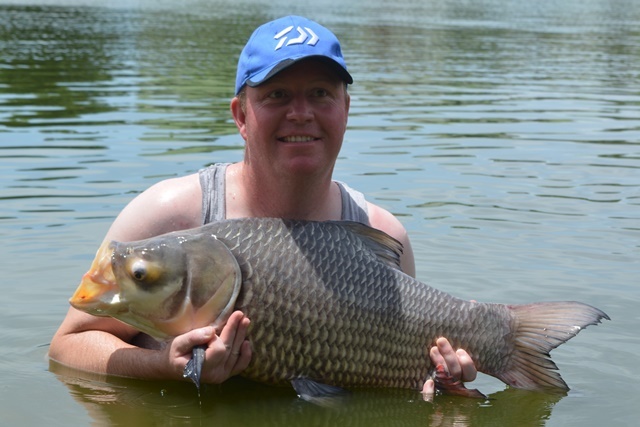 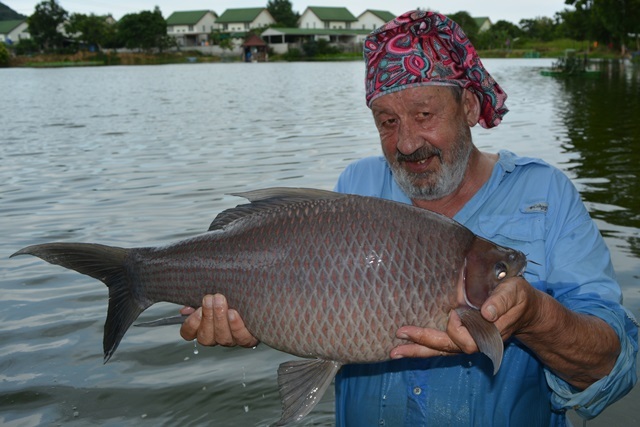 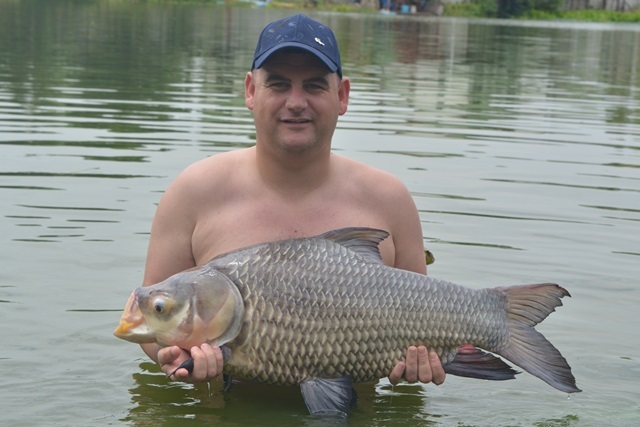 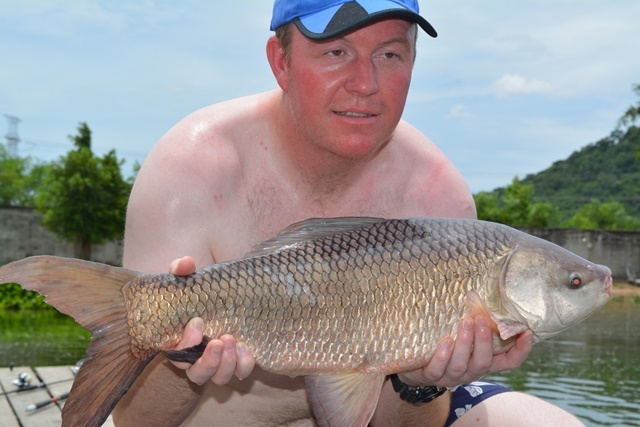 Hong Hong angler Bill Maleney was back for another session. 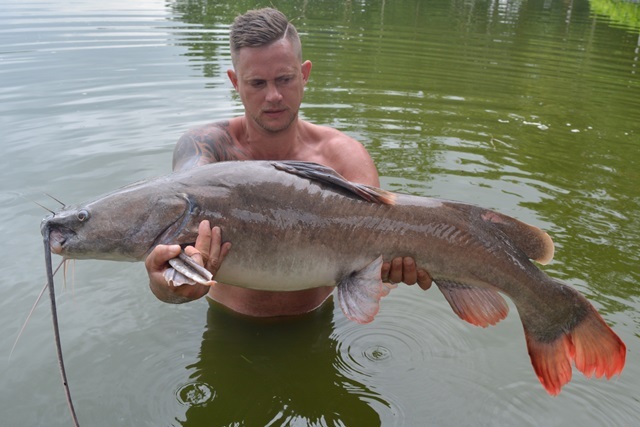 This time he cracked the 100b carp mark with a stunning Siamese of around 120lb. 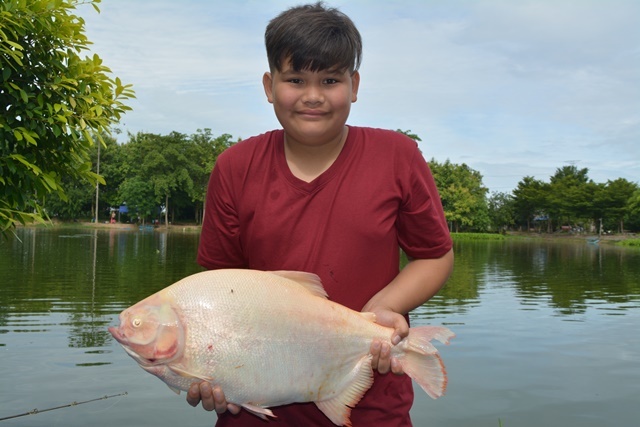 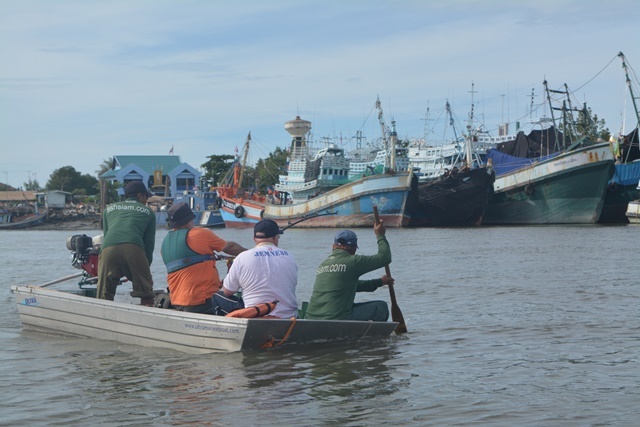 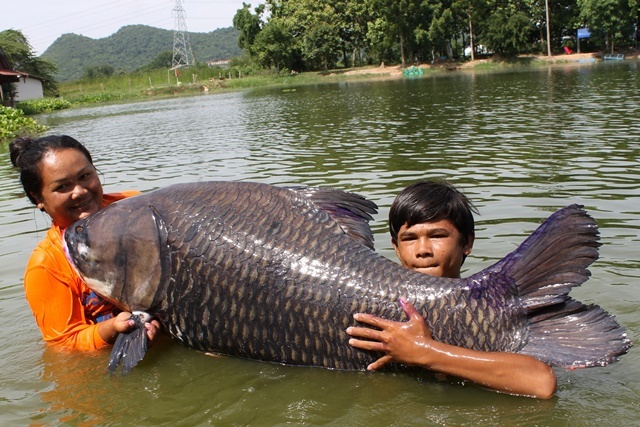 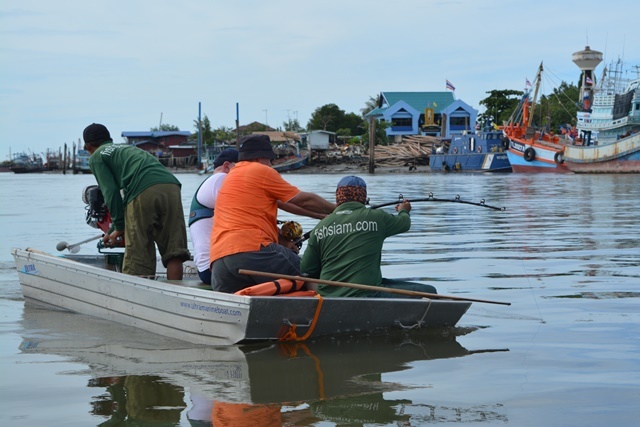 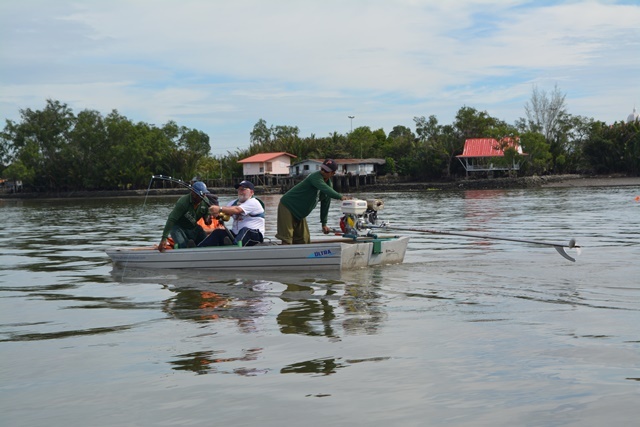 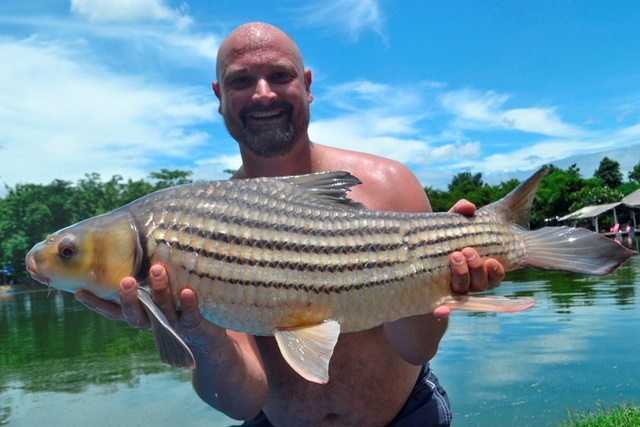 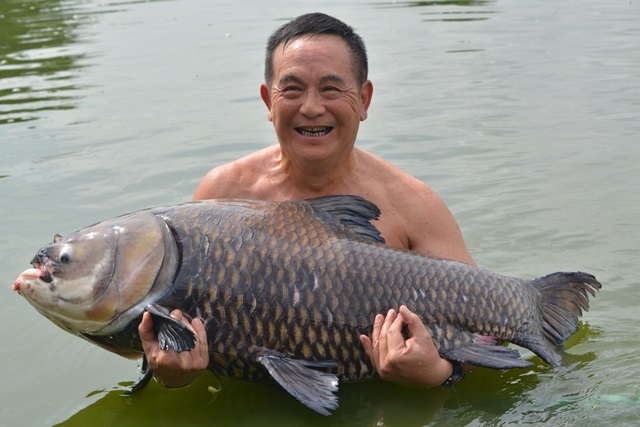 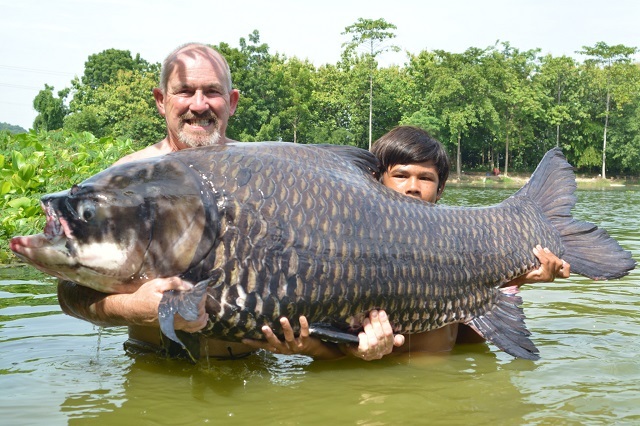 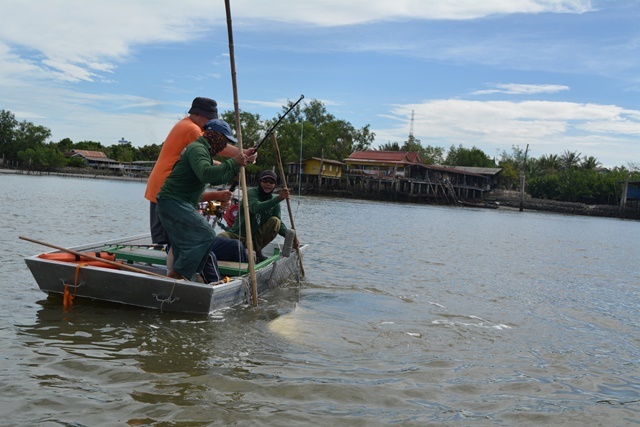 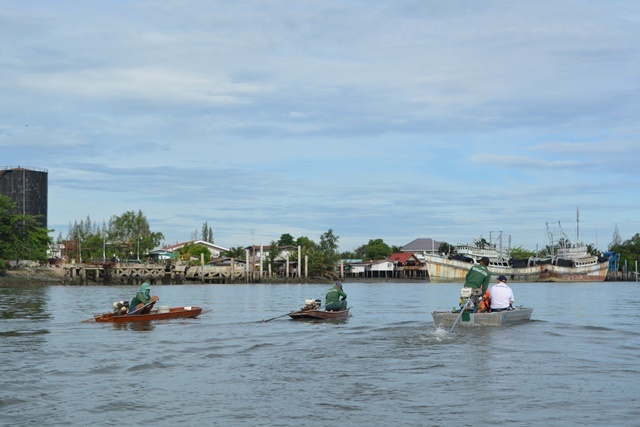 He also caught a number of other great catches that included tambaqui, Juliens golden price carp, rohu, Chinese silver carp, Chinese black carp, Mekong catfish as well as both Asian and Amazon redtails. 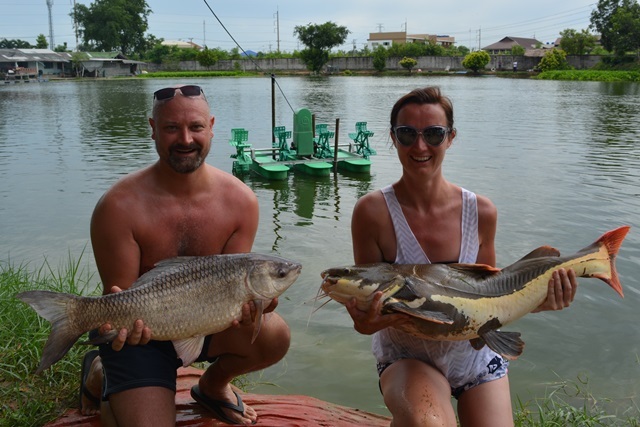 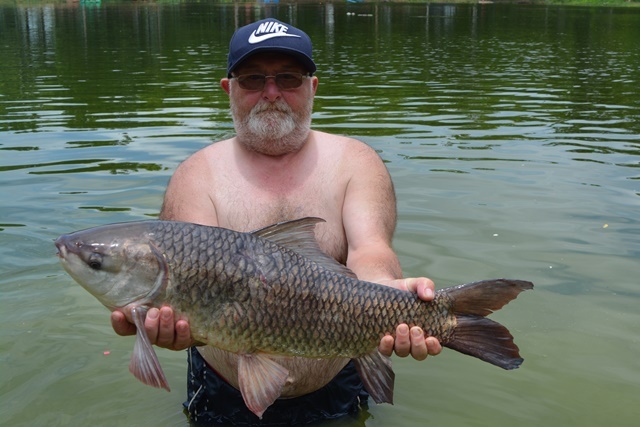 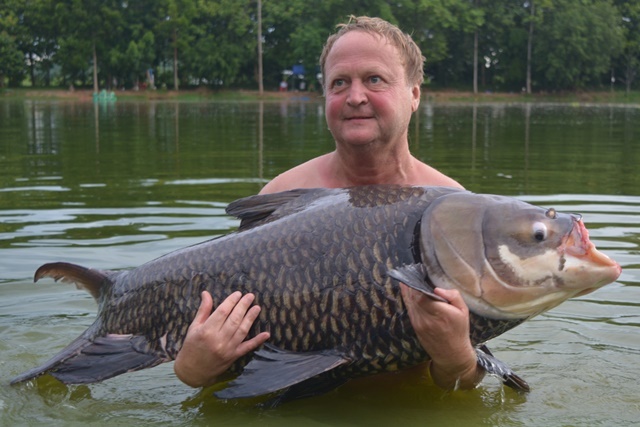 Barry Gregory brought several of his customers up during the month and they all seemed quite happy with their catches that included Juliens golden price carp, Mekong catfish, chao phraya catfish, rohu, arapaima, Siamese carp, and both Asian and Amazon redtails. 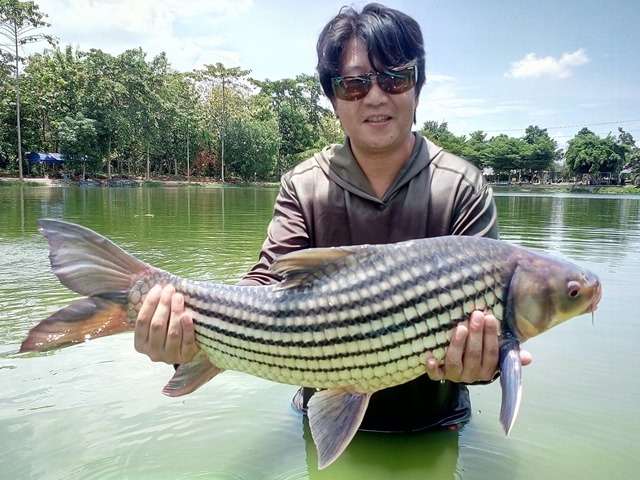 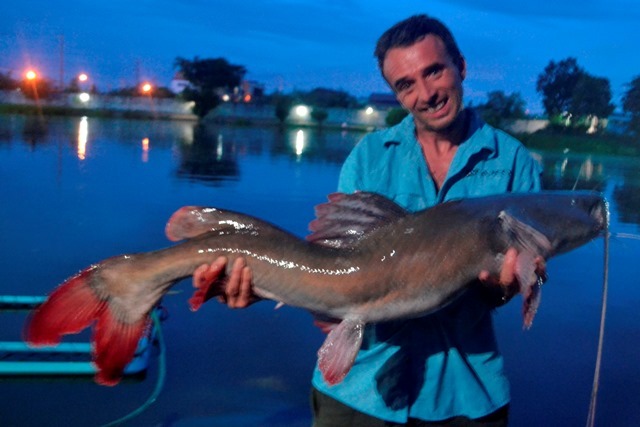 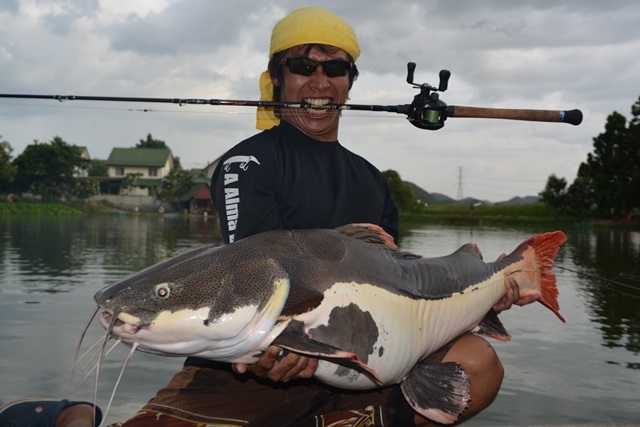 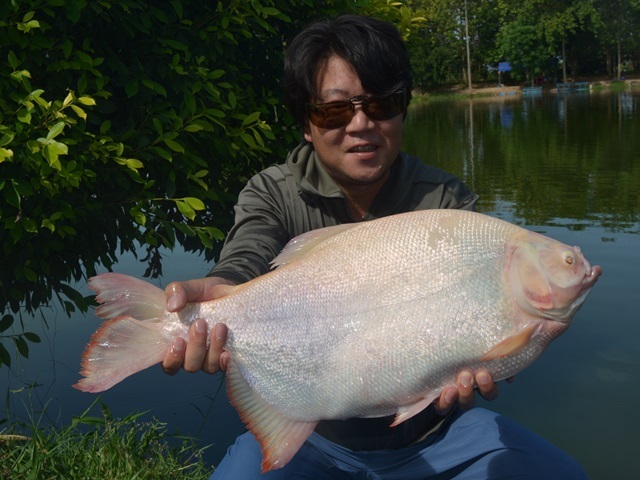 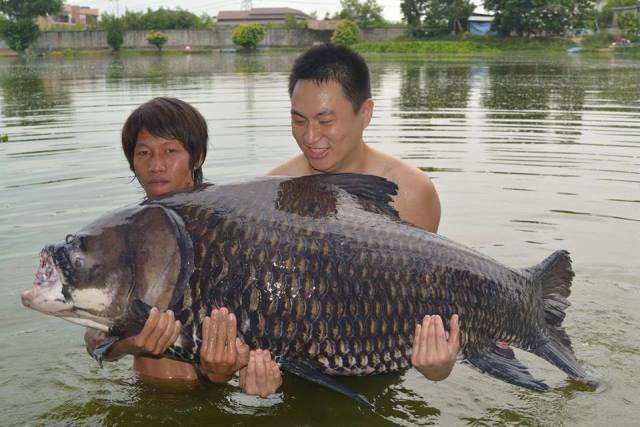 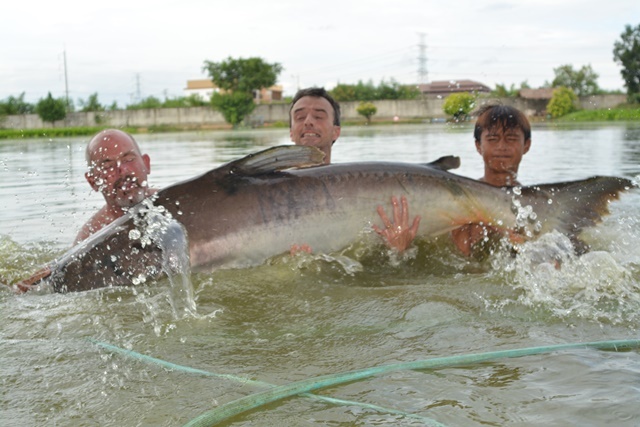 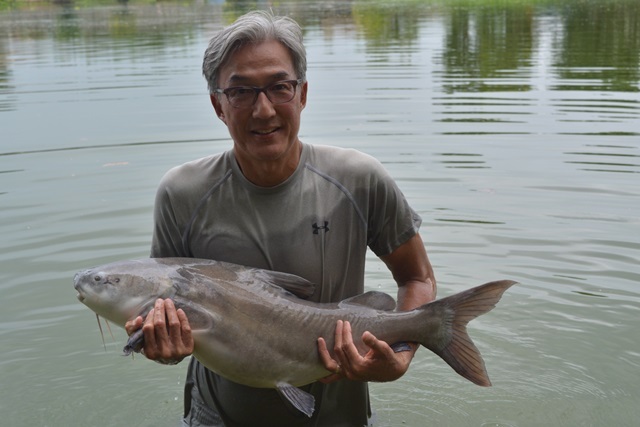 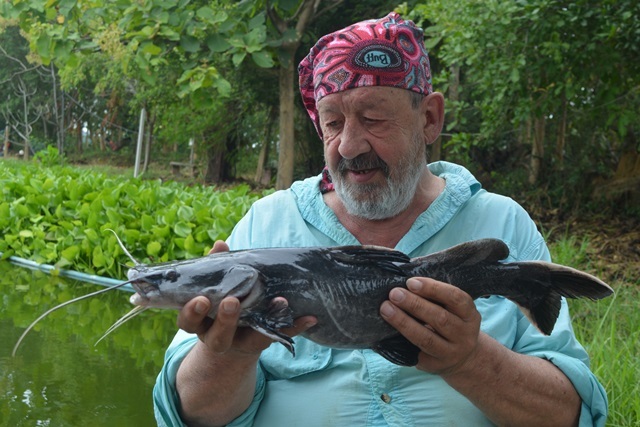 Japanese angler Shoichiro Akoa make his first trip to Palm Tree Lagoon during the month and vowed to be back after catching big-Y catfish, vundu catfish and Amazon redtail. 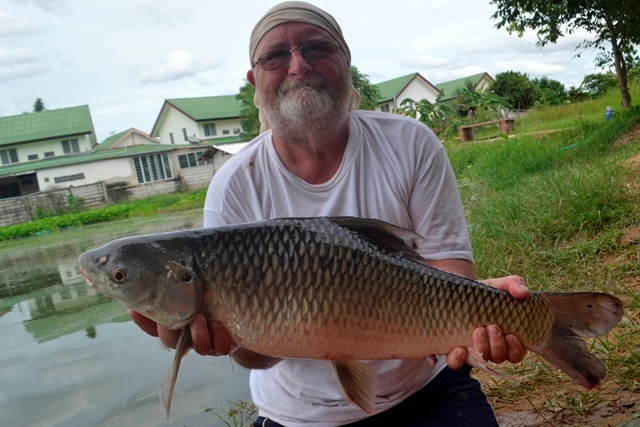 Another passing angler whose name escapes me caught a number of Amazon redtail and Siamese carp.